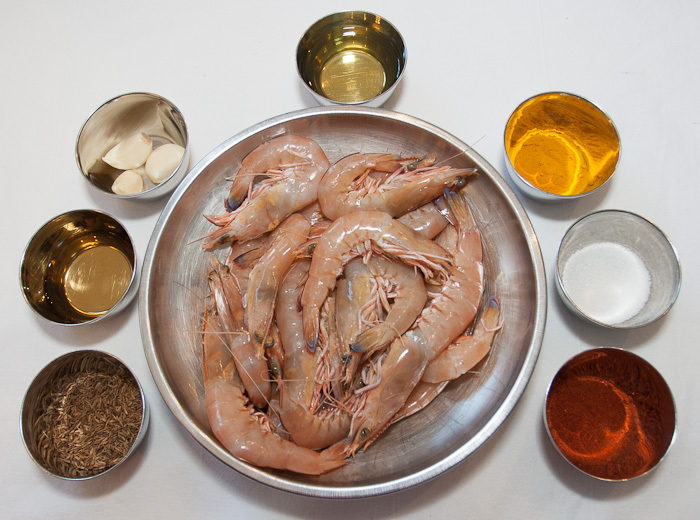 “Taraporee Prawn Patio”: Nergis’ 100-year-old prawn recipe!! Mrs Nergis in Bangalore at home! Don’t understand the title? Well then, keep reading . . . all will be explained! 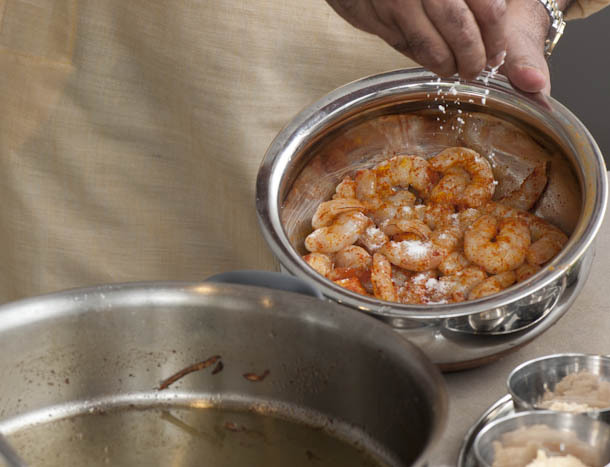 No kidding, friends, this is a once-in-a-lifetime chance to hear a 90-year-old chef from Bangalore talk about this yummy prawn dish, and I mean literally ‘talk’!! But before we do the talk, let’s answer a few questions that I’m sure you’ve got. Secondly, what’s so special about Tarapore? And, thirdly, what in the world is Prawn patio? Well, let’s answer these questions ‘back to front’, as it were, starting from the last. 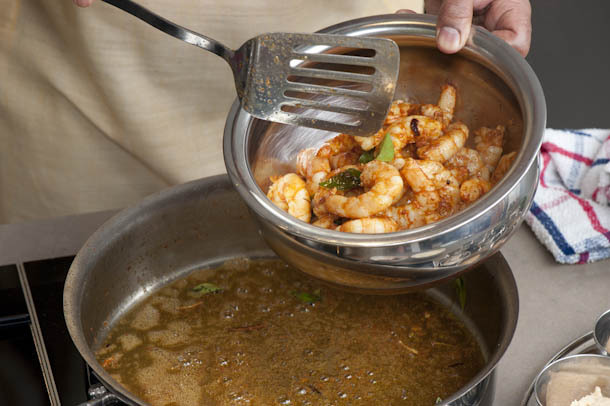 Thirdly, Prawn patio aka kolmino patio is fried prawns (in a spice mix, or masala, which uses only five ingredients besides the ubiquitous salt and oil) and the end result is the most amazing prawn dish that one can have as a side dish, or as a salad, or as a pickle, or as a main course, or as a . . . well, you get the idea . . . or, as all of the above!! Secondly, Tarapore is a small town about 100 km north of Mumbai and this is where Nergis’ family hails from. (In fact, her family are Parsis who originally came from Iran but left that part of the world when the Islamasition of Iran started , a few hundred years ago.) Nergis’ surname, Tarapore, comes from the name of the town where her family settled!! Today the town of Tarapore is a lonely one. Now there are only about five Parsis living there and they are all in aged-care centres. Most other Tarapore residents have left and are now living in different parts of India – as well as the rest of the world! Which brings us back to our first question about who Nergis is. So, let me introduce you properly to this wonderful lady. 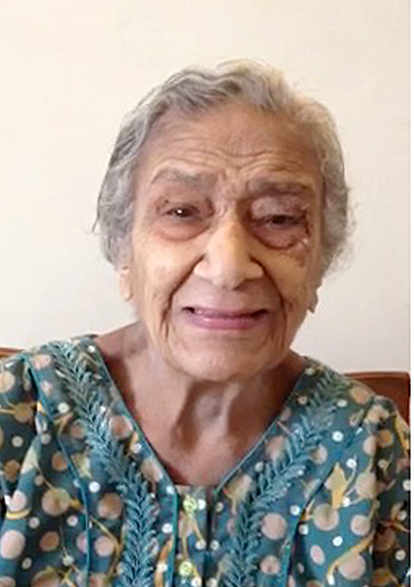 Nergis was born in Madras in 1922. She moved to Bangalore when she was 29 years old. She married Mr Dalal and has seven children. She also has, as you can imagine, lots and lots of grandchildren and even more great grandchildren! When she was young, girls were not encouraged to study (which still makes her furious to this day) but that did not stop Nergis from becoming a nursing aide in St Martha’s hospital in Bangalore. She was a very active social worker and she was also heavily involved in teaching English language to poor and destitute kids who would otherwise have never been taught. Nergis has also helped many relatives and elderly people depart from this world with dignity who would otherwise have received no support whatsoever from society or the local government. “My Mum is the most amazing person,” says her daughter, Ivy, with great pride. She then goes on to add that she is also an incredible cook!! Well, you know me, folks. That grabs my attention even more. Someone I can admire and someone whose brains I can pick about food. Well, there’s no doubt about it, Ivy. The dish I made last night following your mum’s recipe had my neighbours complaining about the kitchen exhaust not working!! 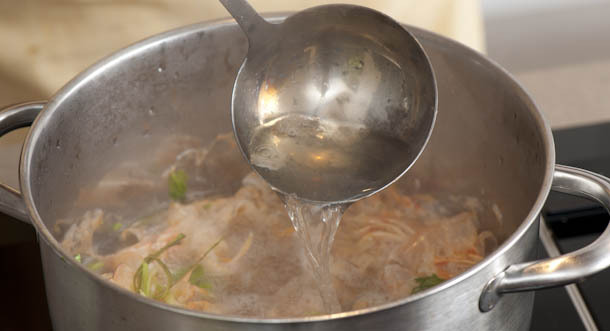 No, that’s not a negative thing, it’s a positive thing as the aromas of the cooking were out of this world! I think it’s so important to keep alive the oral tradition of cooking. 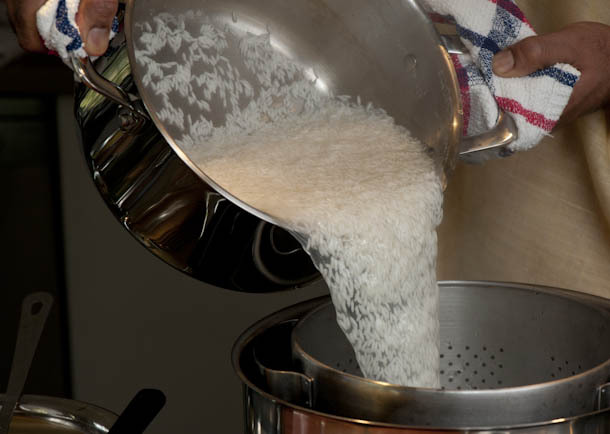 It’s how family recipes were passed down from one generation to the other. 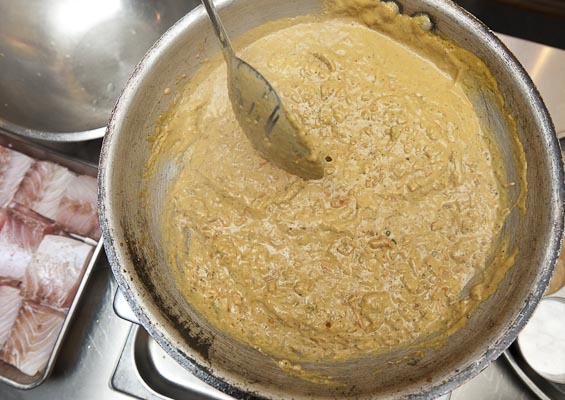 I still remember my mother’s aunt would ‘talk’ the recipe of puda chi wadi as she cooked it. I’d like to have all these wise people tell us about some dish that’s important to them in some way, whether it’s because a dish reminds them of their childhood, or because it reminds them of their village, or of a loved one, or because it reminds them of a particular incident , or whatever the reason. We should share these testimonies and I hope you enjoy this dish as much as I do. 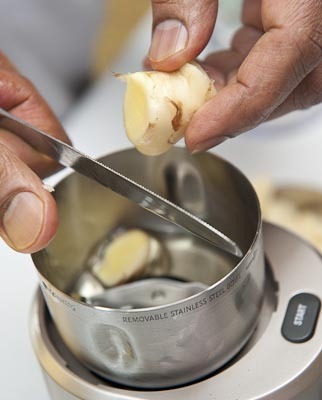 Experience, like cooking from the heart, is not something you can ever put a price upon. No Dollar, no Rupee!!! 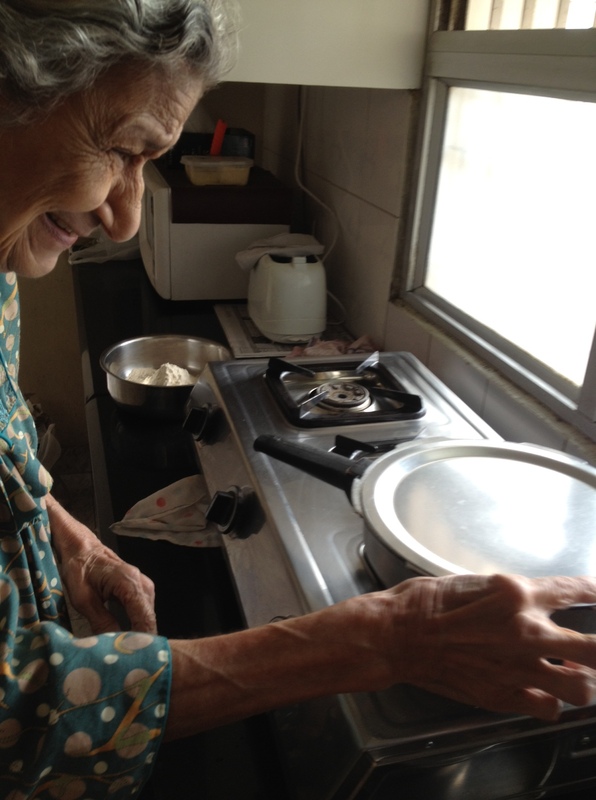 Nergis at the stove and very much ‘at home’!! 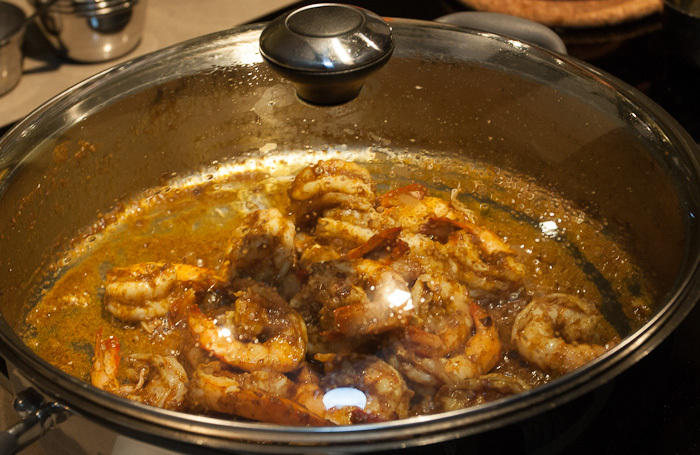 Well then, now that we have seen the video and heard all that Nergis has to say about this ancient prawn dish (kolmino patio), it is time to enter the kitchen. 1. 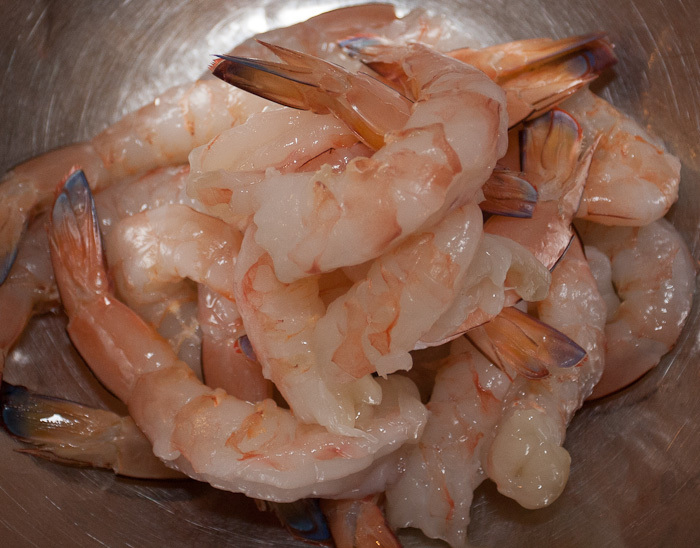 Remove the shell from the prawns, devein and refrigerate. 2. 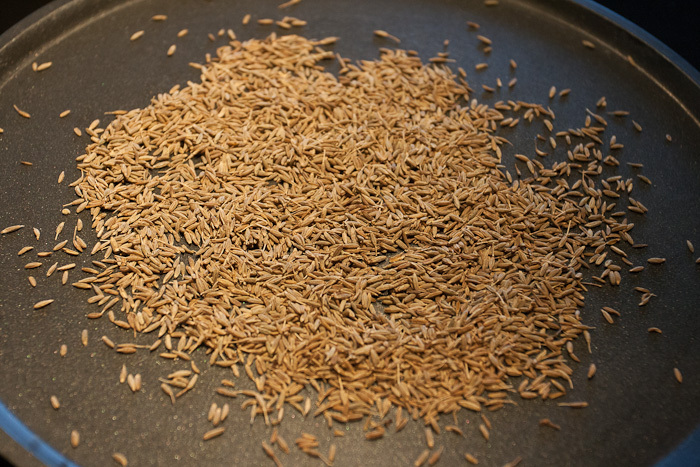 Roast the cumin seeds and let cool. 3. 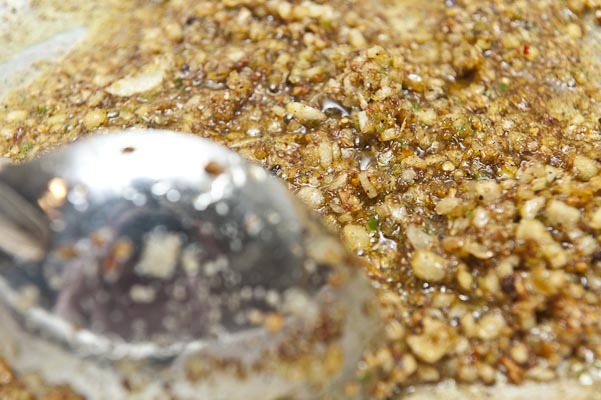 Grind the cumin seeds, garlic cloves and brown vinegar to a fine paste. 4. 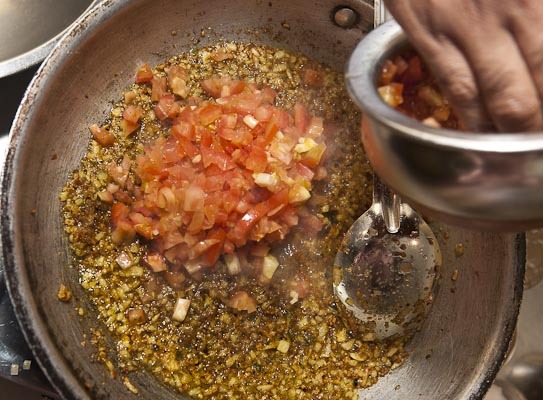 In a pan, add the oil and immediately add the spice mix (masala). 5. 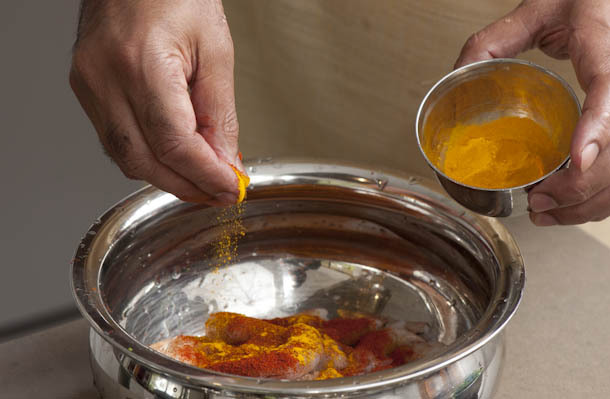 Add the turmeric, chilli powder and salt to the masala. 7. 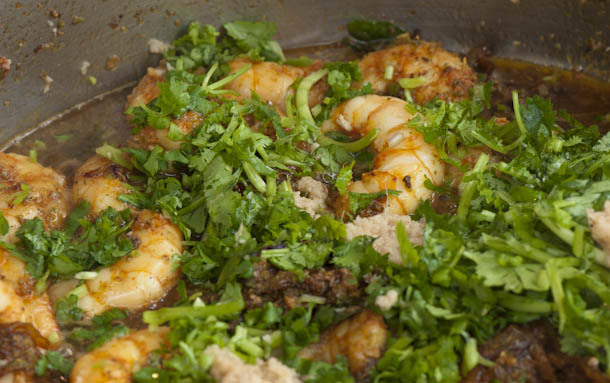 Add the prawns and fold in the spice mix (masala) till it coats the prawns. 8. 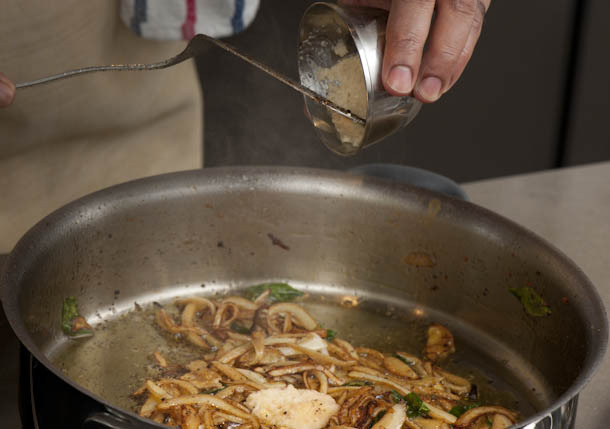 Increase the heat and cover the pan. 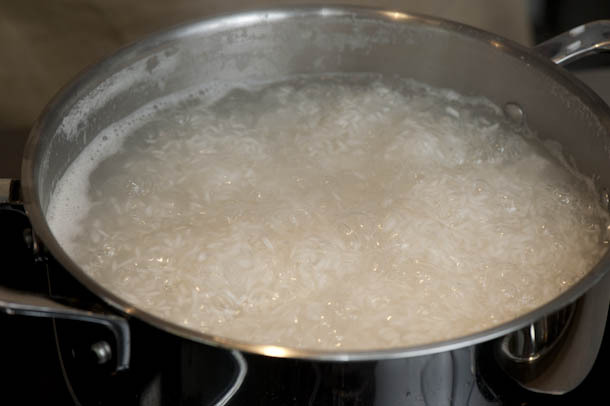 Cook for 1 minute and then reduce heat to moderate-high. 8. 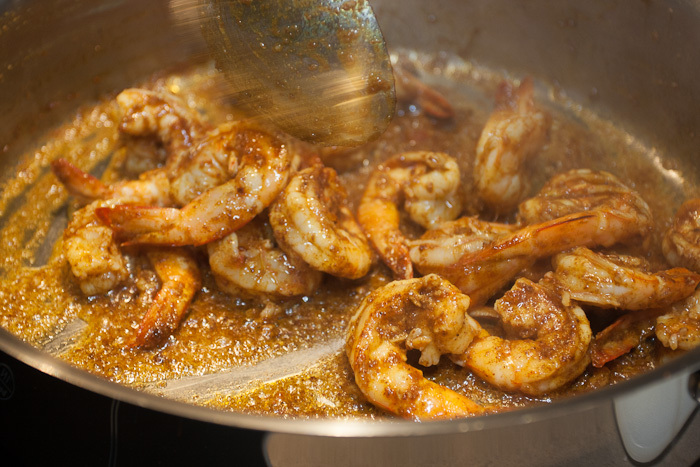 When cooked, serve the prawns as an accompaniment with dhaan dal (rice and dal), or as a salad, or as a pickle, or as a main course with Indian flat breads, or . . . well, the choices are endless! 1. 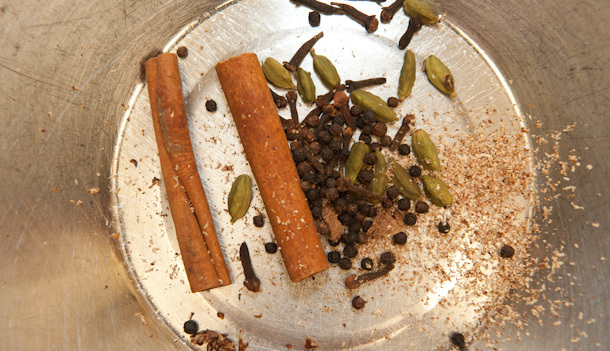 Start cooking the spice mix (masala) in cold oil. 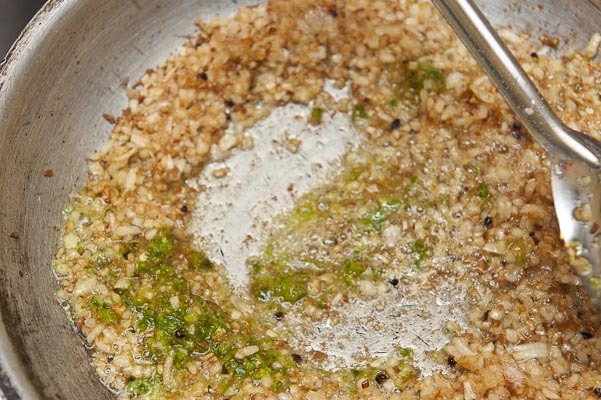 Heat the oil after the spice mix has been added. 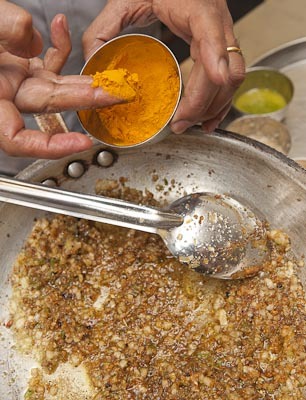 Adding the spice mix to the cold oil helps cook it till the flavours from the ground spices comes out without burning it! 2. 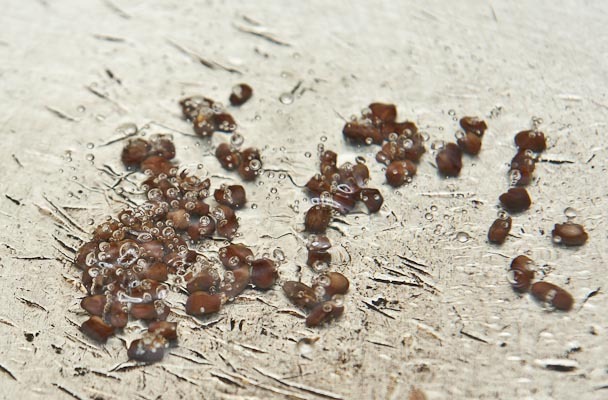 If brown vinegar is not available, don’t panic!, you can use apple cider vinegar instead. 3. 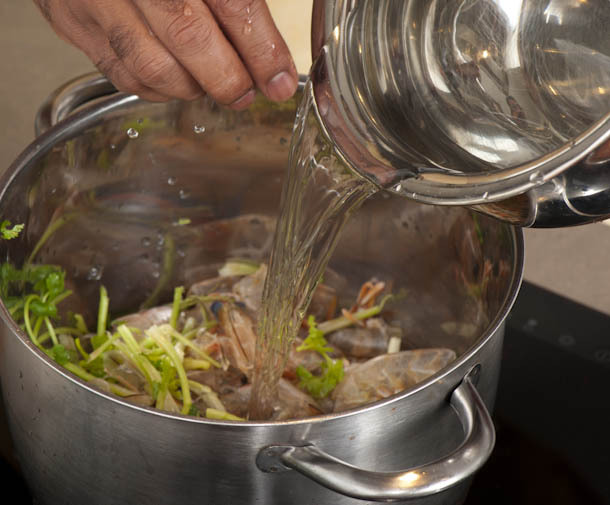 This dish can also be made with fish, especially a dried fish called boomla (that’s known as ‘Bombay Duck’ to lots of you which is a fish inspite of its misleading name!) and it can then be used as a pickle! 4. 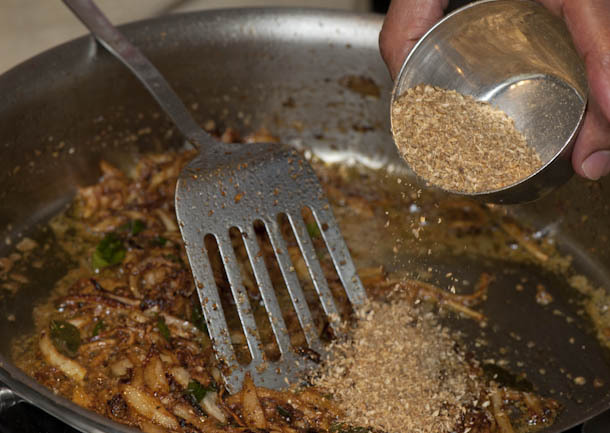 You can use any leftover spice mix to cook with slices of eggplant, or grated carrots, and “don’t over do them” as Nergis suggests. 5. Nergis mentions “every day fire” which means whatever fuel you use whether it’s gas, electricity, or even cooking coal and not too high heat !! Well, if you didn’t hear Nergis say that, that’s fine, nor did I, but she means it from the bottom of her heart!!! 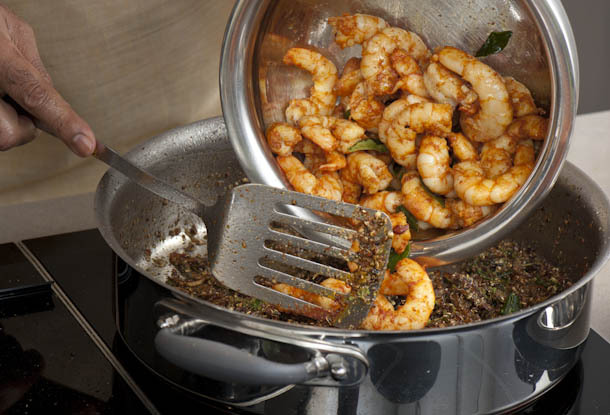 Posted in Classic meals, fish, prawn, Uncategorized and tagged apple cider vinegar, brown cumin seeds, brown vinegar, chilli powder, cumin seeds, garlic, green prawns, kolmino patio, marinated prawns, masala, oil, prawn, prawns, spice mix, turmeric. Bookmark the permalink. At 31 years of age he is already an ‘ustaad’ !!! 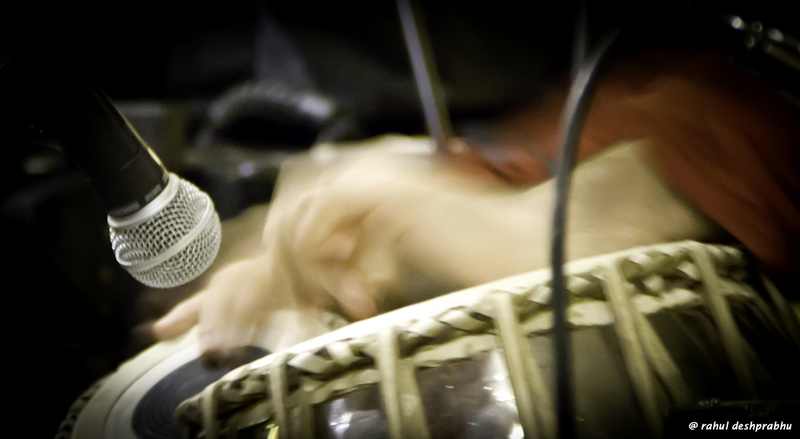 Indian music is like Indian food: totally mis-understood and completely undigested. 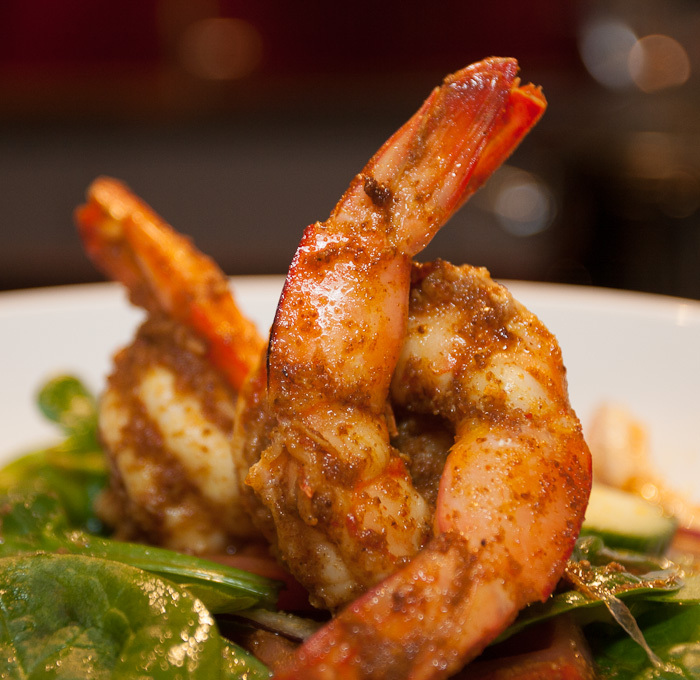 Indian music is not all ‘Bollywood masala’ and Indian food is not all ‘curry in a hurry’!!! We’ve heard enough (well, almost, I would say as one can never say/hear enough about it!) about the ‘curry in a hurry’ stuff so let us play a different tune (pun totally intended) today. But I want to focus particularly on an instrument called tabla, a percussion instrument extensively used in Indian classical music. 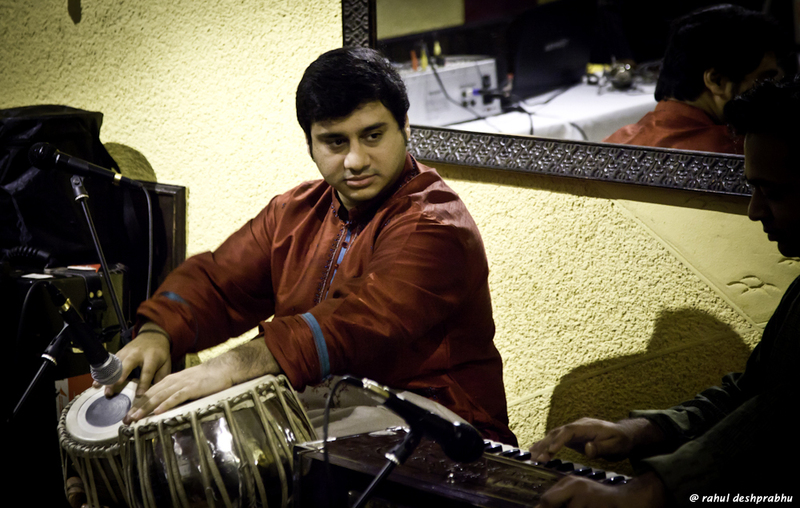 Tabla is derived from the Persian word tabl which means drums. 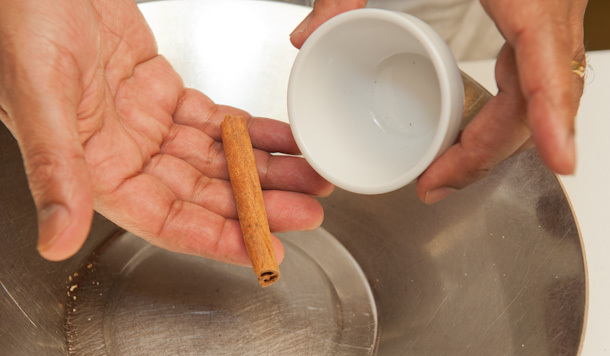 So, how does a percussion instrument fit into cooking? 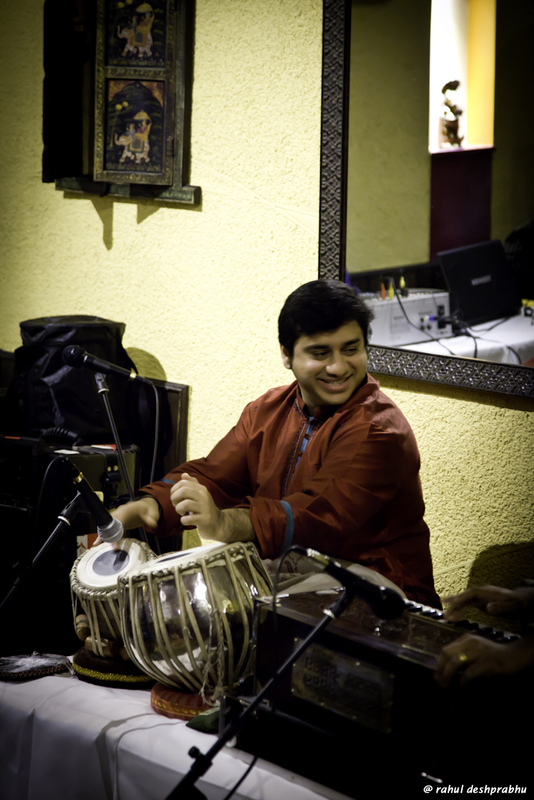 Well, as a part of our 16th birthday celebrations we had the privilege of hosting a baithak, or private concert, of a percussion artist who is possibly one of the youngest to be called an ustaad!! This man is a disciple of the great ustaad Allah Rakha Khan, and his son ustaad amjad Ali Khan, who are pioneers of the Punjab Gharana who are, well, I’d love to go on but I can’t because, unfortunately, I am completely ignorant of this instrument and music in general. However, this doesn’t prevent me from appreciating the instrument or the way it’s played and I certainly can recognize the pleasant from the ear-splitting! 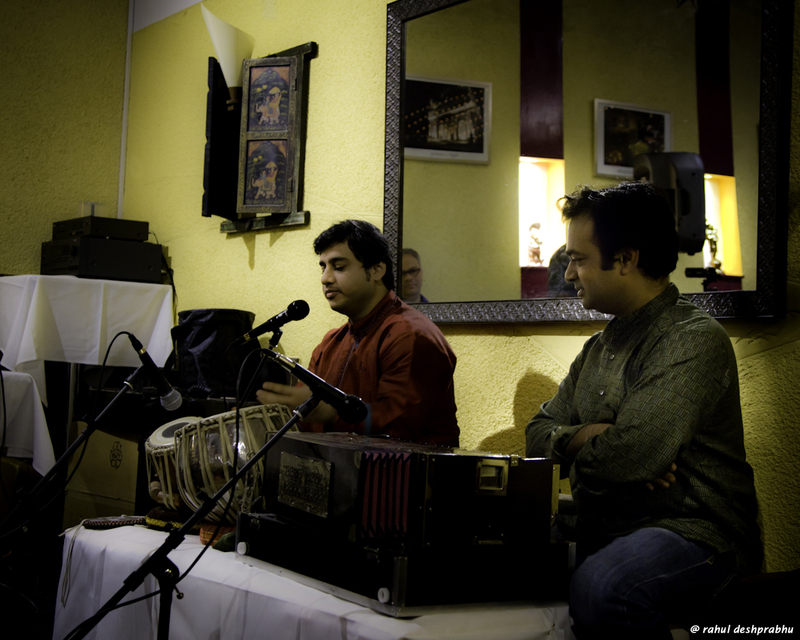 So, when my friend, Uday, recommended that I hear Aditya Kalyanpur play it was a great opportunity for us at nilgiri’s to have him play in front of about 80 guests. As each guest arrived they were given masala vadai with a mocktail. Then the music began and it did not disappoint!! And he played non stop for nearly 2 hours!! 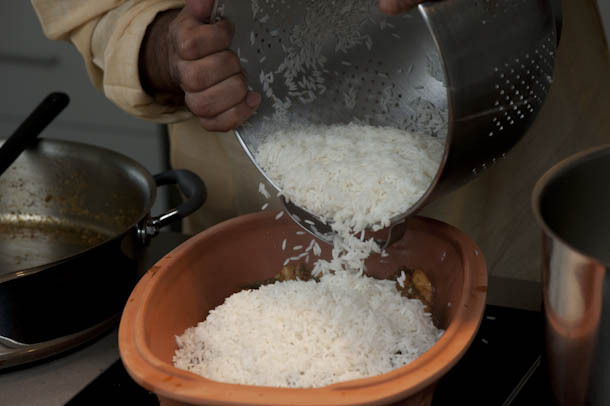 Whilst the music filled up the room, the guests were then served biryani in a box and on and on it went. Amazing! He played tukras and he played kaydas from the Punjab Gharana, mesmerising the guests with his artistry and mastery that he has picked up from his master ustaad Allah Raakha. The dessert we served was cardamom and pistachio kulfi, how else to try and mimic the joy of the music with the joy of a kulfi! It was a privilege to have this young man come and play. It was great to have the food, the atmosphere that this night brought. 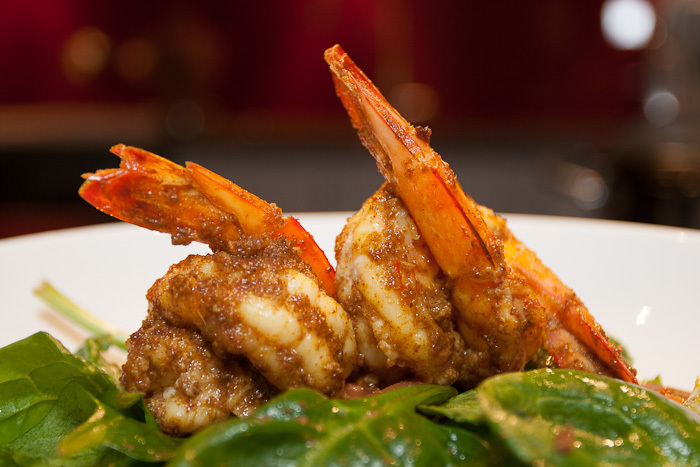 I want to have many, many more nights like this where young talents come and create something special at nilgiri’s. So, if you’re an aspiring artist (and we know the many forms this can take, from dance to illustration to music, ancient or modern), let me know! If we can foster our young artists, if we can show off their skills, then that’s great. I’ll do the cooking and they can do the entertaining! 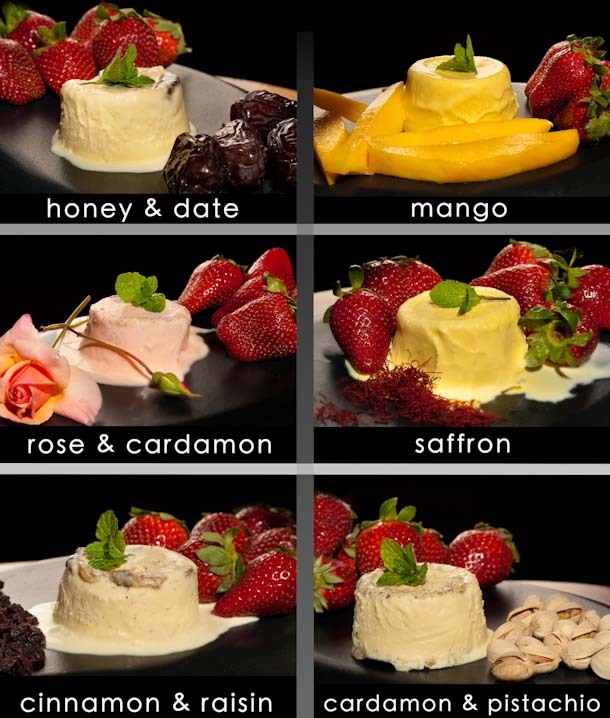 Posted in chicken, desserts, lamb, prawn, Rice, Uncategorized, vegetarian and tagged biryani, biryani in a box, kulfi, pistachio kulfi. Bookmark the permalink. Anyone who studied at The Madras Catering in the 70s and 80s would remember that these were (and possibly still are) the best known places to eat when in Madras, especially when you were broke! 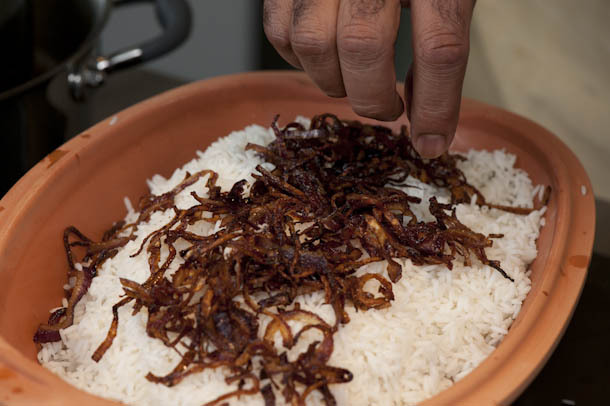 These foodie joints also had something else in common – they were all owned and operated by a community that comes from the west coast of India, known as the Malabar Coast. These people are descendants of the Arab traders who traded in spices way before the Dutch, the Portuguese and the British came to this part of the world. 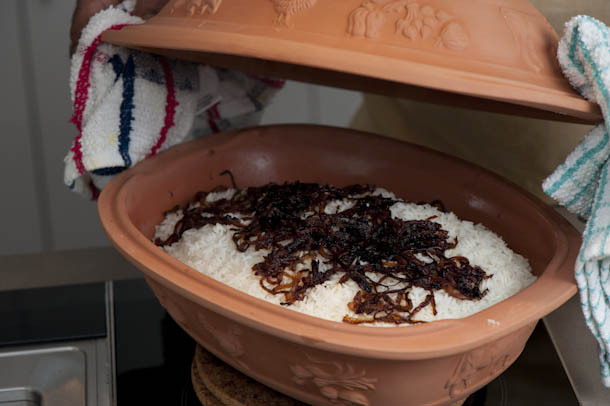 They are called the Moplahs or the Mapillai, literally meaning the son-in-law or a person held in high esteem! 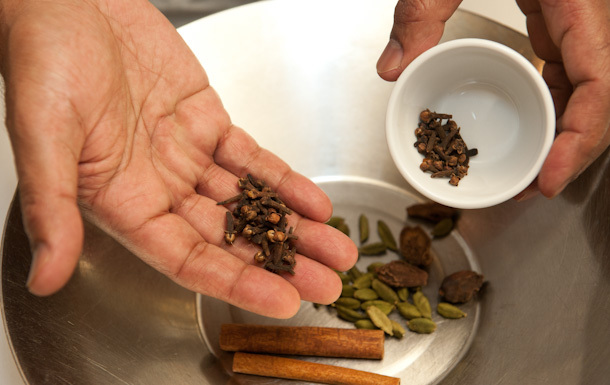 These people don’t just know their spices, they have created a wonderful cuisine called the Malabar Muslim Food!! 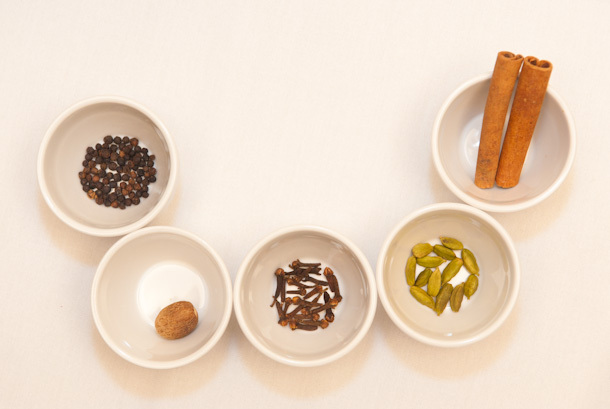 Their pathiri and the muttai masala and the meen mulakkithattu and the chemeen . . . are to die for!!! What memories! These were the best days of my life koi lauta de mere beetein huay din!! 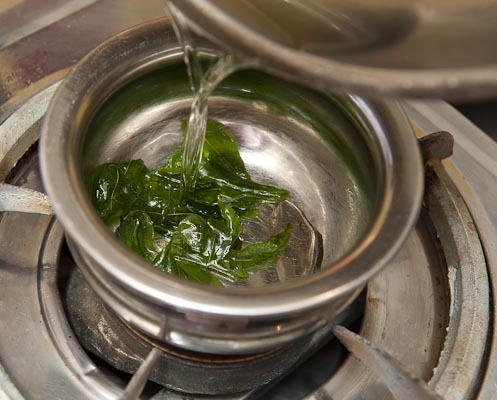 But let’s get back to the food joints, Kaanagam was popular for a cup of chaaia (the best cup of tea you’ll ever have! 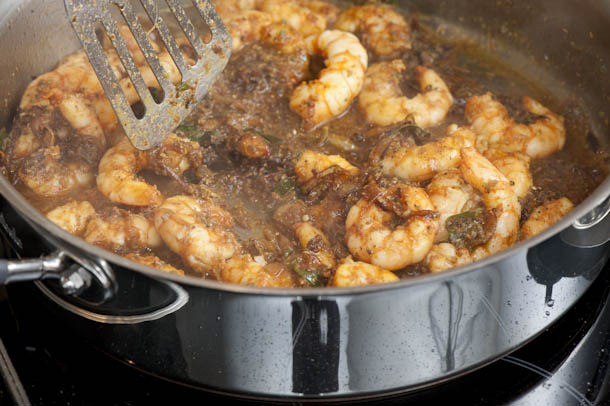 ), Runs made (the best) mutton korma with kerala parota and Coronet cooked (the best bl..dy) prawn and fish buryaani, and to top it all you could pay when you (or any of the above mentioned friends) had the money. The only condition was that you had to be from Madras Catering!! I am extremely happy that I got a taste of some of the best Southern Indian food that one can find anywhere on the planet! These restaurants were basic food joints with a table, a chair, a spoon, a fork and a glass tumbler and that is it. There was a cashier counter, too, where the boss sat and counted his takings while keeping a close eye on all the operations! This boss managed all the people who worked at the restaurant and the product took care of itself. Eating there was never a let down! My relationship with Coronet restaurant began when a bunch of my seniors (Praveen, Dexter, and others), took me to the restaurant during the ‘initiation process’ (a.k.a mental disintegration process) that was customary at the college, and asked me to ‘wait’ at their table while they sat, chatted and happily enjoyed the fish buryaani. I had to serve them, clear their table, wash their plates and cutlery and also settle the bill for them. How cool was that?!! Well, not cool at all. In fact, it made me so angry and hungry (in both meanings of the word) that I promised myself that I would come back some day and treat myself to a buryaani when these seniors were at college. I did get my chance but it was a complete disaster. 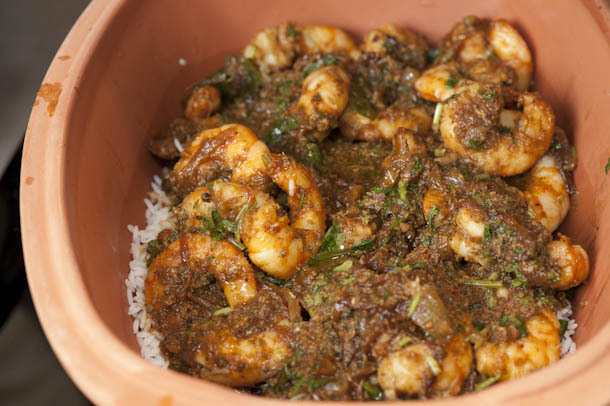 The owner managed to get in touch with Dexter who was still at college and asked him to come in immediately as there was a junior sitting at the table having his buryaani. Now Dexter (who now lives in Melbourne) picked up Murphy (who also lives in Melbourne!) and drove straight down to Coronet just as I was about to have my first mouthful of the much awaited buryaani and they sat either side of me at the table. So, forget about having the bur . 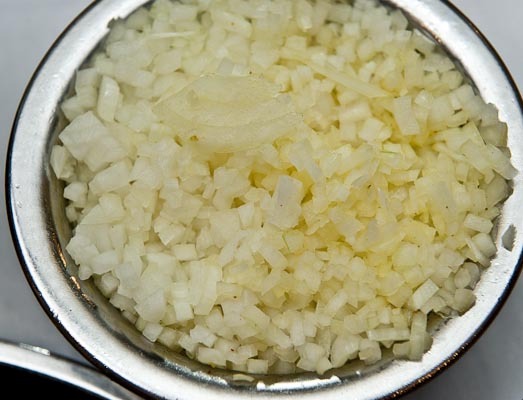 . . ni, I ended up peeling onions and garlic for the chefs! This was to be my first taste of a commercial kitchen and, believe it or not, I have lasted in one for over three decades! Years later, when I finally got a chance in Mangalore to learn this wonderful art of buryaani making I wasn’t going to miss it, no way!! So, in an effort to make amends for that time, here’s the biryaani that I love to cook. 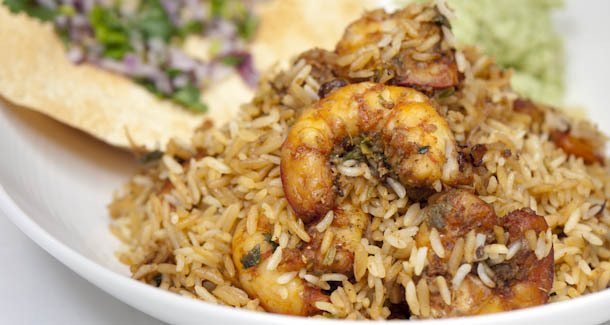 It’s with prawns, or chemeen as they call them, which make a delicious biryani. Please try it yourself and let me know what you think. 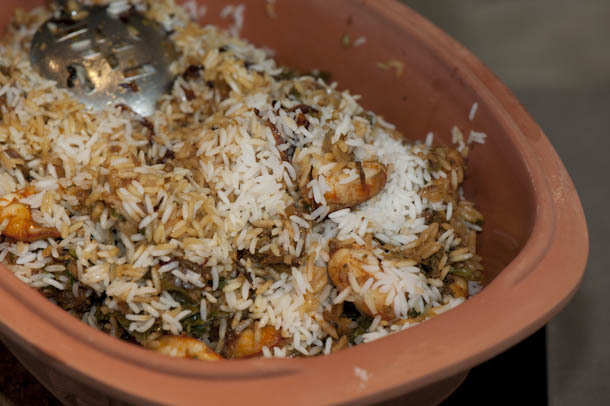 If you’d prefer to see a one page version of the prawn biryani, click prawn biryani recipe. 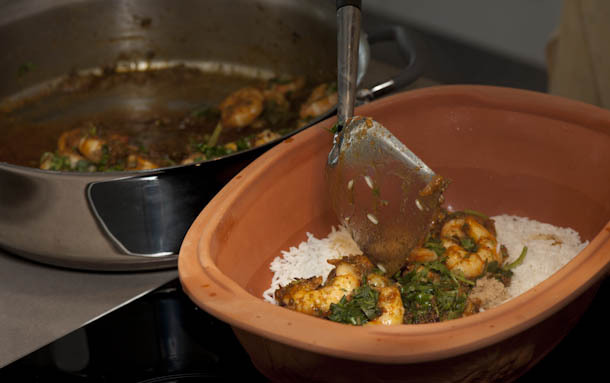 First: prepare our clay pot; 2) prepare the rice; 3) make prawn stock; 4) caramelise our red onions; 5) marinate then 6) sear the prawns; 7) make the biryani marinade(masala); 8) mix it together and bake in the oven. 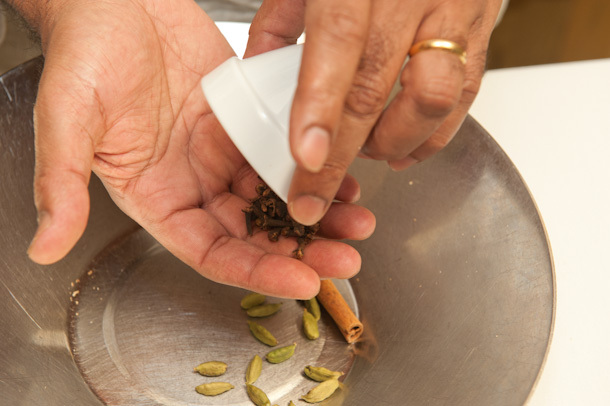 Whilst it’s baking away we get on with our accompaniments: 9) make our masala; 10) cook our pappadums (yes folks, these are bought! 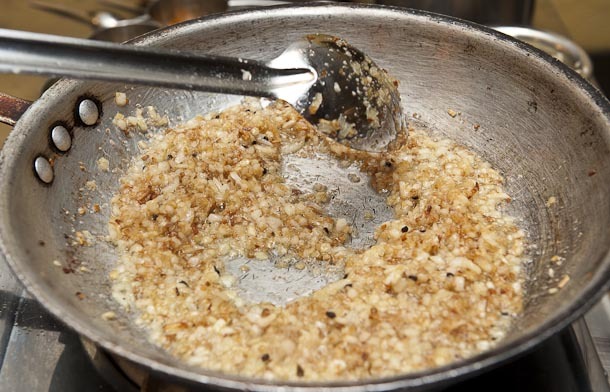 ); 11) make our coconut chutney.Oh, and use the seafood garam masala (click garam masala blog for the seafood garam masala recipe). That’s it. So, let’s get started. 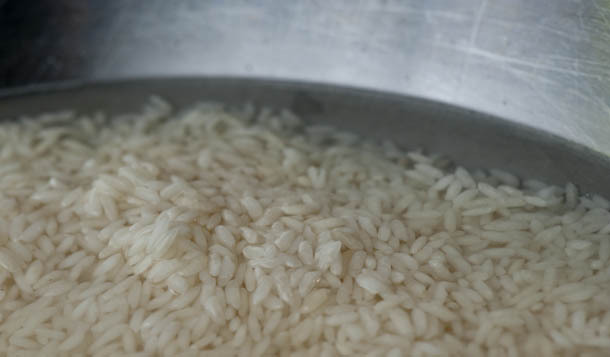 choose your rice: shown are sona masoori rice (top left) and basmati rice (top right). 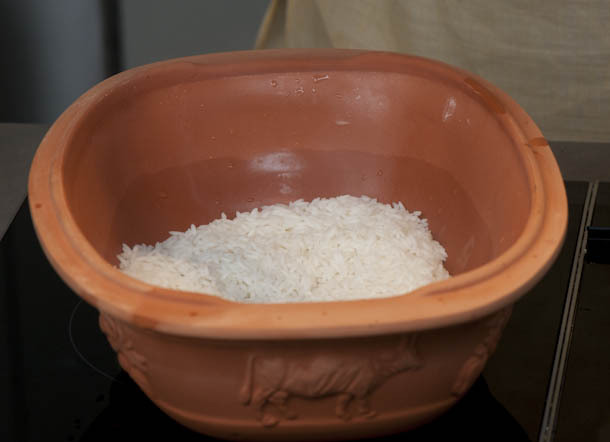 I could have used the longer grained basmati rice from the north, but chose to use the short grain sona masoori rice from the south because this is a southern style biryani!! 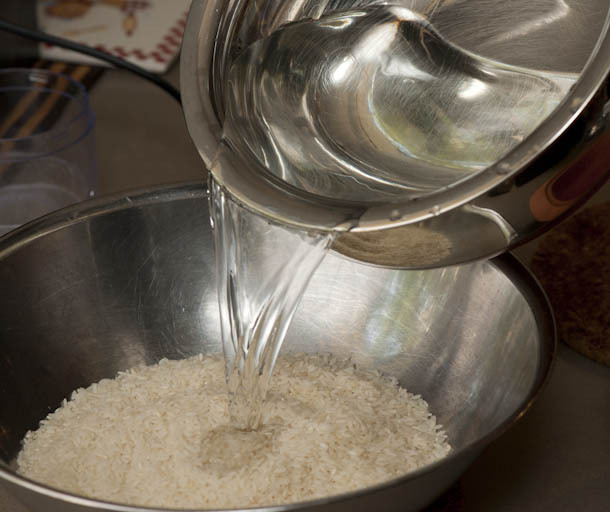 add 3 cups rice to mixing bowl n.b. 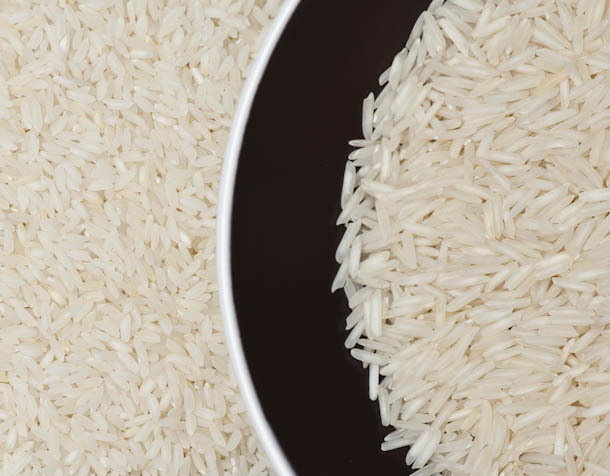 do not wash the rice! 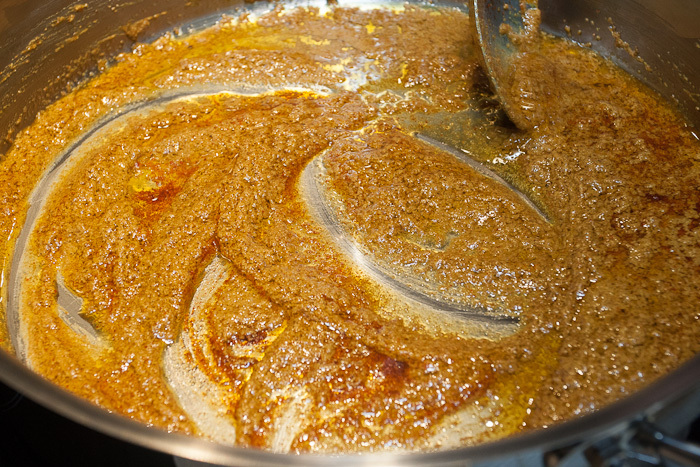 Well folks, this completes the long journey making our six garam masalas!! 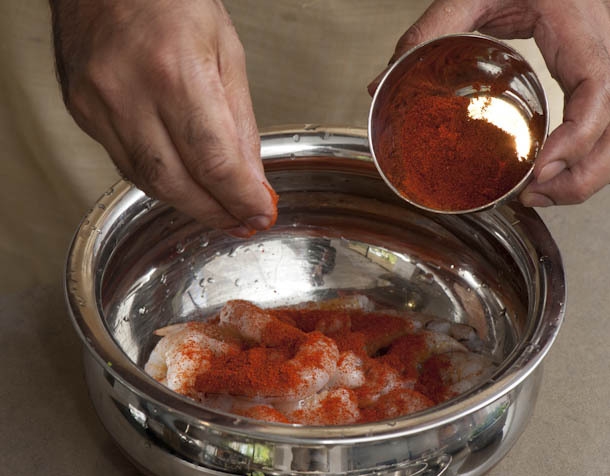 Please make any of the garam masalas for other dishes too. 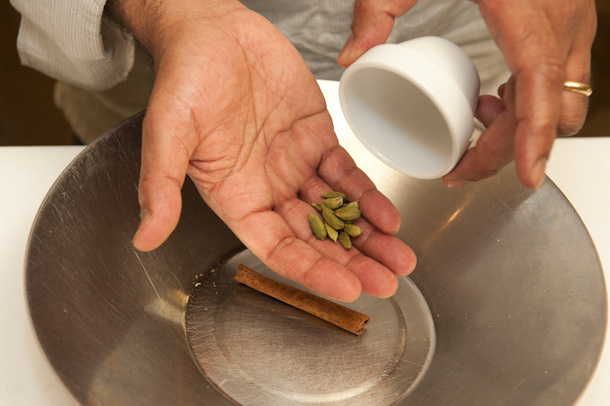 I’ll be returning to these masalas in the future. I hope you have enjoyed reading it (and cooking it) as much as John and I have in bringing it to you! Join us next week as we travel around this beautiful land called India and I will reveal some really unique VEG(AN)ETARIAN dishes for you to try!! Posted in Basics, Classic meals, Cooking, fish, prawn, Recipes, Restaurant photography, Rice, vegan, vegetarian and tagged baked prawns, baking prawns, biryani, buryaani, caramelising onions, chilli powder, chutney, clay pot cooking, coconut chutney, coconut cream, cooking rice, coriander, fish stock, fish stock recipe, garlic, ginger, indian cooking, msala poppadum, muslim masala, onions, pappadums, poppadum, prawn biryani, prawn stock, prawn stock recipe, prawns, Rice, seafood. Bookmark the permalink. 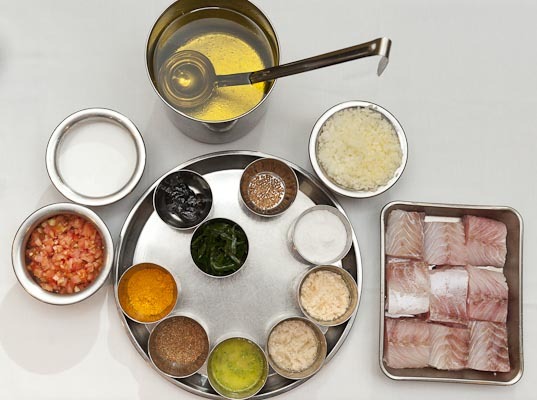 Is it going to be Keralan or Mangalorean or Goan fish? . . . Let’s find out!! 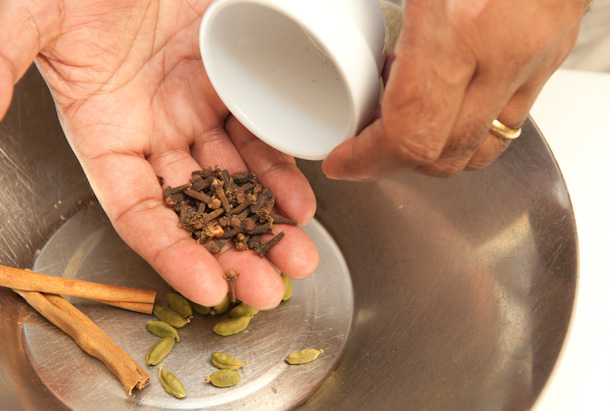 Part 2 of my garam masala series. 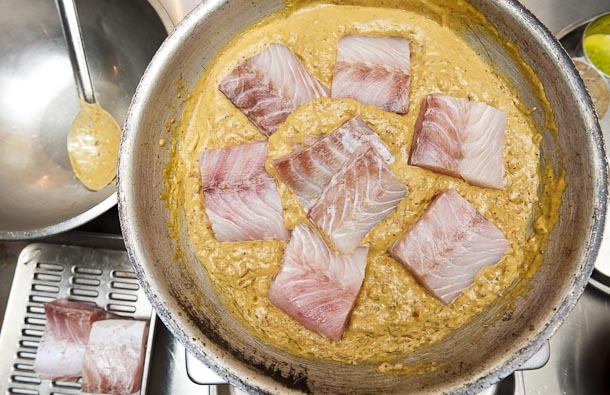 In my 22 years of running a restaurant in Australia, I have not seen so much anxiety and curiosity in my kitchen as I saw last Sunday, just a day before John (well, we all know who John is by now, he’s the man who puts visual life into my blogs) and I were to photograph a fish dish. 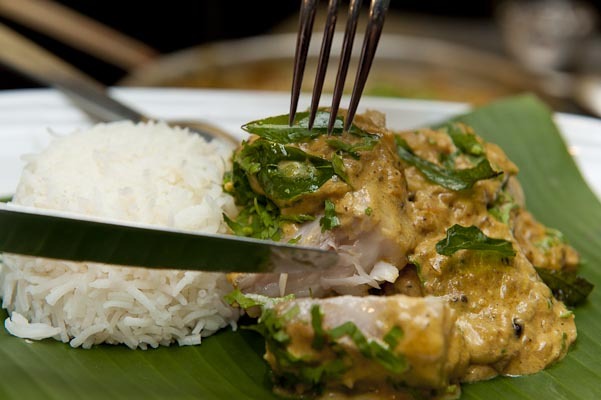 As it was fish, the focus of the debate centred around whether I was going to make a Keralan fish dish. One chef was convinced of it. Well, I like to do things my way as I’m sure my chefs know by now. 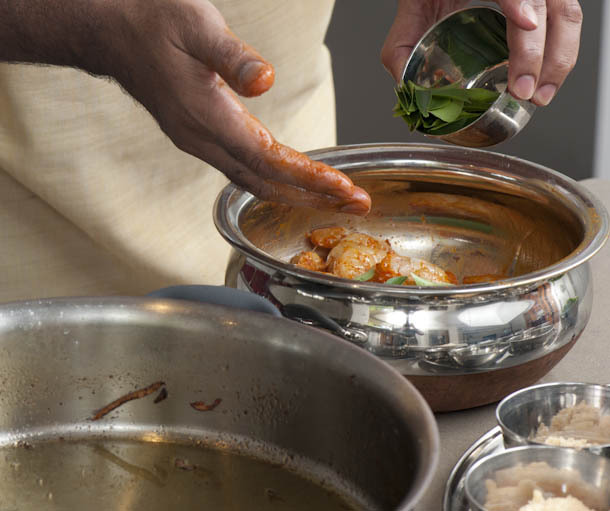 So guys, this week I am making a Hyderabadi-style machchi ka saalan, a fish dish that uses both tamarind and tomatoes. How’s that?!! 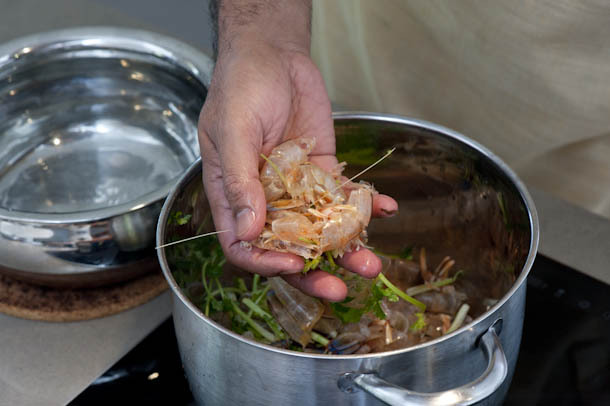 I learnt this dish from chef Chaman Lal at the Banjara hotel in Hyderabad way back in 1980, it’s such an amazing dish that uses a river or a lake fish rather than a saltwater fish. 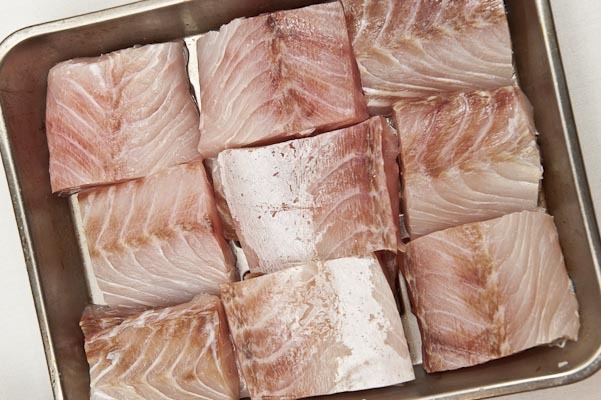 For this recipe I am using barramundi. 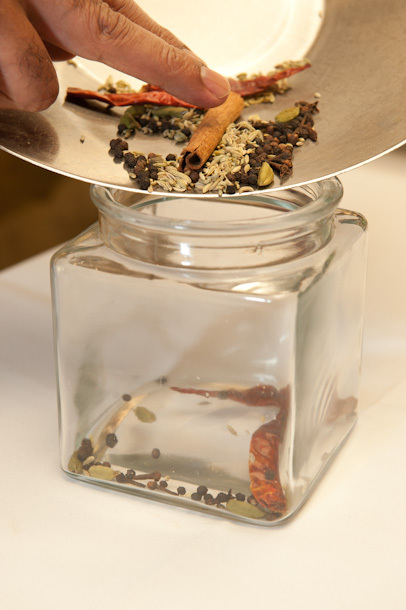 STEP 1 – Plate your seafood GARAM MASALA that we made last week and stored in our glass jar, remember?!! 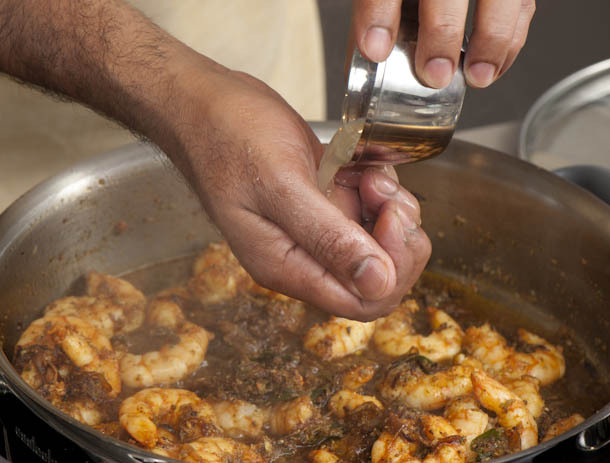 Place the seafood garam masala mix, that you made last week, on a plate – there’s no need to pan fry the spices because they will be cooked with the rest of the ingredients (roasting them and adding them to the cooking process would overcook them making them go bitter) . . . 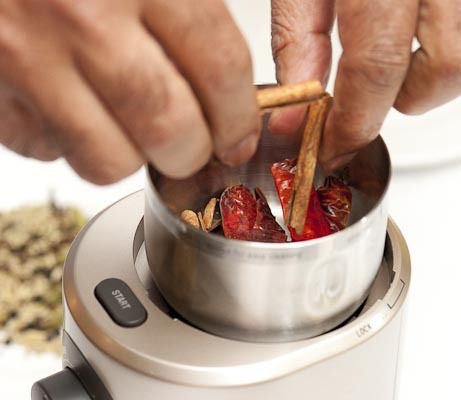 If committed, use a pestle and mortar – I prefer an electric spice grinder! 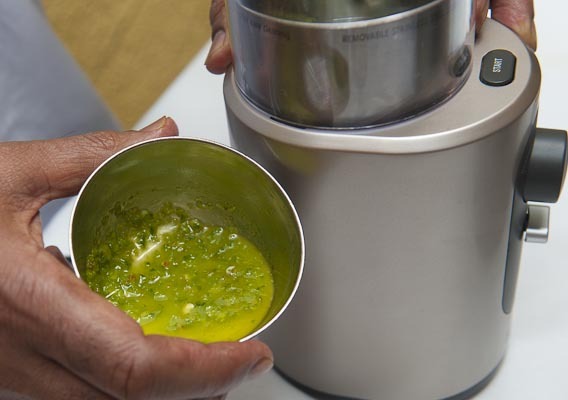 Break up the chillies and place in the grinder. 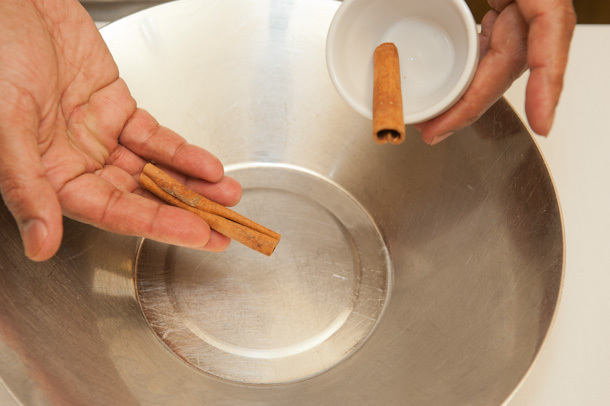 Do the same for the cinnamon sticks. 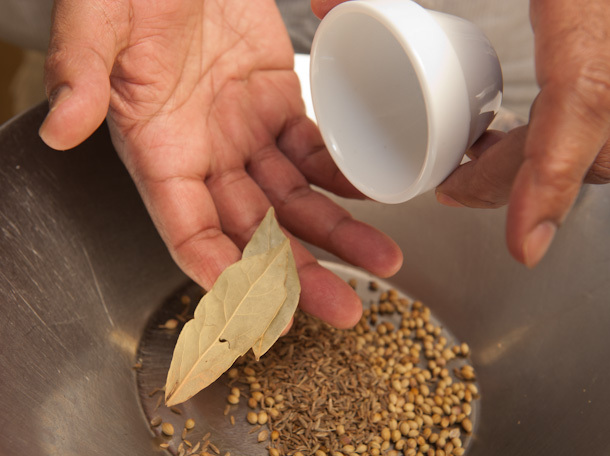 Add the rest of the spices. 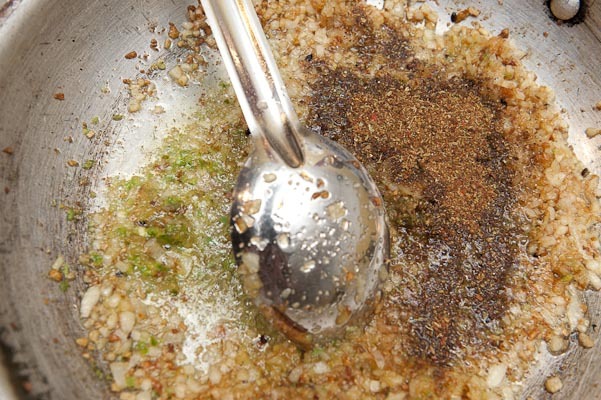 . .
Add the rest of the spice mix. 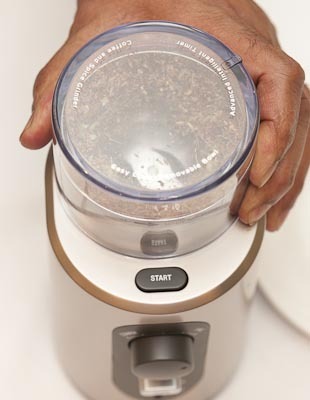 (Try and keep the grinder dry at all times!). 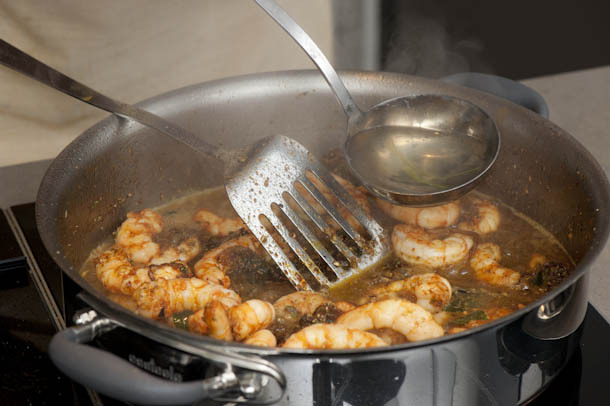 For this recipe you will be using 2 tablespoons of the seafood garam masala (any left over should be stored in a clean, glass jar in a dry place). grind for about 10 seconds. 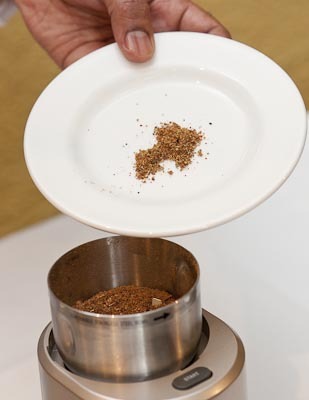 the spice mix should be slightly coarser than sand . . .
it should be like ground coffee beans!! 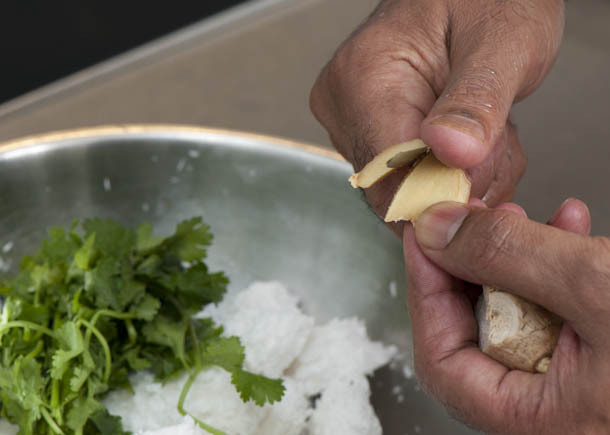 STEP 2 – Prepare your garlic, ginger and chilli pastes. 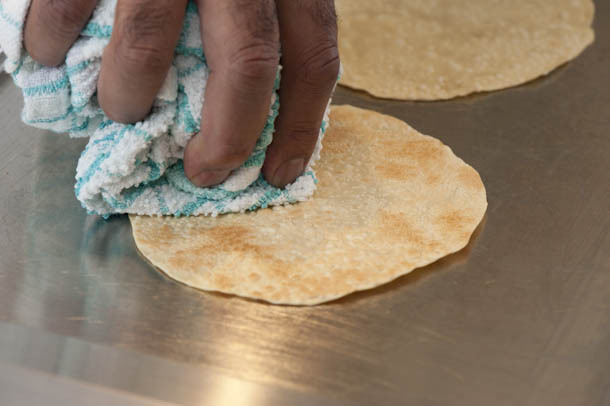 Don’t be put off by doing this, it doesn’t take long at all and the taste is definitely worth it! 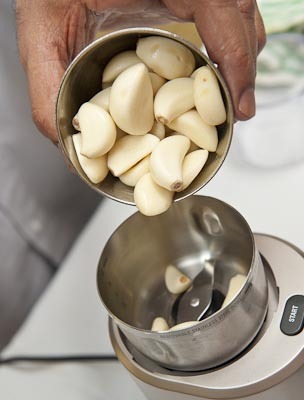 For the garlic paste, if you grind the cloves in oil it keeps the garlic ‘fresh’ for about 3 weeks in the refrigerator. 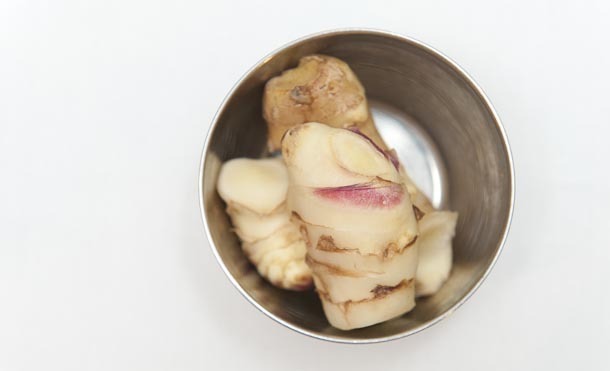 add polyunsaturated oil to the sliced ginger (just enough to cover it). 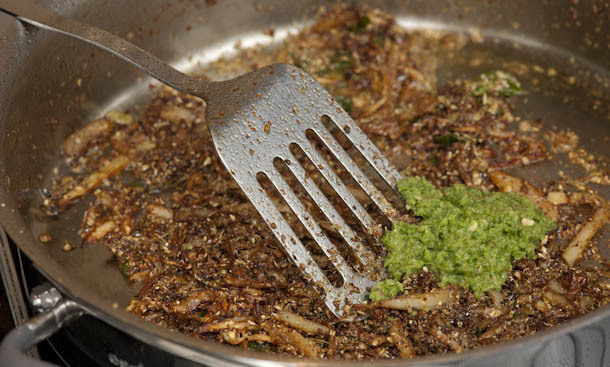 Again, to make the green chilli paste (with the seeds retained, of course!) 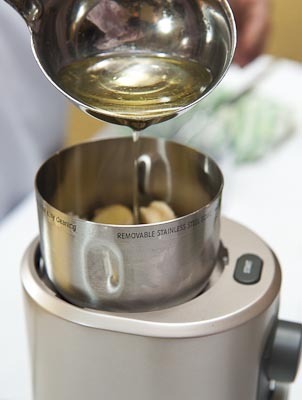 grind with oil and it will keep in the fridge for about 7 days. 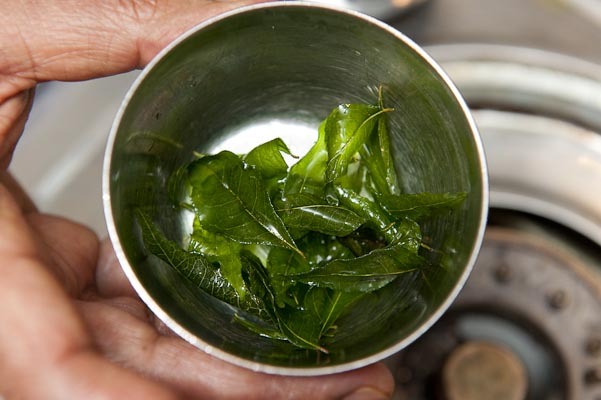 If you snap-fry the kari leaves they will keep ‘fresh’ in the refrigerator for a few weeks. 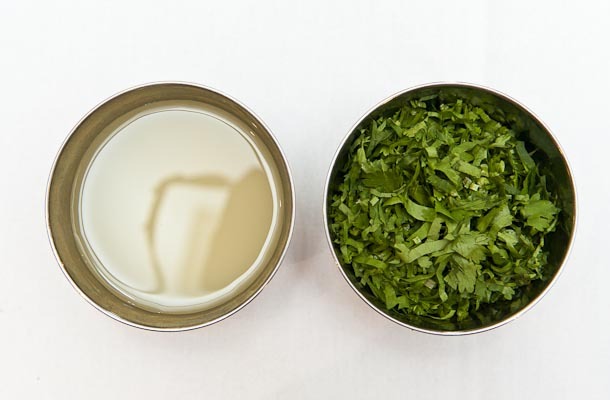 However, for this recipe try and use freshly fried kari leaves. 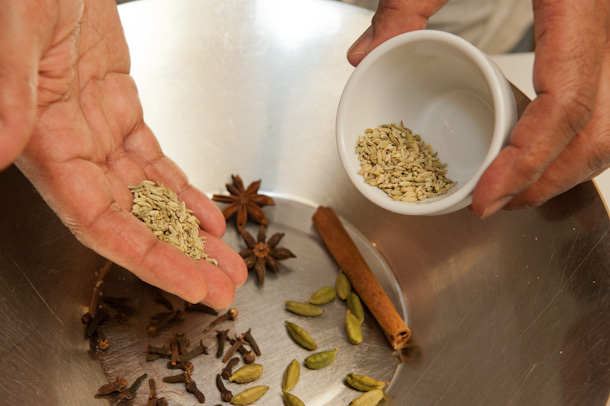 Now we’ve got our ingredients sorted, it’s time to start cooking. 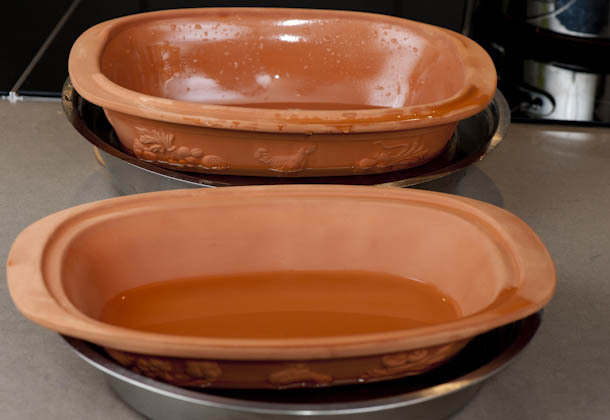 . .
Heat frying pan over moderate heat. 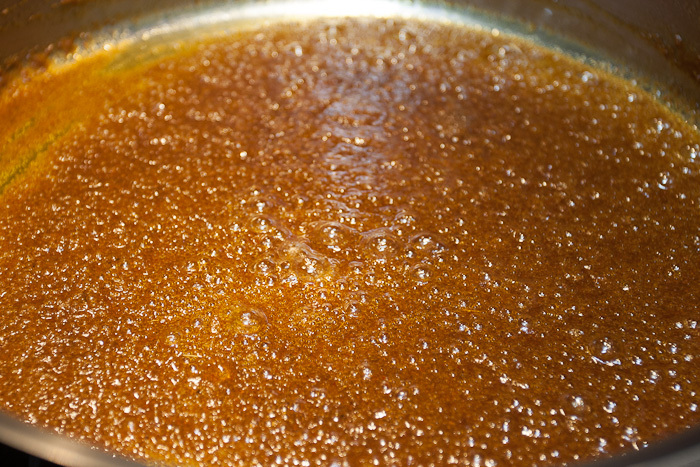 Add 2 tablespoons polyunsaturated vegetable oil to pan and allow to smoke. 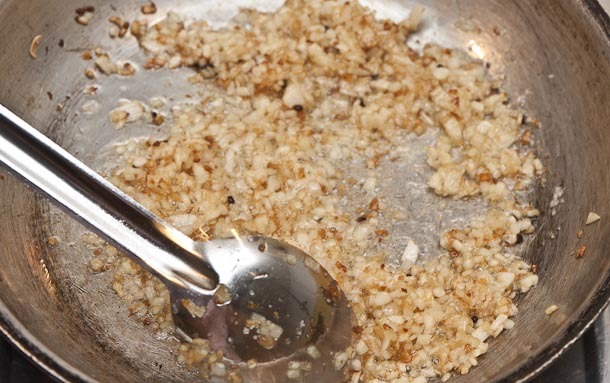 Add 1 teaspoon fenugreek seeds and let crackle. 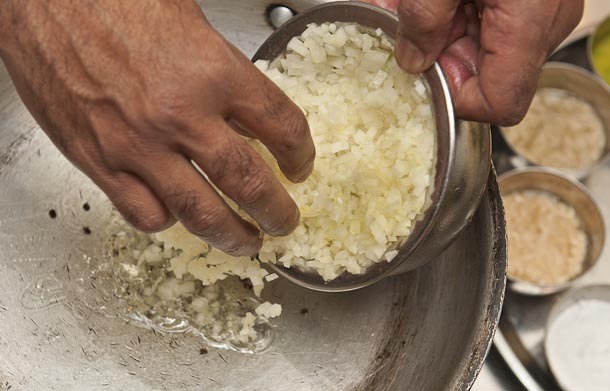 Add 2 cups chopped onions. And a hint! 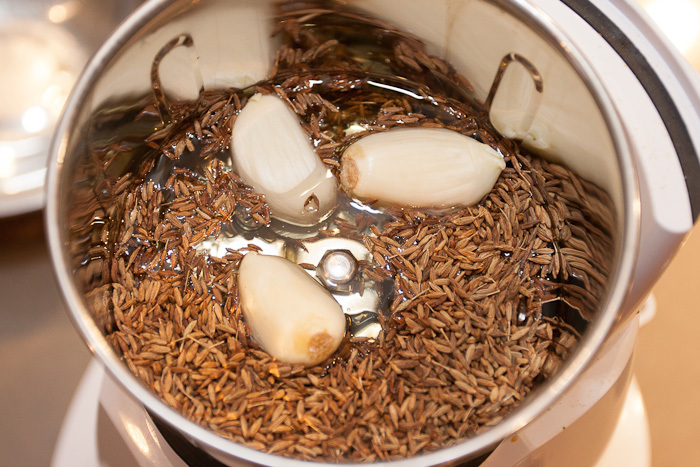 If you add the onions a little at a time this stops the oil cooling and the onions will cook better! 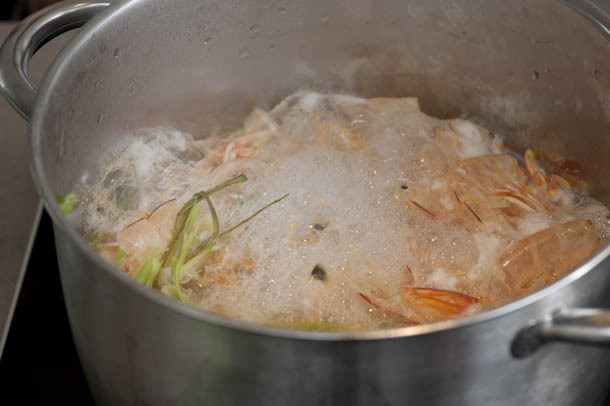 Then add the salt. 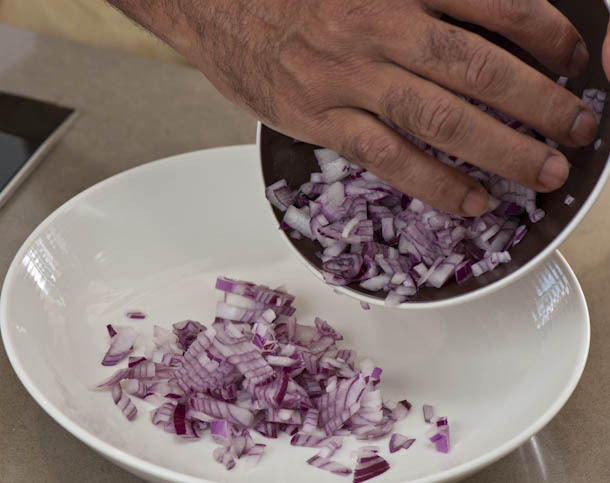 Fold the onions and cook. 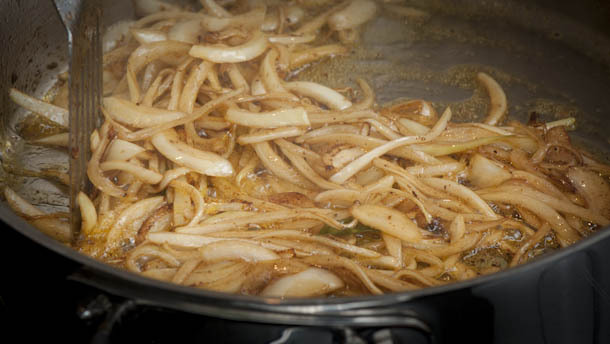 Keep cooking the onions until mildly caramelised. 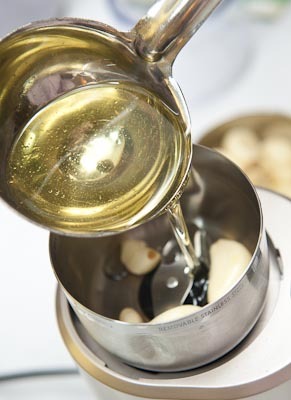 Add 1 tablespoon garlic paste when the onions are mildly caramelised (light-golden). 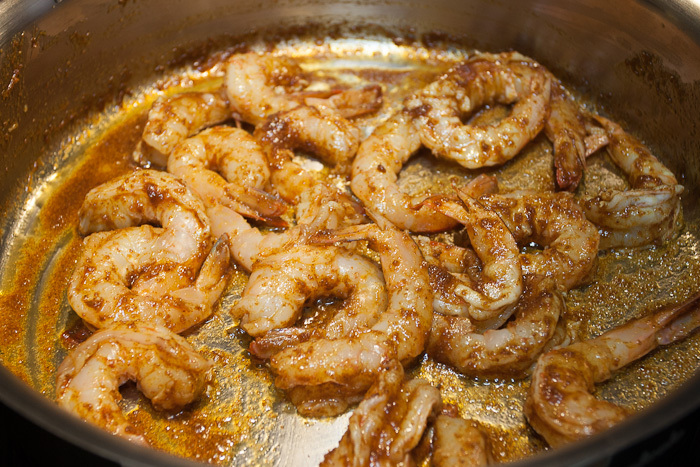 Fold in garlic paste and cook till lightly caramelised. 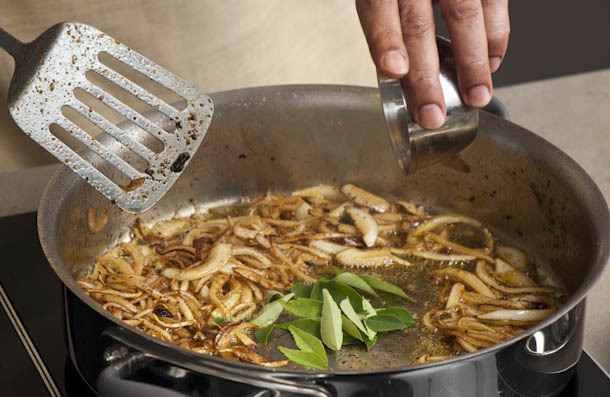 Add 1 tablespoon ginger paste to the pan. 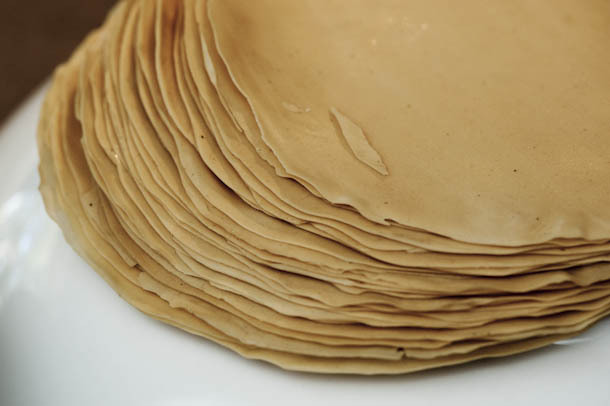 Fold in the ginger paste and continue cooking. 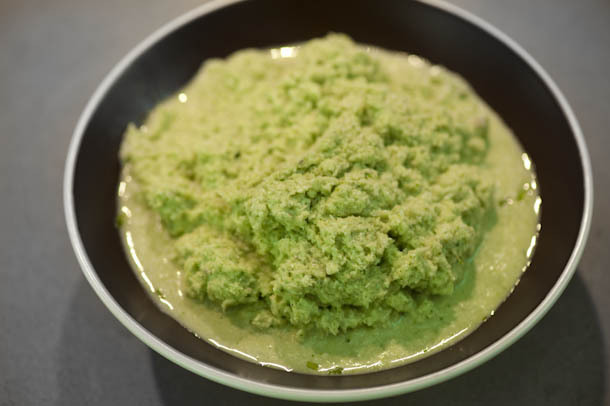 Then add 1 tablespoon green chilli paste. 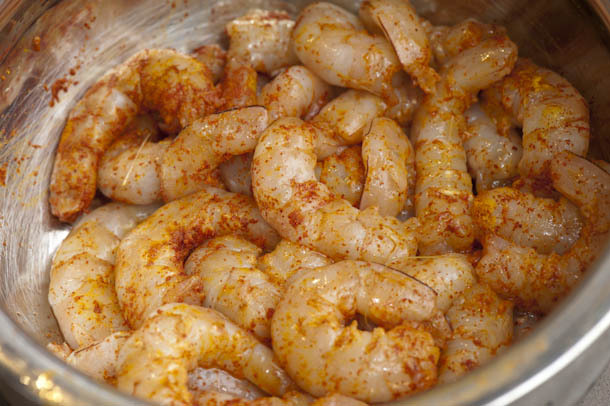 Fold in the chilli paste and cook. 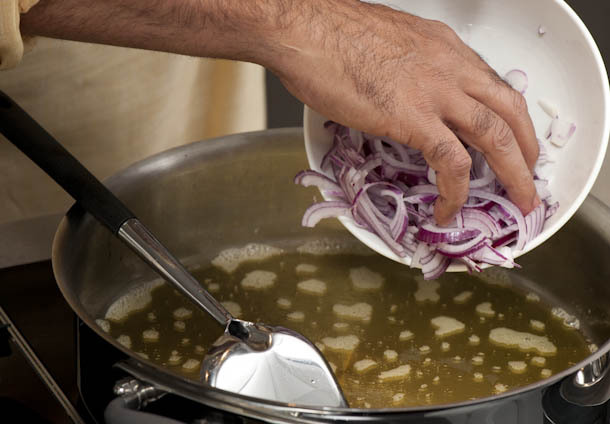 Now add 2 tablespoons seafood garam masala and fold in with the onion mixtures and cook until fragrant. 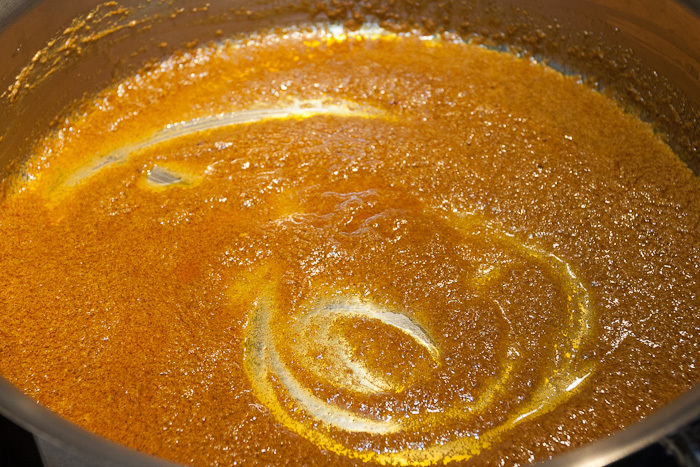 Add 1/2 teaspoon ground turmeric to the pan. 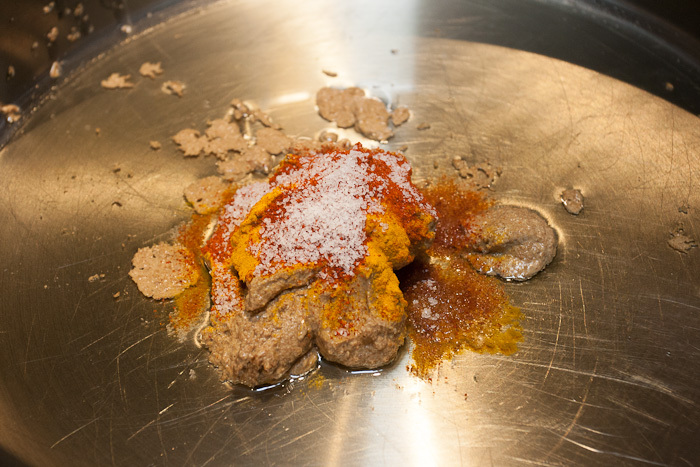 Fold and cook the ground turmeric. 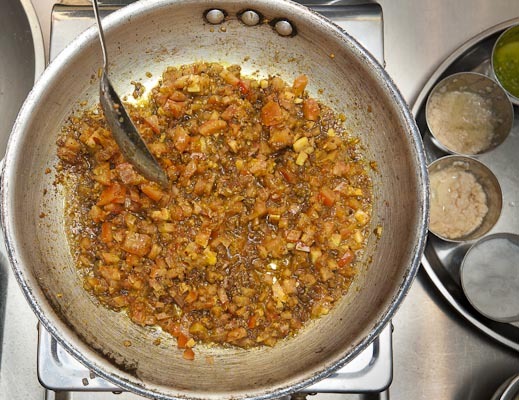 Then add 2 cups chopped tomatoes. Fold the tomatoes and cook. 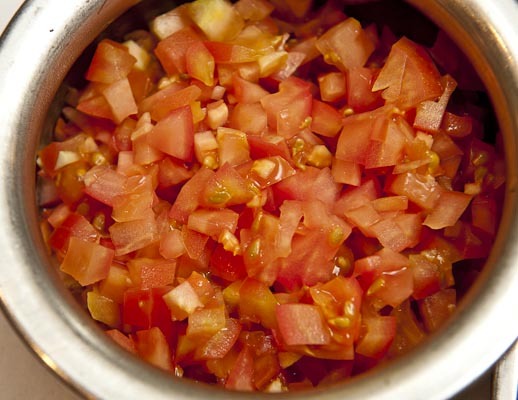 Continue cooking the tomatoes until they are soft. 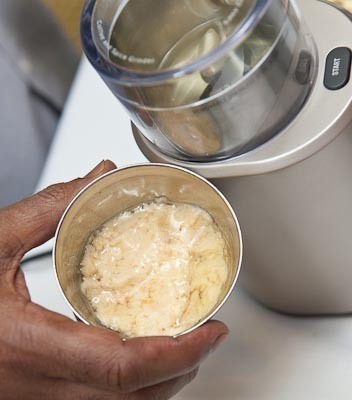 Add 2 cups coconut cream and fold. 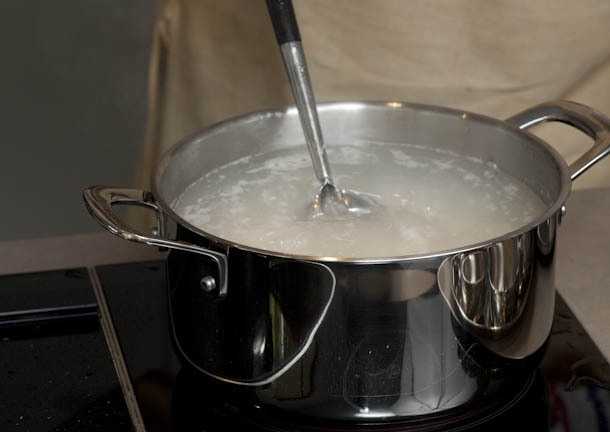 Keep folding the coconut cream, ensuring the cream does not come to the boil or else it might split. 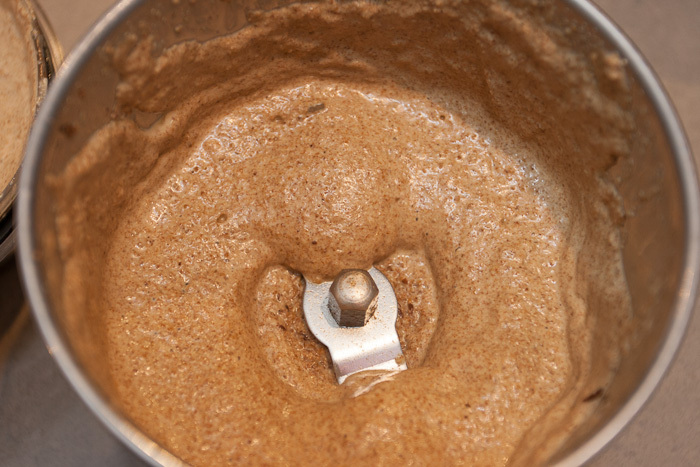 Add 1 teaspoon tamarind paste and fold. 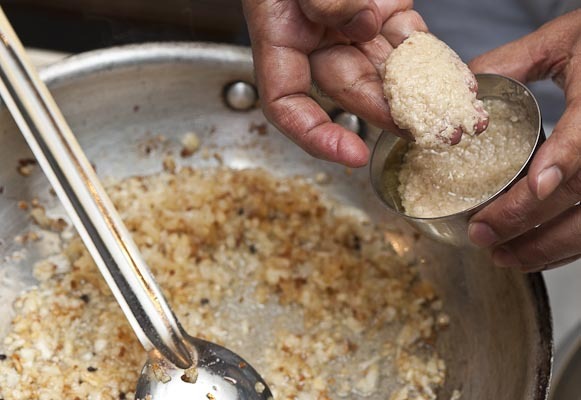 Keep folding the tamarind paste until bubbles appear. 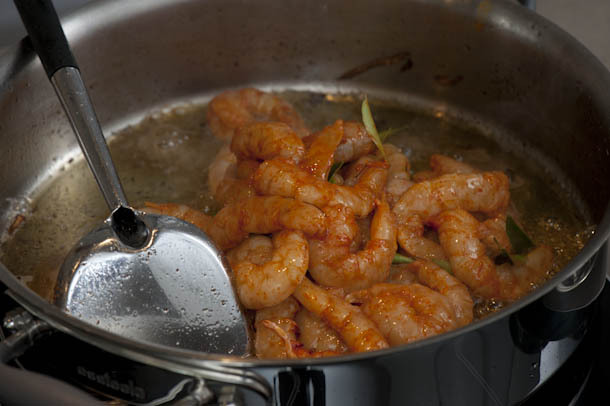 Add the chopped fish to the pan, ensuring no pieces overlap (so that each piece cooks evenly). 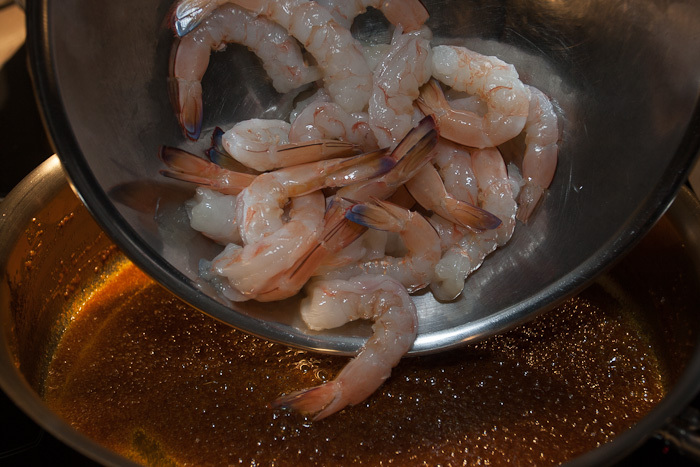 Cover each piece with the sauce. 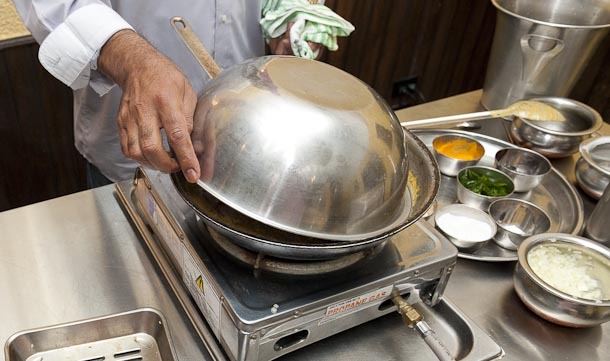 Cover frying pan with a lid and reduce heat to low. 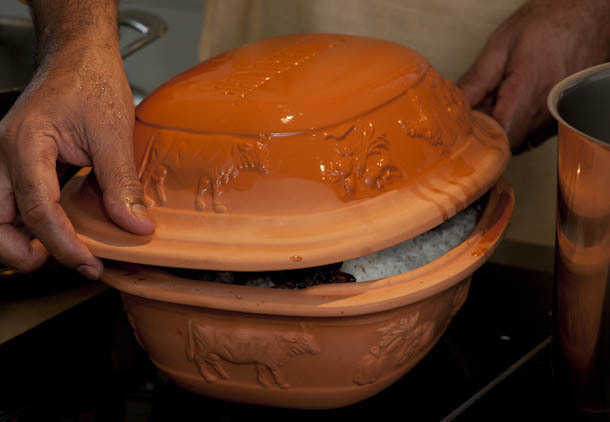 Continue cooking, with lid on, for 10 minutes. 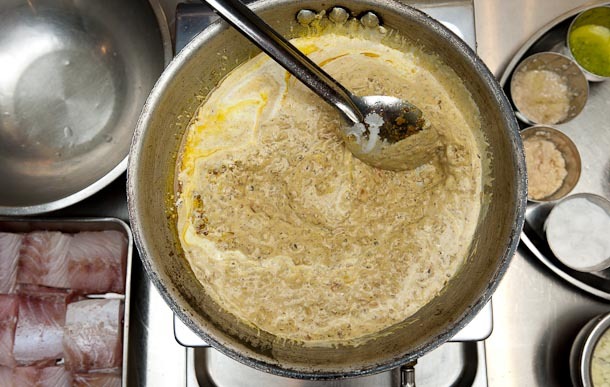 Remove lid and the sauce will have thickened. 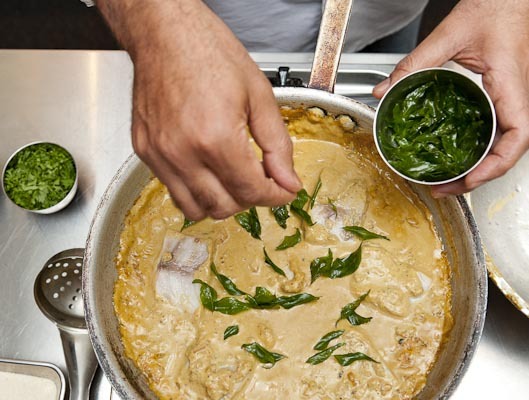 Place the snap-fried kari (curry) leaves on top of the fish and let fish slow cook for a few minutes. 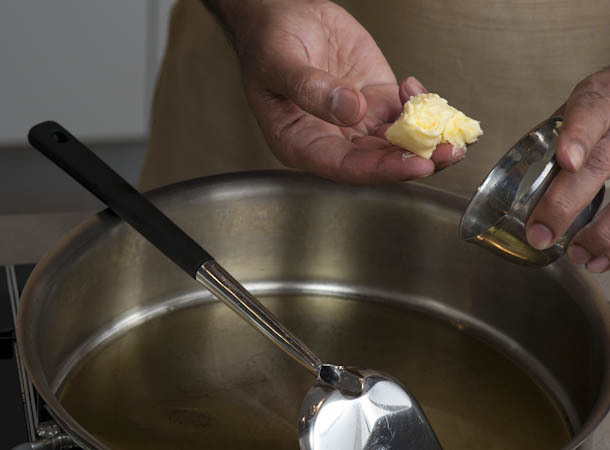 Sprinkle with 1 tablespoon lemon juice. 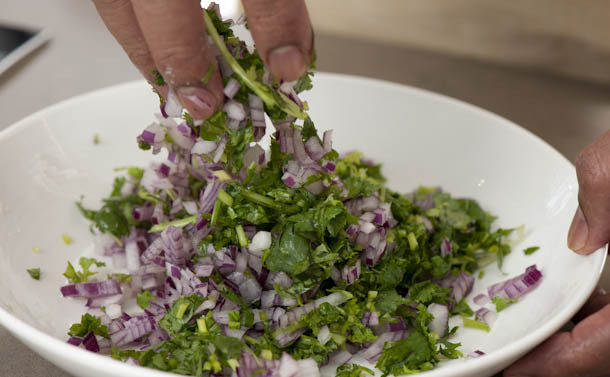 Add 1/2 cup chopped coriander leaves and fold gently. 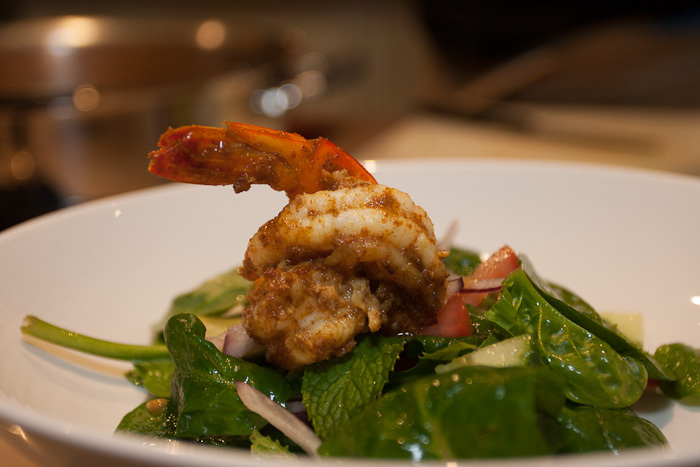 serve with steamed rice and enjoy! 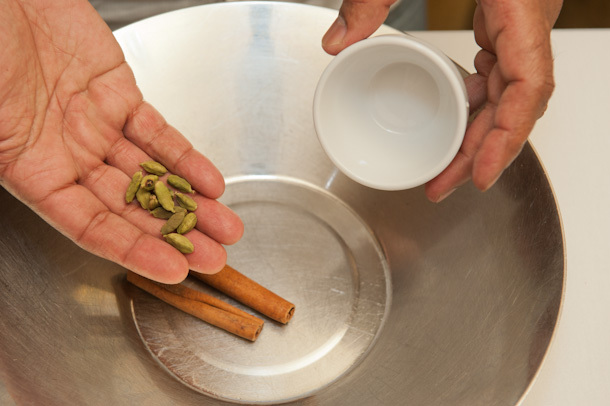 Next week we will use garam masala for vegetables. Hope to see you then!! Oh, it would be great if you could let us know where you are reading from. 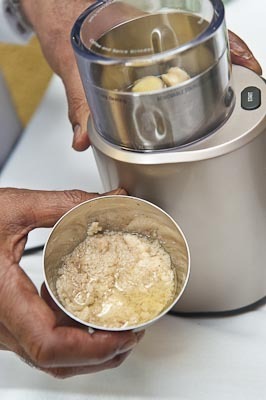 Posted in Basics, Classic meals, Cooking, fish, prawn, Recipes, Restaurant photography and tagged electric spice grinder, fish dish, fish recipe, foodie, garam masala, hyderabadi style, hyderabadi style fish, indian recipe, machchi ka saalan. Bookmark the permalink. 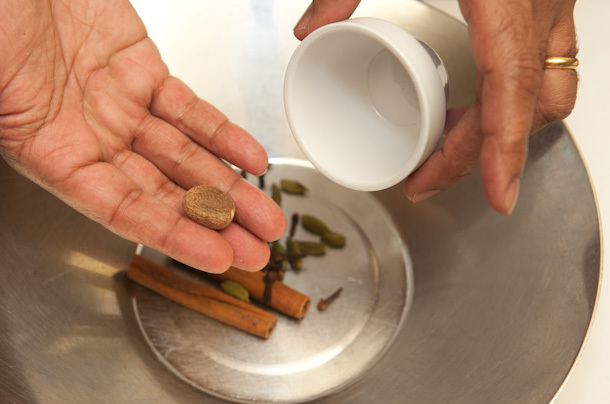 Six basic spice mixes – you may call them “garam masala”. . .Part 1 of my garam masala series. 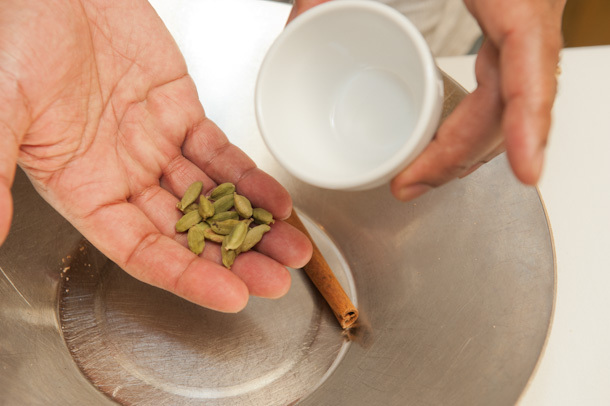 How do you simplify a complex cuisine which has at least a billion different interpretations, all of them equally correct in their own way? One way is to call it a ‘curry’ and just leave it at that! 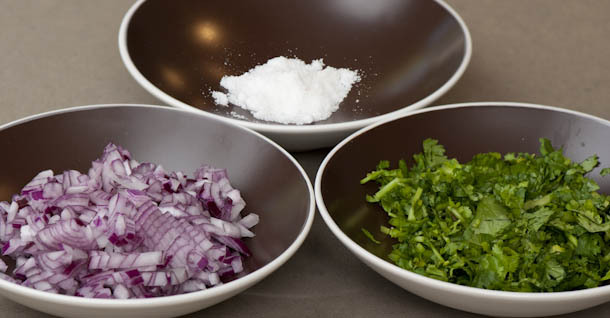 So, let’s get down to one of the basics of any dish. What is it? 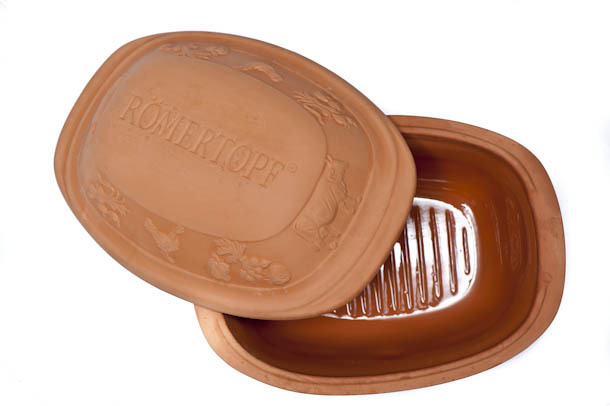 The type of pan used? 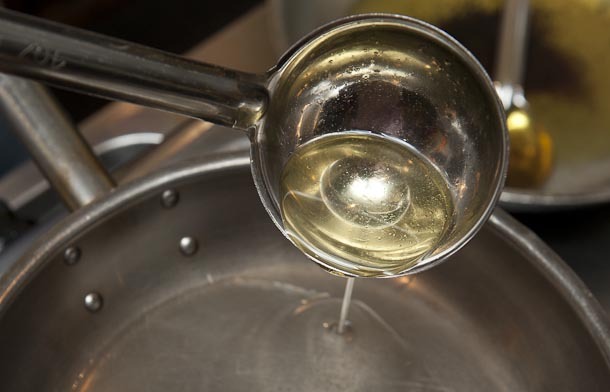 Cast iron or copper, or is it the oil that should be used? Or the sort of bread that should accompany a dish? No folks, none of these is the basics of a dish that I want to discuss [though hold your breath because in the following year I will be touching on some of these]! 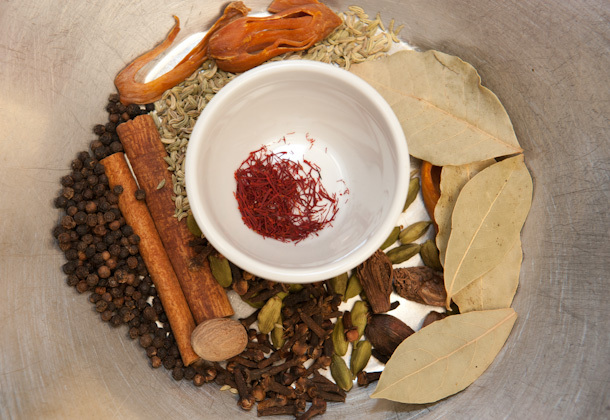 But for now I want to direct my attention to spice mixes. 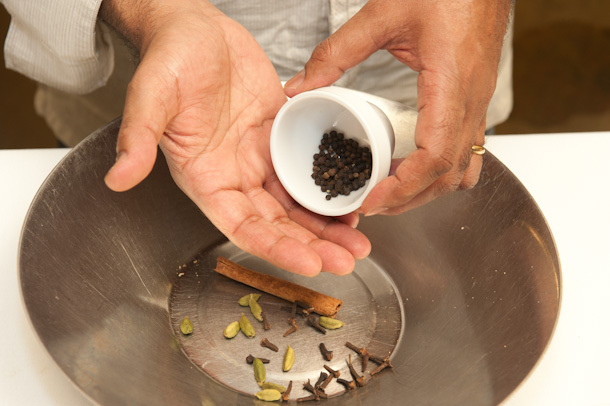 This week I want to show you how to make, step-by-step, six spice mixes that we use in my kitchen at nilgiri’s. 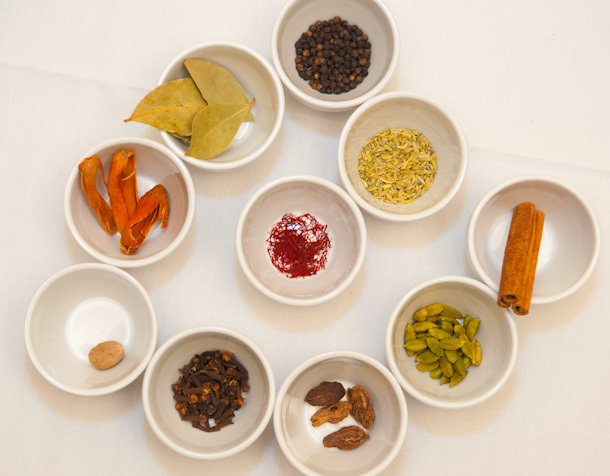 Next week I’ll be using one of the spice mixes and over the next SIX weeks I’ll be be using all six spice mixes that I am explaining today. 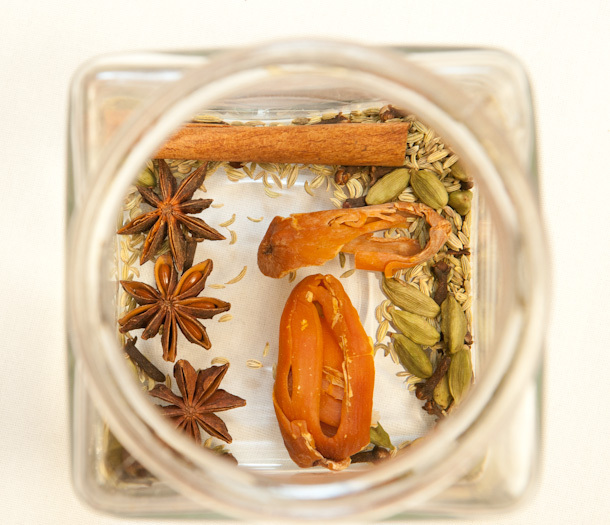 If you want to make the recipes in the coming weeks that use these spice mixes, get started and make all six now – since they’re spices, they won’t ‘go off’, in fact, the more they’re left to ‘talk’ to each other in the jar, the more infused and enthused they’ll become! 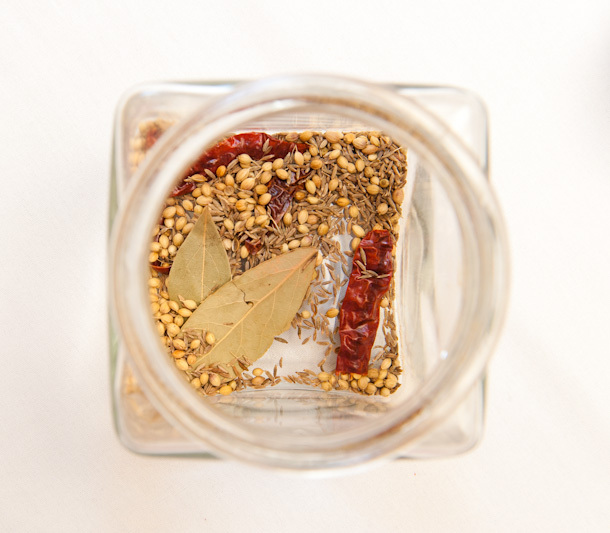 But you must store your spice mixes in airtight glass jars that are kept away from direct heat, sunlight, or any moisture. 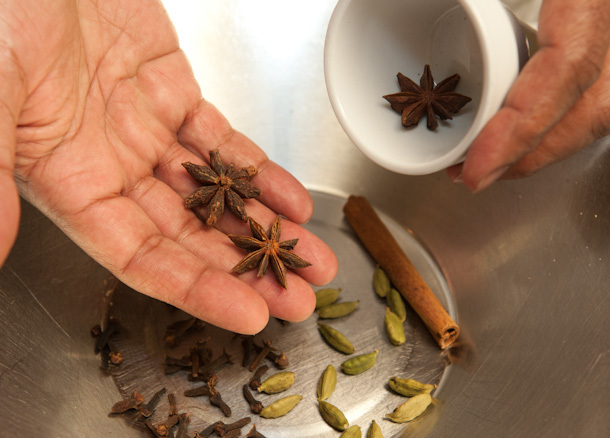 If you get this right your spice mixes will be perfect for months. Okay, so let’s start. 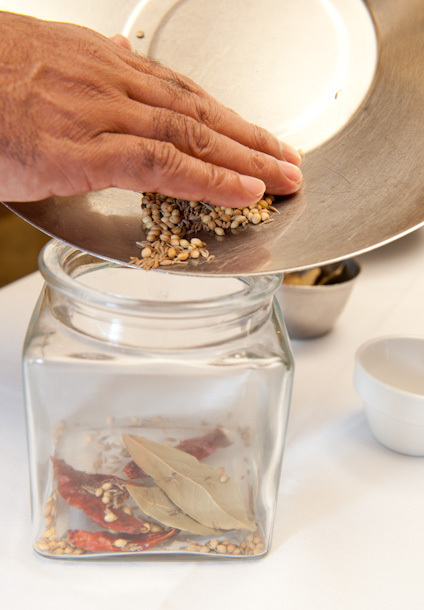 You’ll need whole spices and six separate airtight glass jars and once you’ve got that, you’re sorted (of course, you can make one, or two, or all, or none of the spice mixes!). The choice is yours. 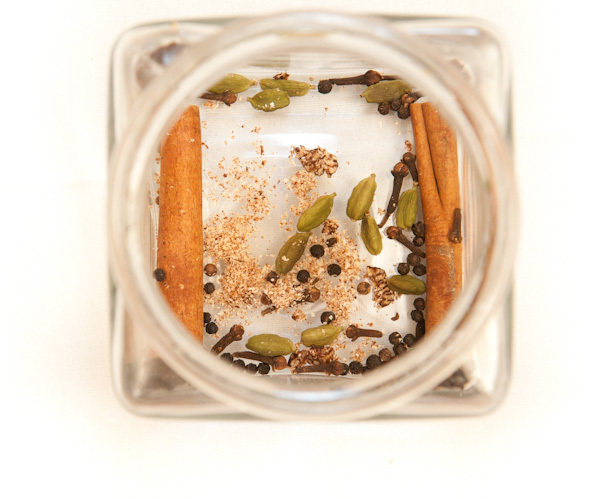 Anyway, the first garam masala mix that we’re setting up is for seafood. I call this one, guess what? Seafood GM, not too romantic I know, but it does its job and is a sensible name. 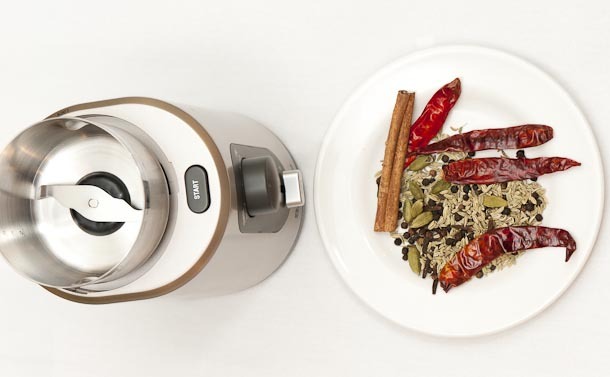 Starting clockwise you have: 1 cinnamon stick, 1 teaspoon cardamom pods, 1 teaspoon cloves, 2 teaspoons black peppercorns, 3 dried red chillies and 2 teaspoons fennel seeds. 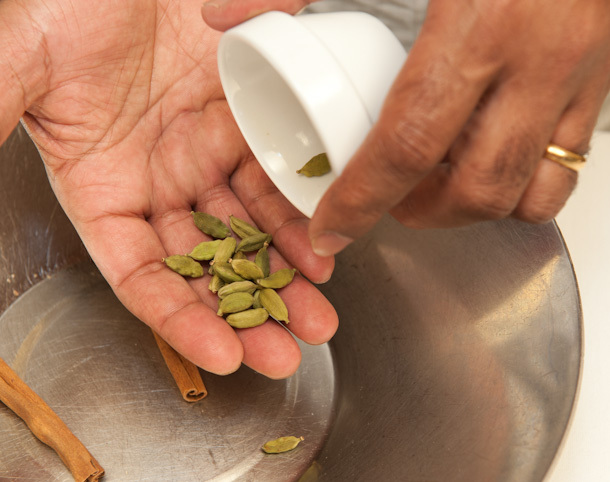 As its name implies, this is great for flavouring vegetarian dishes, including dishes made out of paneer, or cottage cheese, or fresh cheese…I like to think of it as my “vegetarian garam masala”. You can call yours what you want but trust me, it’ll taste superb. 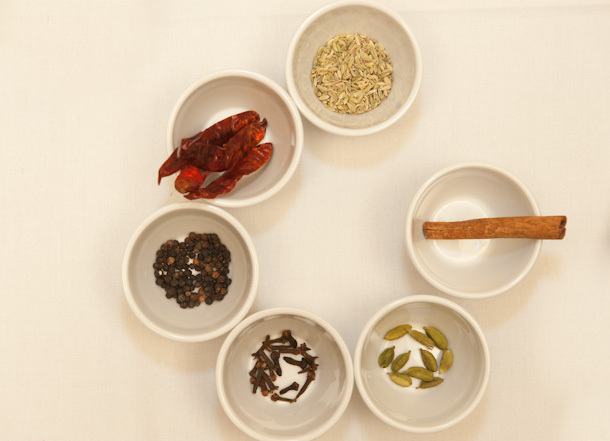 Starting clockwise we have: 2 teaspoons coriander seeds, 2 1/2 teaspoons cumin seeds, 2 bay leaves and 3 dried red chillies. 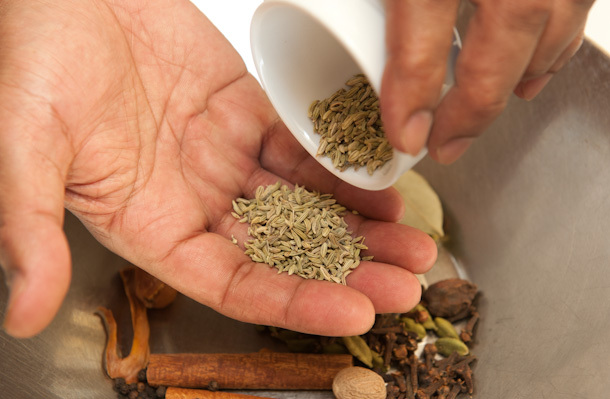 Poultry garam masala is as follows: 1 cinnamon stick, 2 teaspoons cardamom pods, 1 1/2 teaspoons cloves, 3 star anise, 2 teaspoons fennel seeds and 2 teaspoons mace blade. Voila! All ready for storage. 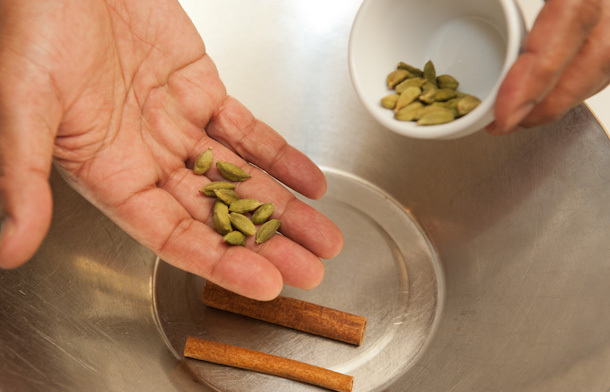 Starting clockwise: 2 cinnamon sticks, 1 teaspoon cardamom pods, 1 teaspoon cloves, 1/2 nutmeg and 2 teaspoons black peppercorns. 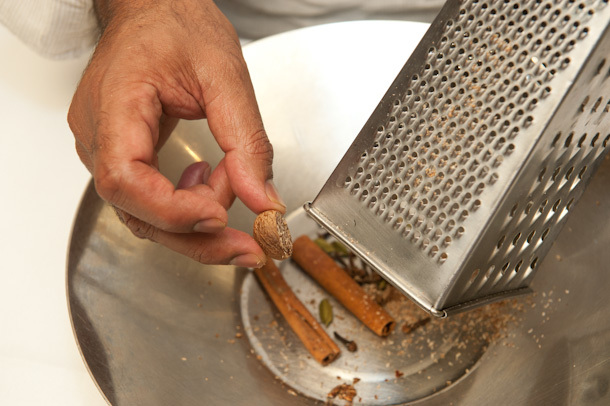 Yes, you’ll have to grate your nutmeg! 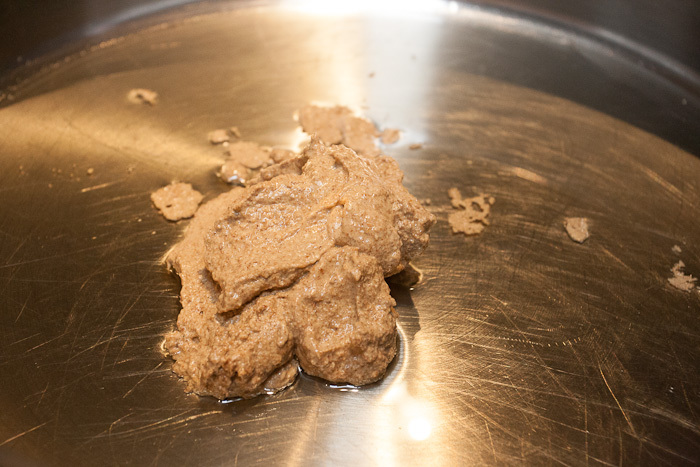 The final product for red meat garam masala! 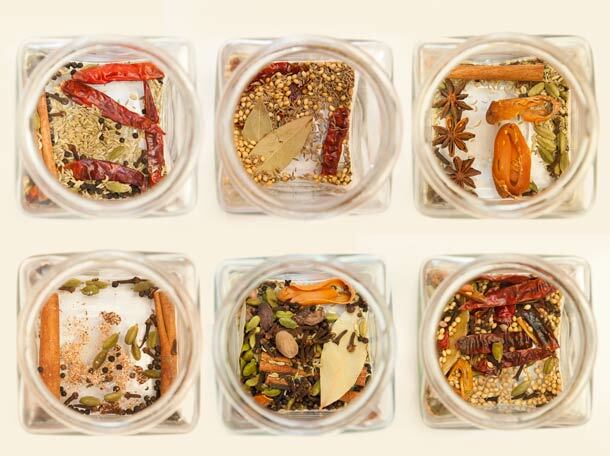 From clockwise: 2 cinnamon sticks, 2 teaspoons cardamom pods, 4 black cardamom pods, 2 teaspoons cloves, 1 nutmeg, 3 spears mace, 4 bayleaves, 2 teaspoons black peppercorns, 2 teaspoons fennel seeds and 1 teaspoon saffron threads. 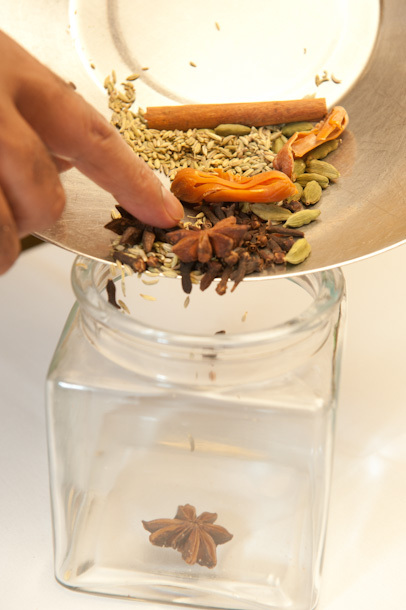 Place all spices into the glass jar,except the saffron. 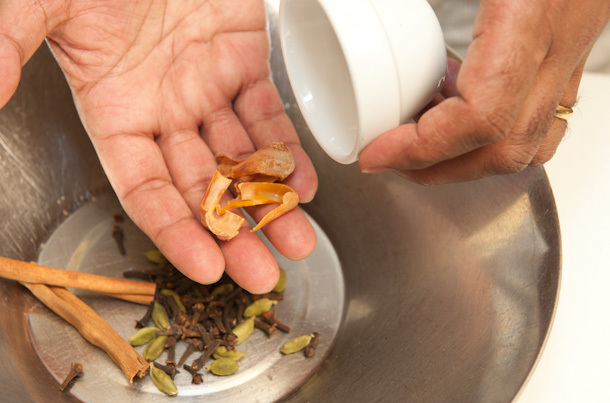 Place the saffron in a separate container as this will be soaked in milk when we use it for our recipe for the biryani!!! 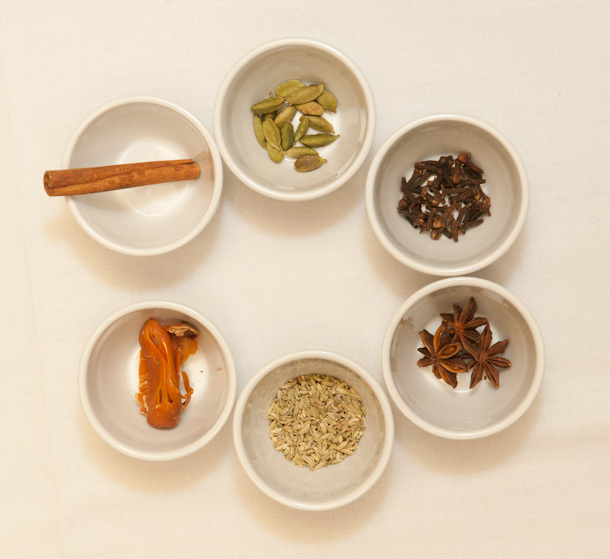 Starting from clockwise: 2 cinnamon sticks, 12- 15 cardamom pods, 2 teaspoons cloves, 3 mace spears, 5 dried red chillies, 2 teaspoons coriander seeds, 2 bay leaves and 1 teaspoon saffron threads. 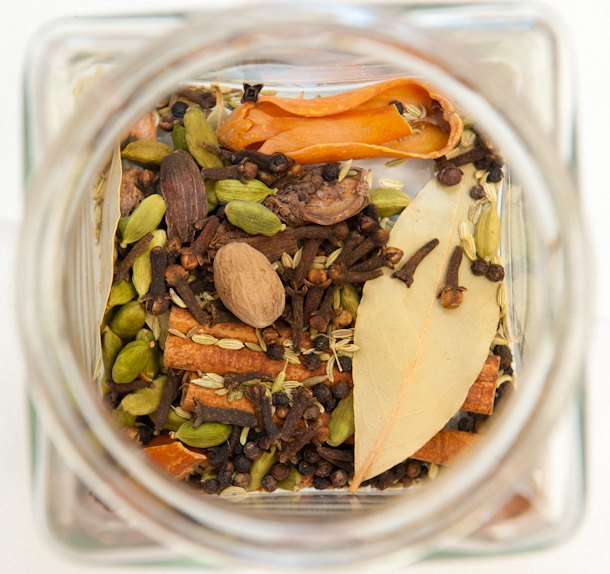 Here is your melange of kebab garam masala without the saffron. 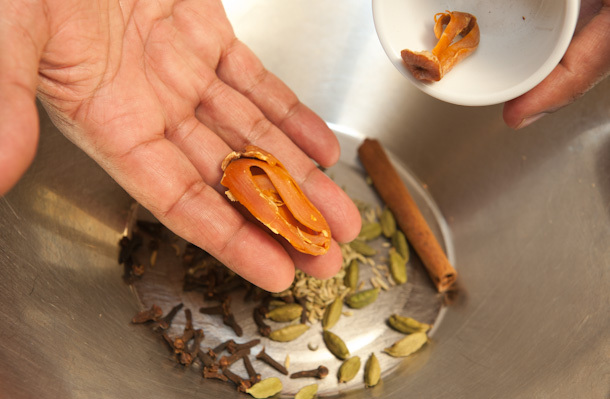 Place saffron in a separate container. Ready to be stored. A visual feast! Phew!!! 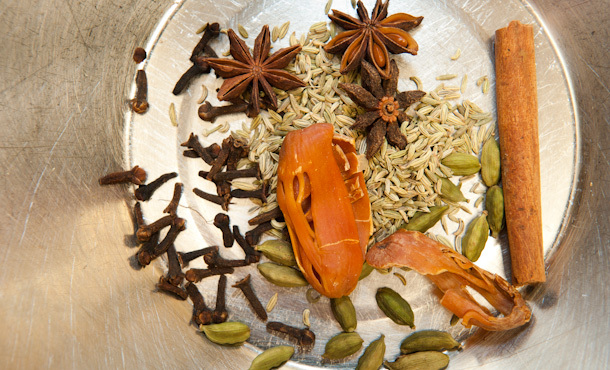 Once done we will use each one of the above spice mixes to create a dish starting with the seafood spice mix next week. 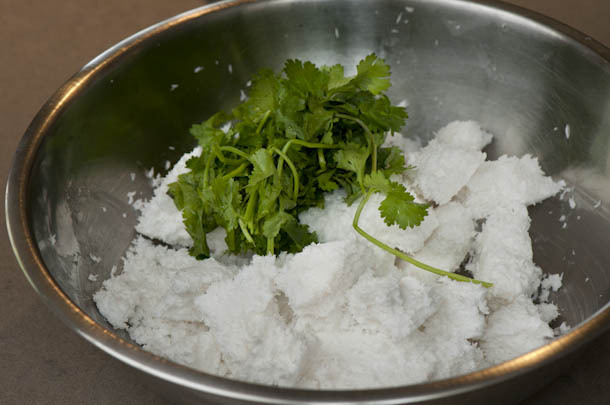 My plan is to create a southern style fish with coconut. Posted in Basics, beef, chicken, Classic meals, Cooking, fish, goat, lamb, prawn, Recipes, Restaurant photography, Rice, vegan, vegetarian and tagged biryani, foodie, indian, kebabs, poultry, recipe, red meat, seafood, spice mixes for vegetarian, vegan. Bookmark the permalink. 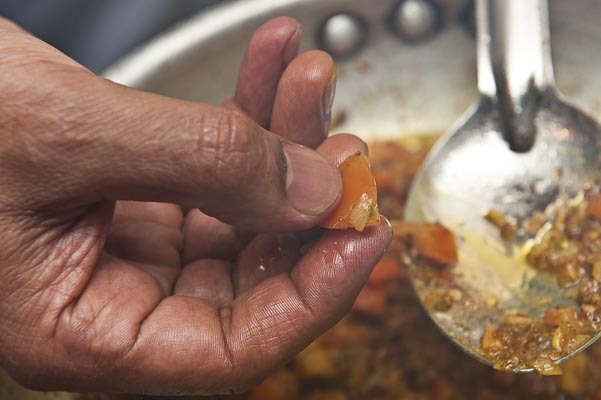 1.2 billion people, 5 regions, 32 states, 14 official languages, 100s of styles of cooking, and just one dish called CURRY!!! 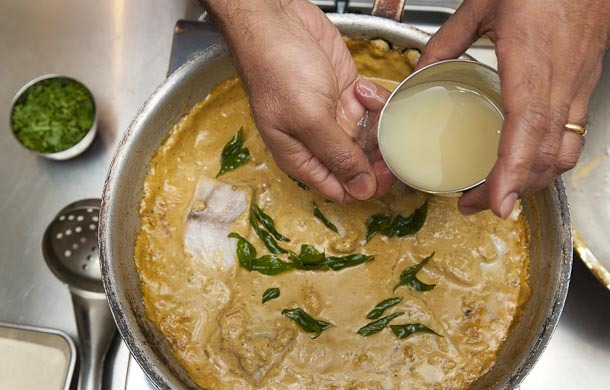 How is it that this huge country called India, with such a long history and so many cultures, can end up being known for just one dish – “CURRY”? 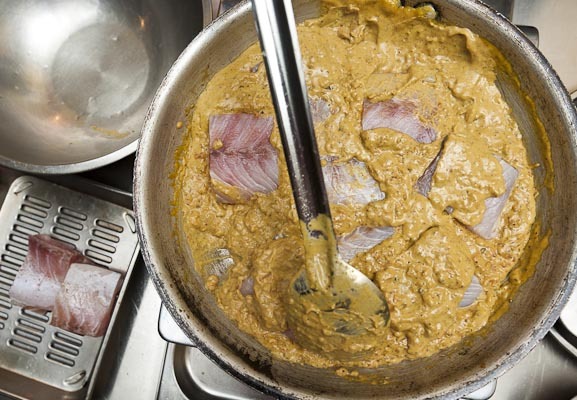 How is it that this country, which exports besides so many other things the ‘brains’ for the rest of the world, has only one dish to offer to the world – “CURRY”? How is it that a country with at least 32 states called Andhra Pradesh, Madhya Pradesh, Uttaranchal, Kerala, Karnataka, Punjab, Bengal, Maharashtra, Gujarat, Goa, Assam, Megahalaya, Rajasthan . . . and so many more, each with its different culture, different language, and more importantly, unique style of cooking ends up being mashed together and cooked in a pot like its invented cousin, with a few spices added, and it’s called simply, wrongly, only! “CURRY”? But what I do know is that it is time to clarify this. To put an end to this myth. We must start somewhere. 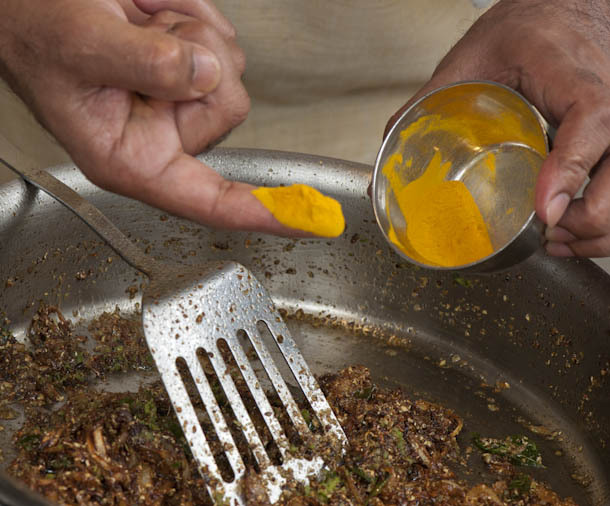 Let us acknowledge the land that gave us cricket, the civil service and ‘curry’. Well, we’d love to keep the first and the second but, and with due respect to all my English friends, I don’t want the curry!! And why is it that I don’t want the curry? 1. 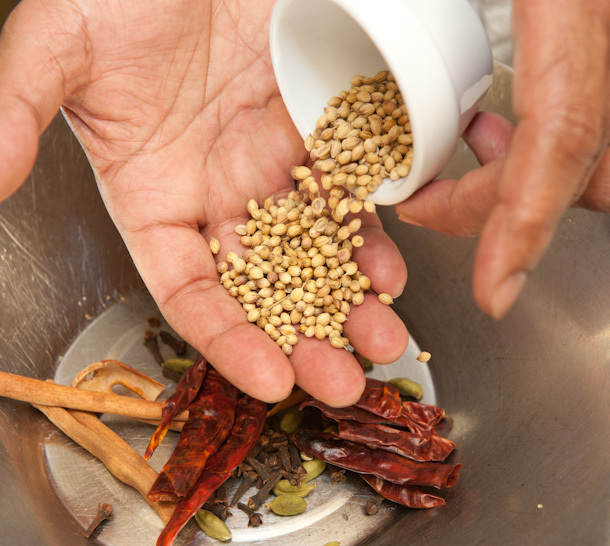 It is a term that is derived from, and is a corruption of, the Tamil word kari meaning a pepper-flavoured ‘sauce’, or ‘gravy’. 2. 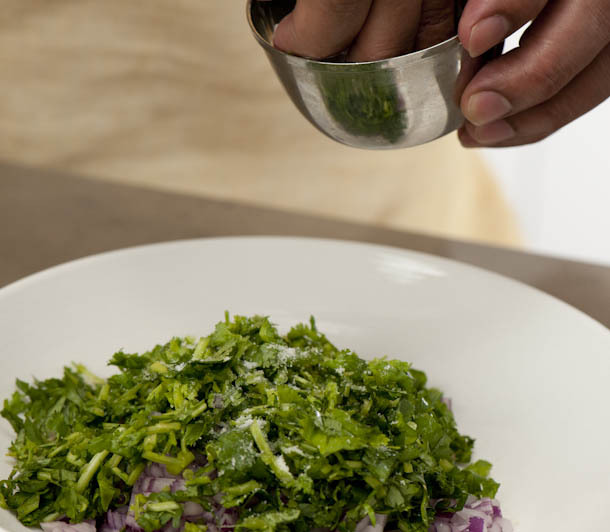 Not all Indian dishes come with a gravy, or a sauce, and they are not always cooked in the same way. 3. 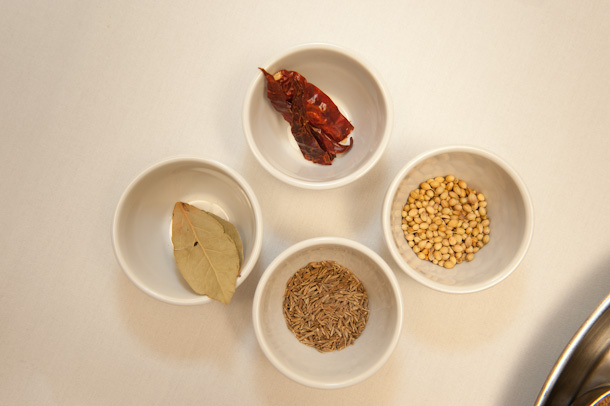 For example, some are slow cooked and then tempered, or given a tadka or a chonk or a baghar or a vagharne [all are different words for tempering] to preserve the dish and also to enhance the flavours, like phodni cha varan [slow-cooked lentils] from Maharashtra. 4. Some are fried [tali hui] like the tali hui machchi [fried fish] from Hyderabad and machchi Amritsari from the Punjab, of course. 5. 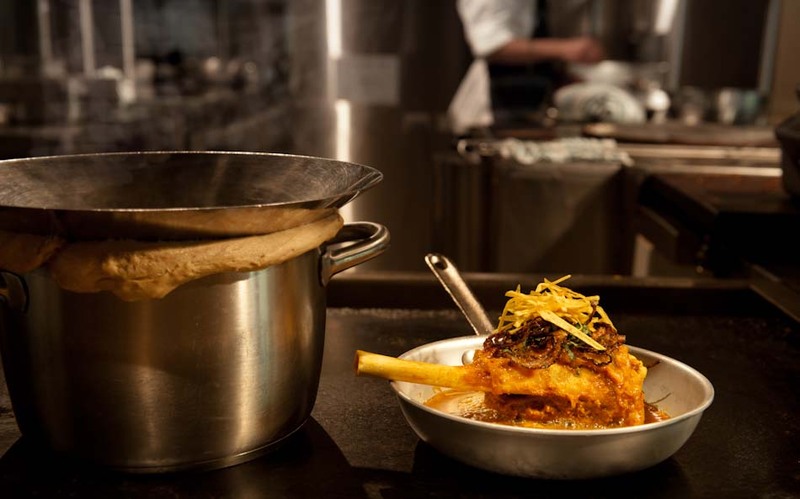 Yet other dishes are bhunaoed and are sukha, like the slow-cooked bhuna gosht [slow-cooked, dry lamb or goat with crushed coriander seeds] from Bhopal and kandya cha jhunka [tossed green onions with mustard and curry leaves] from Maharahatra. 6. 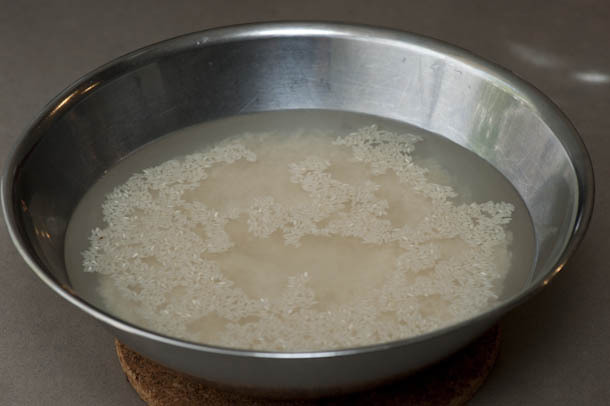 Some are steamed, like the idli [steamed rice cakes] from AP, Karnataka and Tamil Nadu, or like the patra ni machchi [fish wrapped in banana leaves in a green herb chatni] from Gujarat. 7. And then we have those that are pan grilled, like the dosai [pancakes] from TN or the adai from Karnataka or the pesaruttu from AP. 8. And let’s not forget the oven! 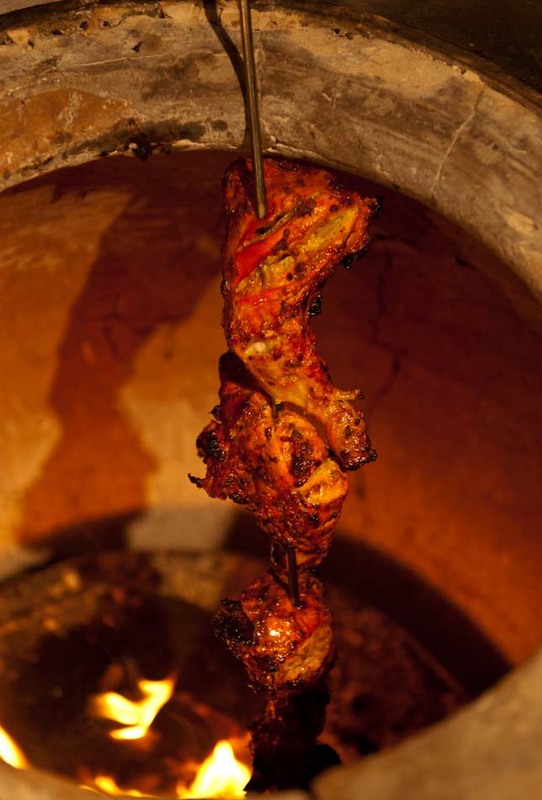 Some dishes are oven cooked, like the tandoori chicken, ah, that’s a familiar one to you all, from the Punjab. 9. Some are baked as well, like the double ka meetha [bread and butter pudding laced with dried fruits and nuts] from Hyderabad. 10. 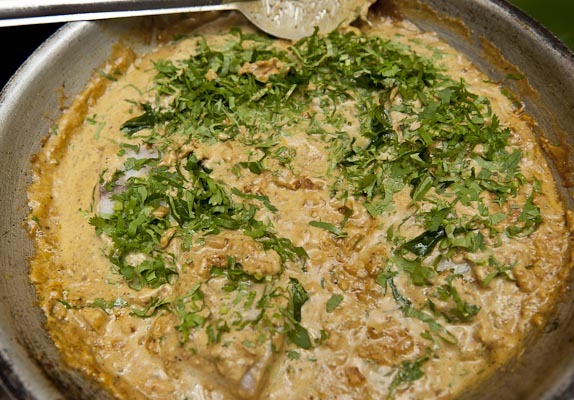 Yet other dishes are cooked in their own juices like dum ka murgh [slow cooked chicken in its own juices]. 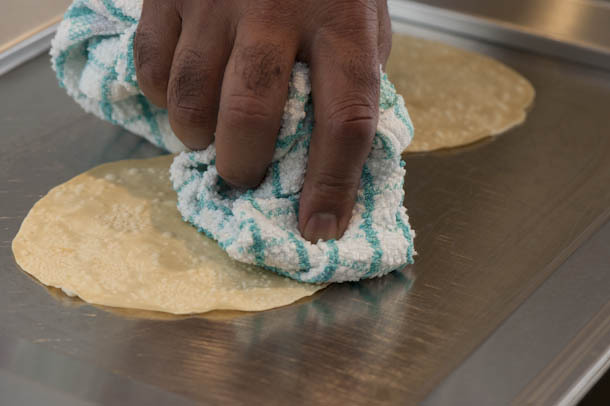 There are so many more dishes and styles of cooking that exist in this vast land but we can’t sit here all day thinking of them and I’ve got to get a move on with what I want to do. And so, what is it that I want? Firstly, I would like every dish to be written in its own script, e.g. 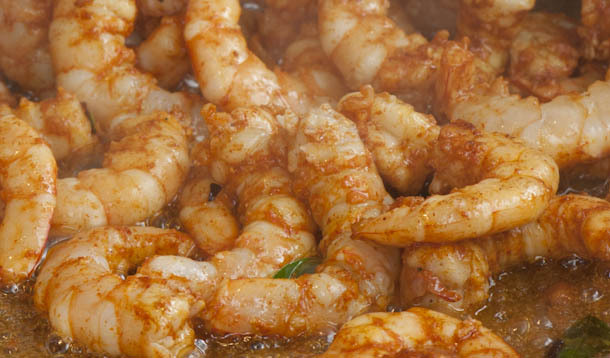 kozhi varuval [fried chicken] or yerra varuval [spiced and fried prawns] from TN, and etc. 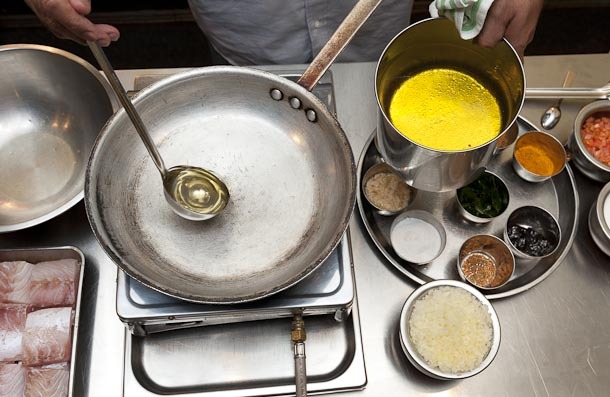 Secondly, every dish that is written down should describe its unique style of cooking, e.g. paththar ka gosht [stone-cooked lamb with cassia and black peppercorns]. Third. 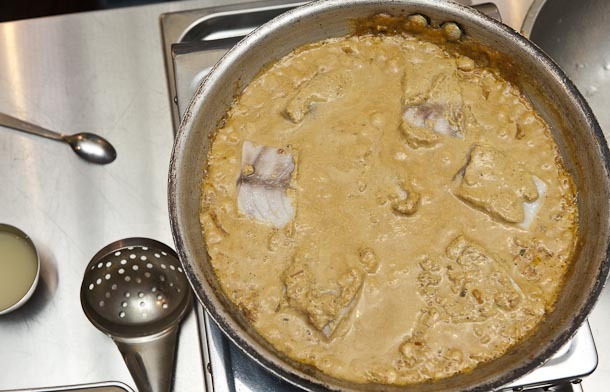 Every dish that belongs to a certain area in India must be acknowledged where it comes from such as a Bengali-style macher jhol [fish cooked in mustard oil with five spices] and etc. And lastly, whilst we’re acknowledging where the dish comes from, let’s also nod our heads to the creator of the dish, e.g. 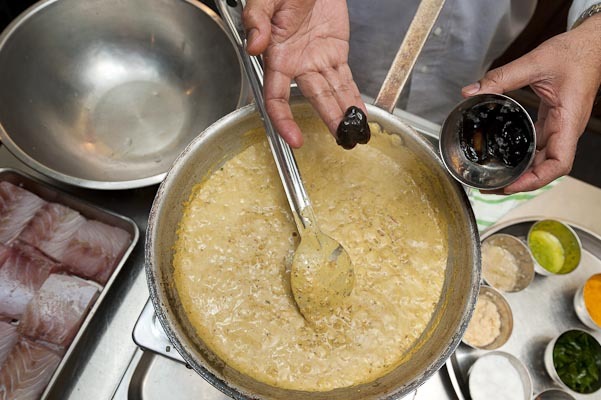 Imtiazi dal bukhara, should be known that it exists in honour of the great Imtiaz Qureshi who revived the art of dum cooking [where a a double-glazed pot is used to keep the dish piping hot]. And so, what will all this reverential head-nodding and acknowledgement achieve? 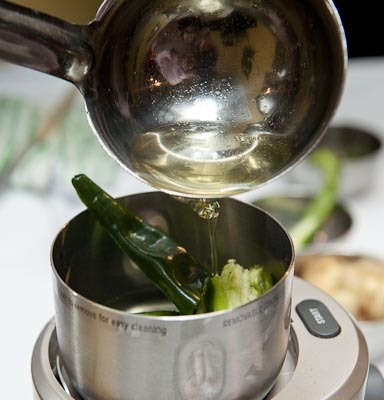 First of all it will bring a sense of discipline amongst us chefs as we will follow a certain style of cooking when creating a dish e.g. 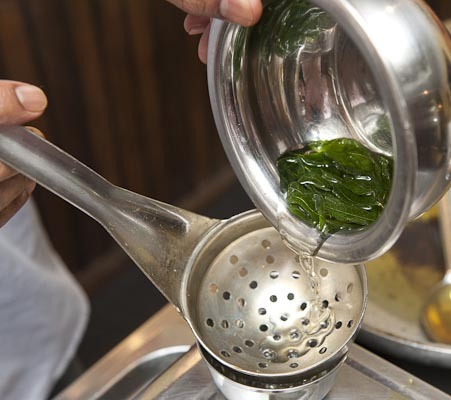 for patra ni machchi we will steam the fish in a banana leaf that has been tempered to retain its colour!! 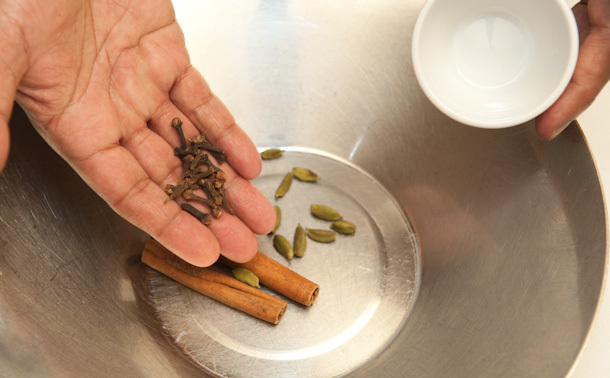 Secondly, it will give us a sense of direction as we will have something to compare and contrast our dish with, so for example, we will know that a thakkali rasam should look and taste a certain way. 3. 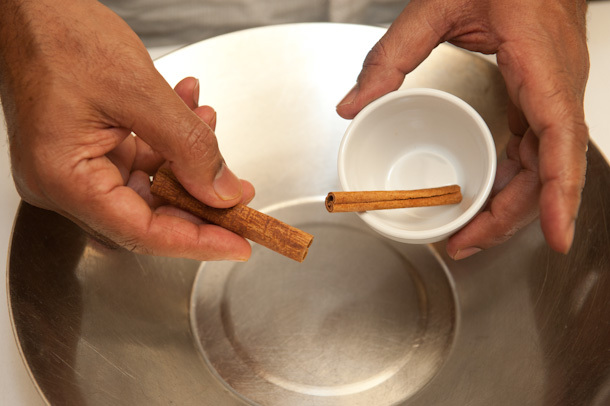 It will also bring out lots of creativity and twists on established traditions. 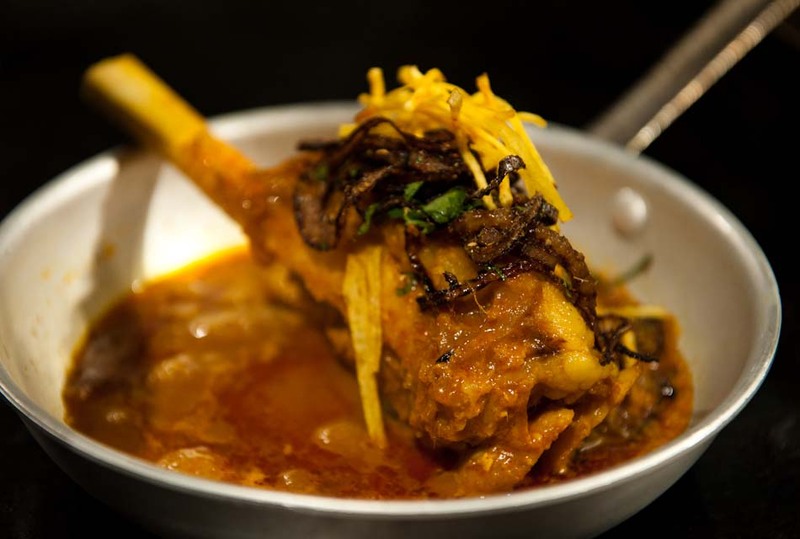 For example, imagine cooking a lamb shank nahari using the dum style of cooking!! How do we go about achieving this? 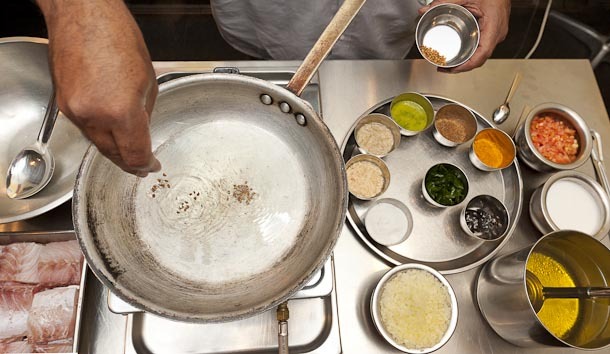 Well, primarily we need people who can talk knowledgeably about the different styles of cooking in India through the social media, through cooking classes, at food festivals, and etc. Satish Arora. This man is an absolute champion, and my hero, and would fit into this league of Brand Ambassador perfectly. Unfortunately, age may be against him today. Arvind Sarawast. This is the man who was responsible for planting the seed in my mind some 25 years ago with his book Prashad. Unfortunately, again like Arora saab, age is probably against him. Imtiaz Qureshi. 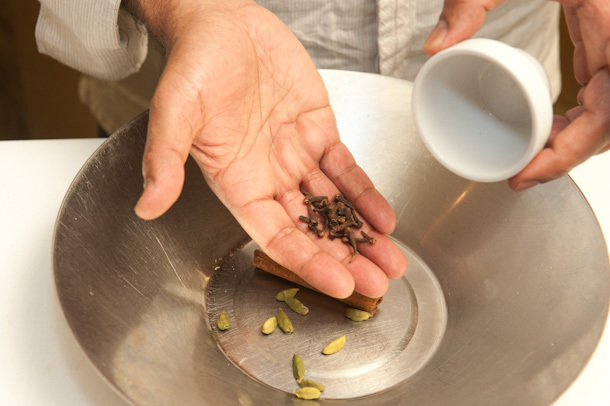 This is the man who single-handedly revived an ancient art of cooking from the region of Awadh, and took the Bukhara Restaurant, at the Maurya Sheraton in New Delhi, to the top 50 in the world! A big Salaam to this master. In his prime, and with that impressive moustache, he would have been the one. It’s just a bit late in the day for this master who’s well into his seventh decade on this plant, but hopefully still going strong. 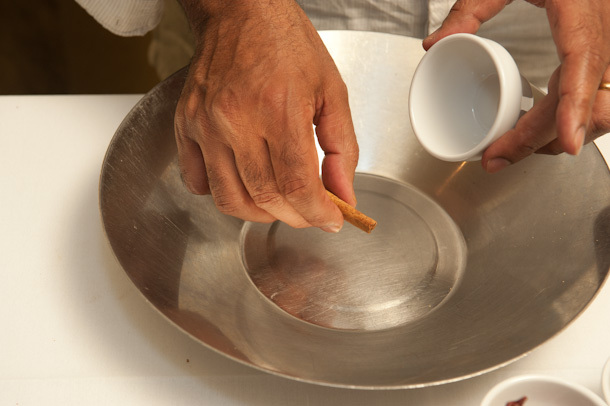 Atul Kochhar. 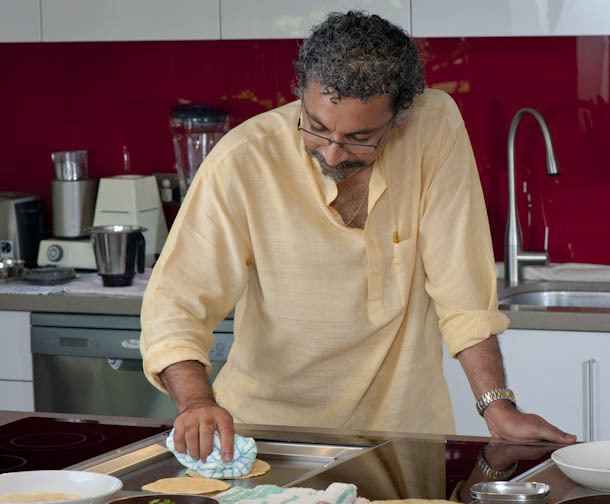 This guy is probably the most awarded Indian Chef in the world with a few Michelin stars under his belt. I’m not sure if he would have the time to take up this role as he’s got restaurants springing up all over Europe! A V Sriram. 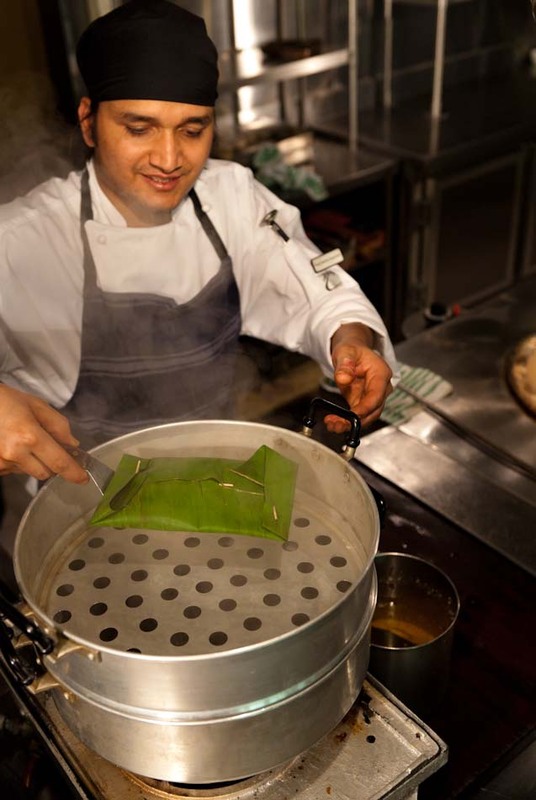 A highly-charged and innovative chef who won a Michelin star last year for his restaurant, Quilon, in London. I have known Sriram for nearly 23 years when we started the Karavalli in Bangalore. Though I’m no longer in touch with him I have kept a track of his progress and rise to stardom. Like Atul, Sriram may be too busy with his commitments to be able to devote time to being a Brand Ambassador! Well, it brings me to the two British chefs who I consider ‘geniuses’ in their fields, namely Heston Blumenthal and Gary Rhodes. Blumenthal is the man behind the Fat Duck Restaurant in England who’s a very intelligent and creative chef who has always strived for ‘perfection‘ and brought a TV series with that very title: In Search of Perfection. With a busy schedule and commitments around the world, I’m really not sure if Heston would be able to give us the time! 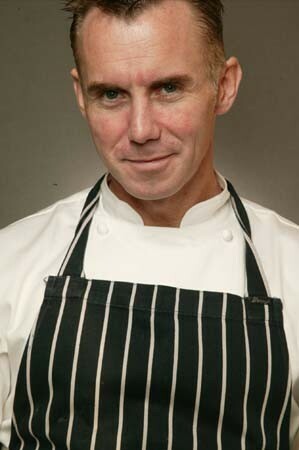 And secondly, Gary Rhodes. 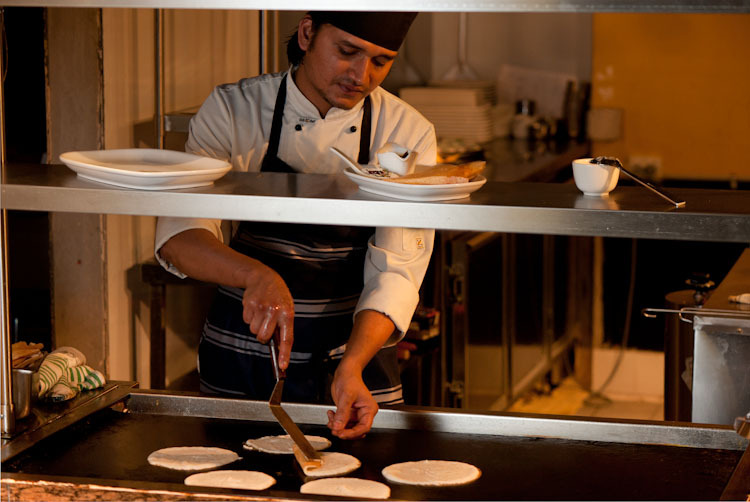 Now, here‘s a chef with an easy style of presentation and a very friendly face. This is my ‘man’. My Ambassador. 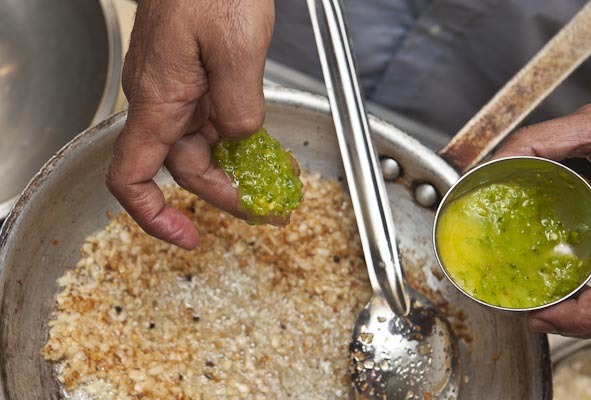 His show Rhodes Across India was, and still is, one of the best ‘feel good’ TV shows that portrayed Indian food in its true form. The show was aired on Australian TV a few years back. I watch it every time it makes a reappearance. His style is unobtrusive so the focus is not the presenter but the food! He is my ideal Brand Ambassador, first and foremost for refuting the myth that Indian cuisine is “just a curry”!! 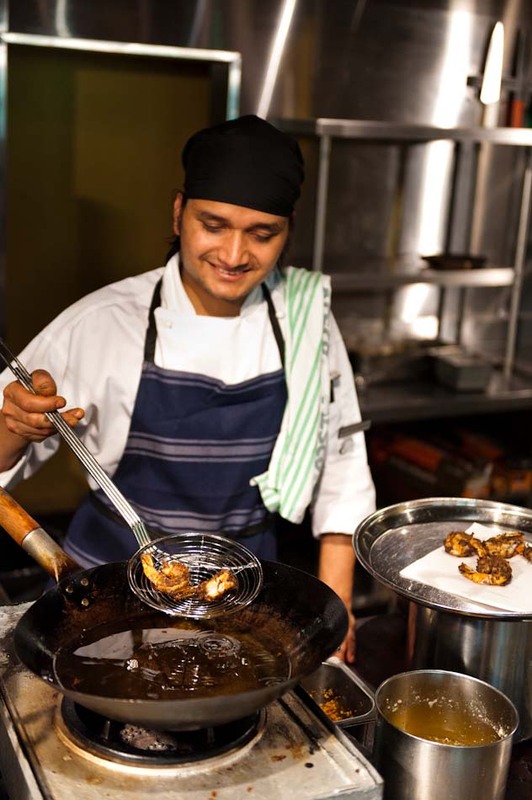 And what role do Indian chefs play here in Sydney (where my restaurant is)? 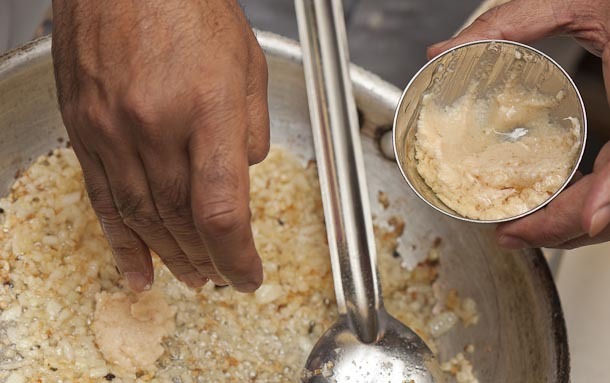 Well, as passionate chefs who think Indian cuisine is the best bl..dy cuisine on planet earth we have a big part to play. If he had the time, I would like to have Gary do a food promotion in my restaurant showcasing cuisines from the different parts of India. This promotion could be held, say, over a week with each day given to different dishes. 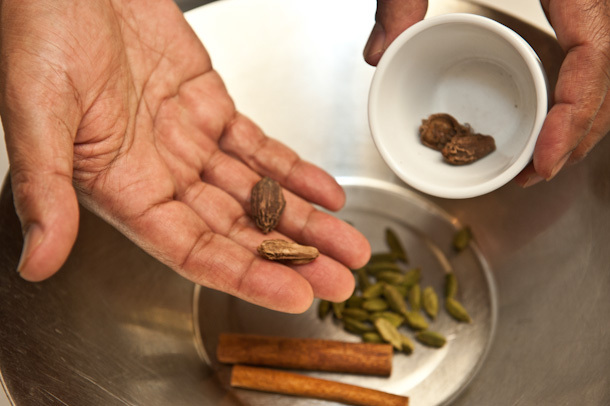 Just imagine what an impact this would have on nilgiri’s chefs who could show off their particular cuisine with pride (my chefs each specialise in the regional cuisine where they come from). I am sure other chefs would do the same in their establishments. 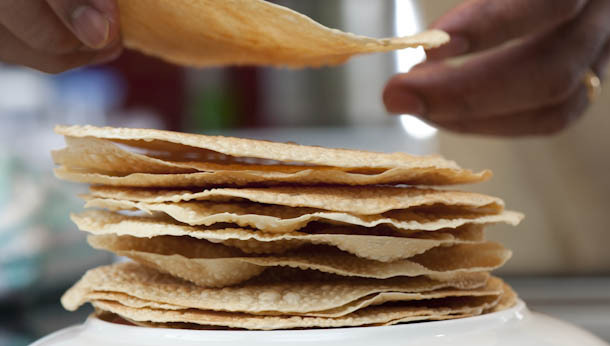 Indian diners would also be proud to have the food from their area showcased (just as much as a Scot is as proud of his cuisine as is, say, an Italian from Piedmont!). 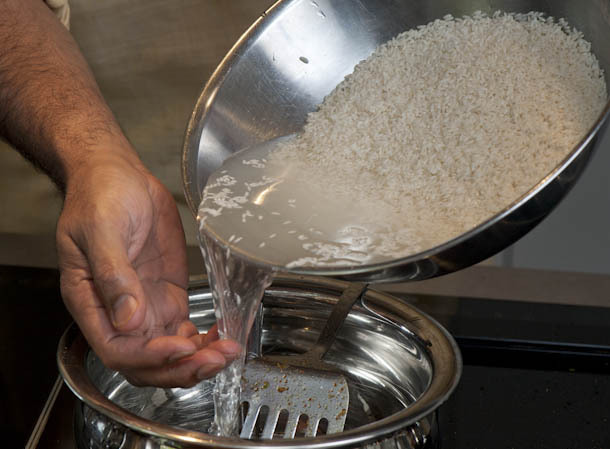 To further educate people about our food, I’d like to see Indians living in different parts of the world (from Silicon Valley to Sans Souci) invite an Anglo Saxon family (at least once a month) over for a meal and cook dishes which bring back memories of their childhood, just like a French person or an Italian does who has a story to tell about his or her favourite dish! 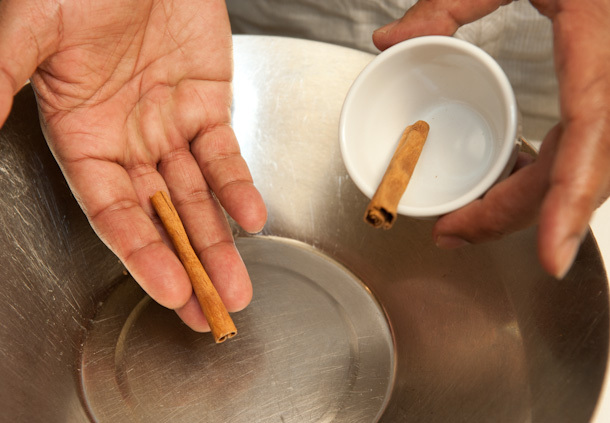 This way people would learn about the intricacies and diversity of our cuisine. We could all become Marcel Prousts eating our own versions of those infamous madeleines but in place of that delicacy would be a gulab. . .
And you know what people will realise? 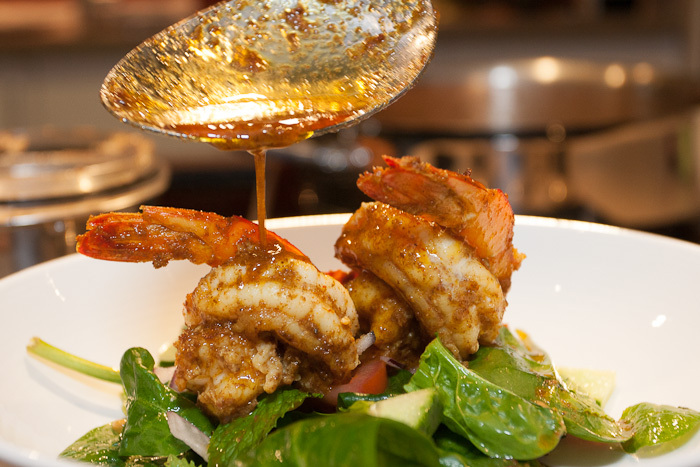 That there is a link between all cuisines whether it be French or Italian or Chinese or Indian. 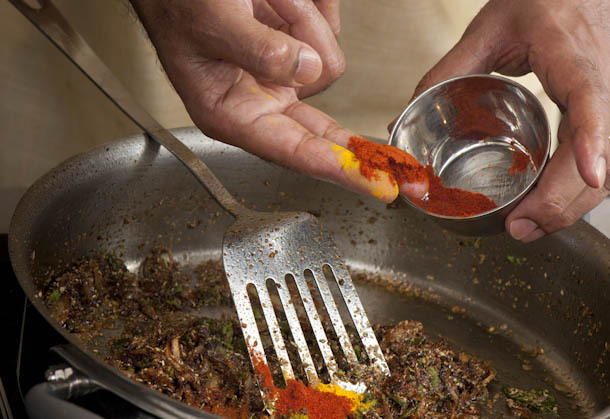 Here is the gosht nahari recipe, a classic dish from Hyderabad eaten along with a bread called sheermal. 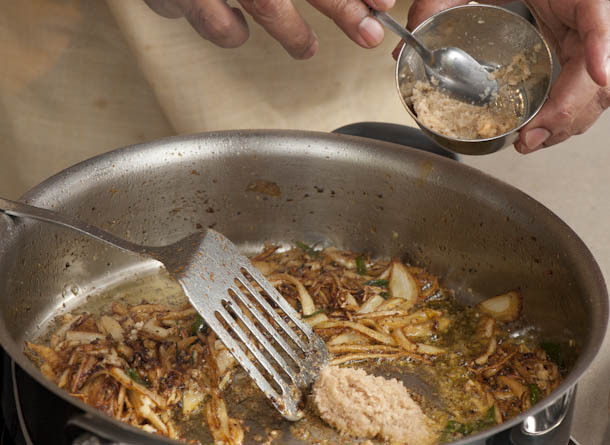 The dish is cooked using a 400-year-old technique called dum pukht. The French call it confit!! 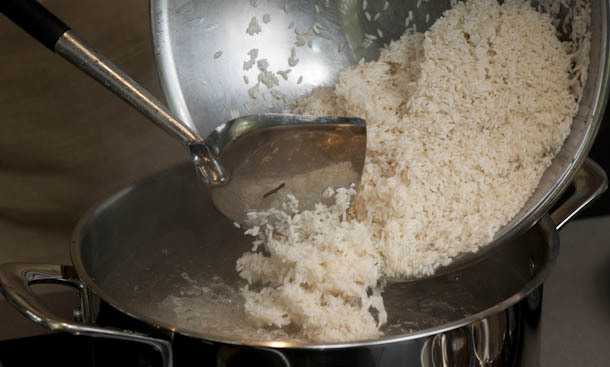 Posted in Basics, beef, bread, chicken, Classic meals, fish, lamb, prawn, Rice, vegetarian and tagged baghar, bhuna gosht, chonk, double ka meetha, dum ka murgh, foodie, gosht nahari, indian, jhunka, kandya cha jhunka, kozhi varuval, machchi amritsari, nahari, paththar ka gosht, phodni, recipe, sheermal, tandoori chicken, vagharne, varan macher jhol, yerra varuval. Bookmark the permalink. what is it . 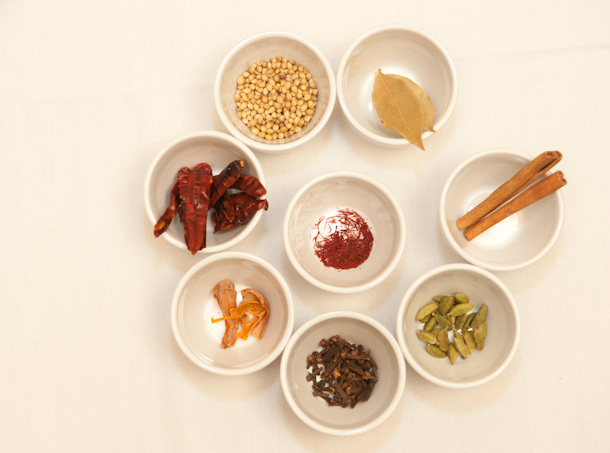 . . green chilli, red chilli, dry chilli, black pepper, white pepper? 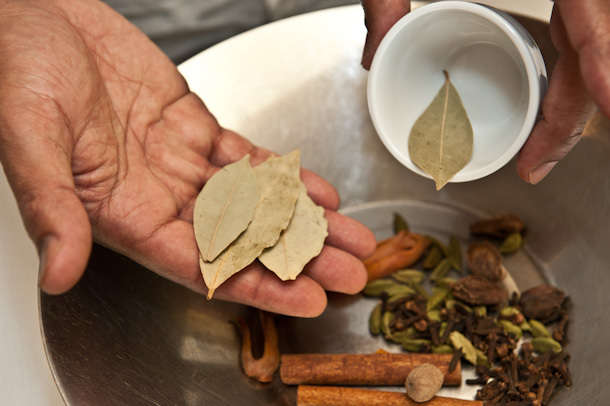 Well, you may be surprised to read this but nilgiri’s cooking classes are possibly the oldest cooking classes on Indian Food in Australia and are still going strong!! We started off with 26 classes a year (held on the second Saturday of each month) and today we do around 120 or so classes each year. Every class has about 12 participants which means about 2,400 participants attend the classes each year!!! 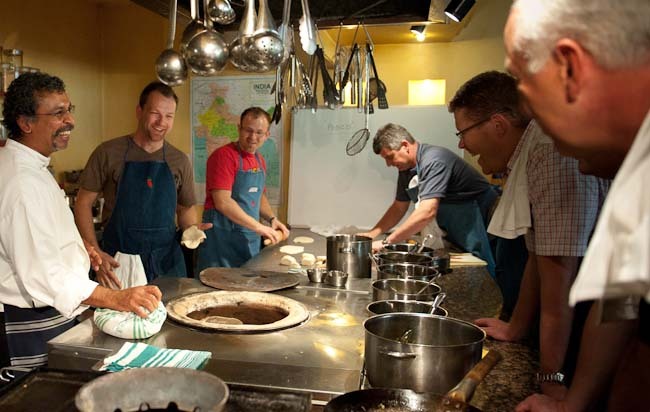 cooking classes can be for blokes too! 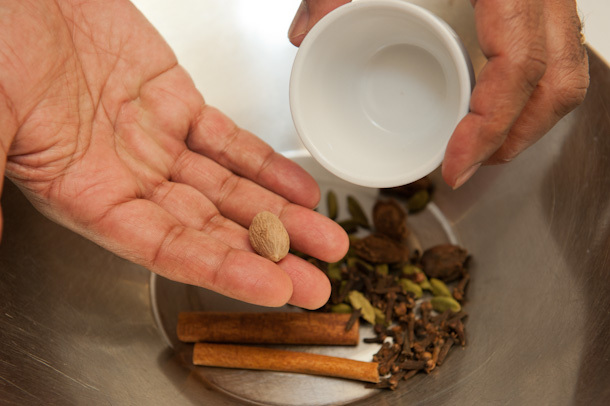 The aim of these classes was, and still is, not just to tell the world that Indian food is a little more than just ‘butter chicken’, ‘roganjosh’, ‘vindaloo’ and ‘chicken korma’, but also to try and answer some questions about the use of salt, chilli, ghee, spices etc. 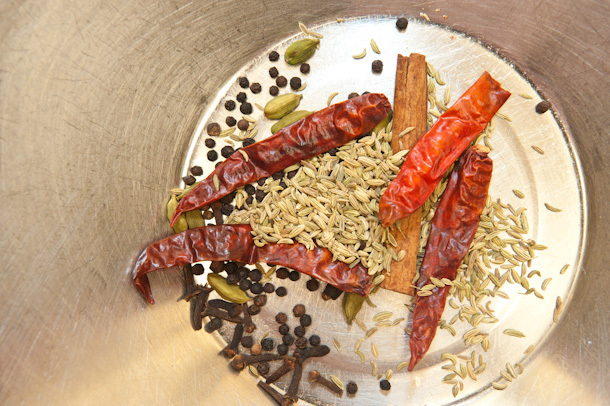 in Indian cooking. 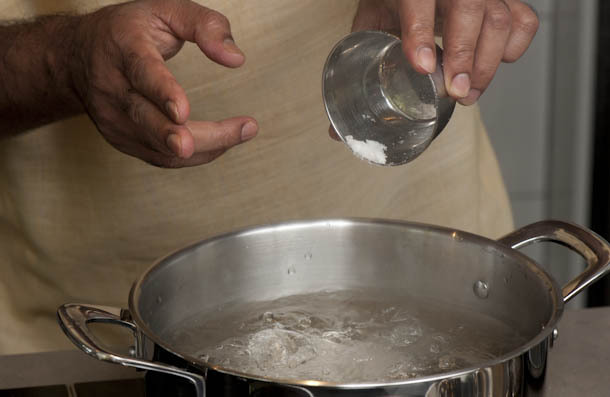 The last blog, “I’ve been cooking indian food all my life I don’t need to do a cooking class”, discussed some of the uses of salt in Indian cuisine. 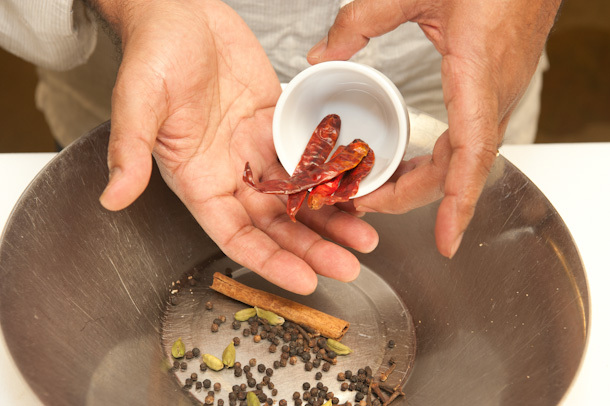 This week we will try and tackle the second- and third-most important ingredients: chillies and pepper! 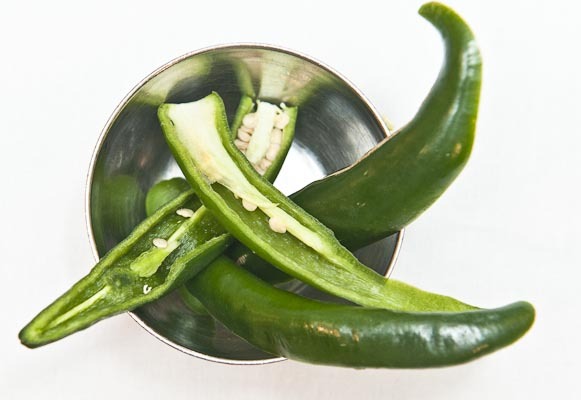 Firstly, chilli in India is called mirchi or mirapakaya and is not a native plant except for the naga chilli that is found in the region of Nagaland, a vibrant hill state located in the extreme north-east of India. 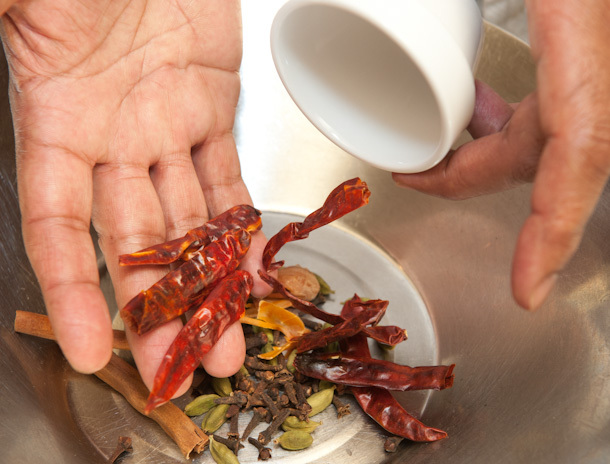 Chilli was brought by Europeans from the ‘new’ world as a trade with other spices in the 15th century and since then has become an integral part of Indian cuisine. 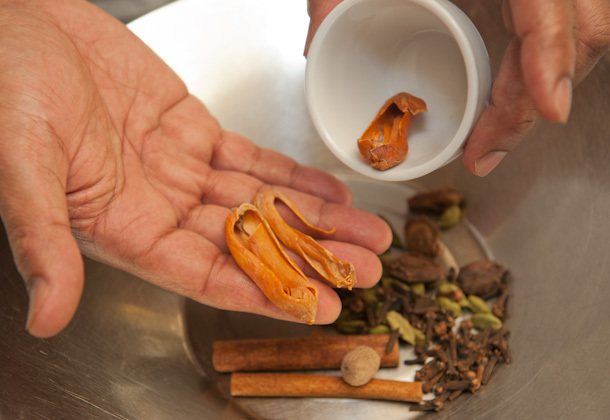 Before the introduction of chilli, pepper, a flowering vine native to India, was the main spice used. 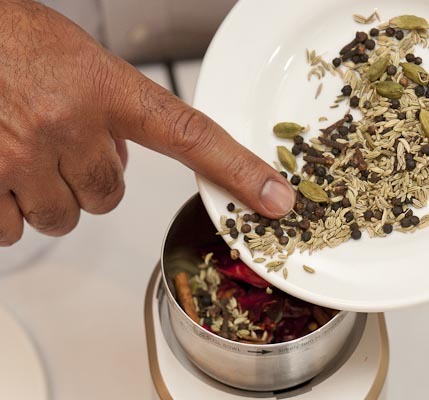 The word pepper is derived from the Sanskrit word pippali, which means ‘berry’. 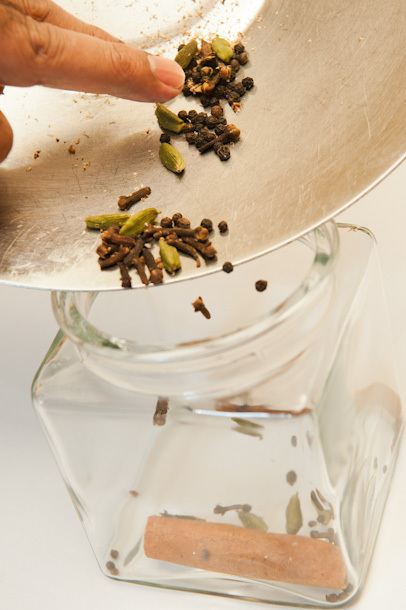 In India pepper is called mirch, milage or mirey. 1. Should I remove the seeds of the chillies or keep them? Ha! This one is my favourite questions. 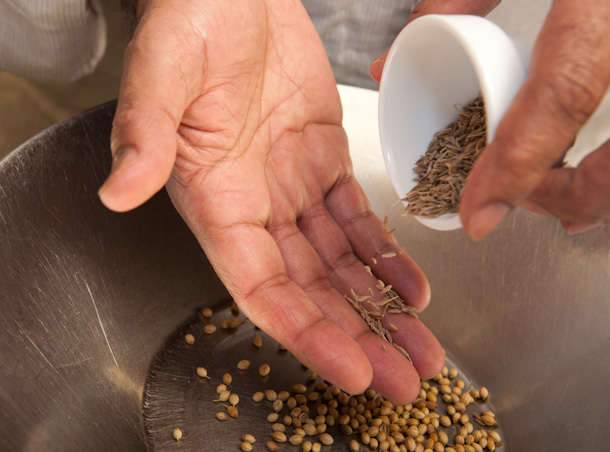 I ask participants what they generally do and most say that they remove the seeds. I will ask them why they do this and they will always say it’s because they think the seeds are hot. “Then why add the chilli in the first place?” I ask, incredulously but I already know the answer. “Because”, they reply, “the recipe says so.” I knew it! I can bet you my last dollar that no real cook will ever say or do this. 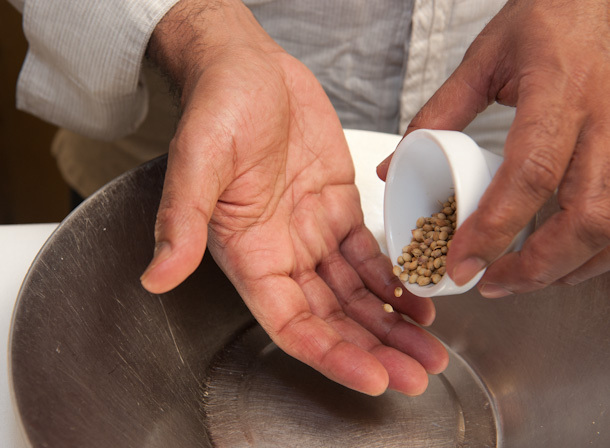 It is the absolute lack of knowledge and he/she who advocates removing the seeds has no bl..dy interest in you or your health and is feeding you with garb…e. 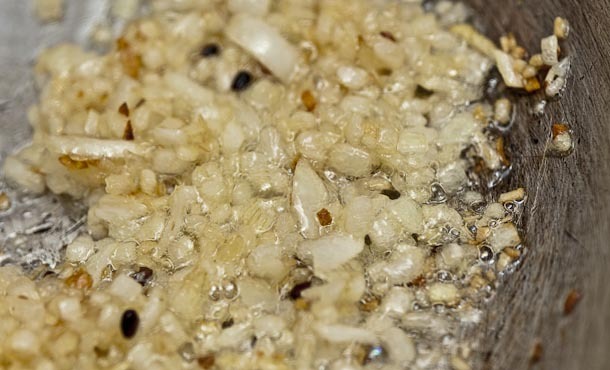 Dear friends, the seeds are where the real ‘stuff’ is. 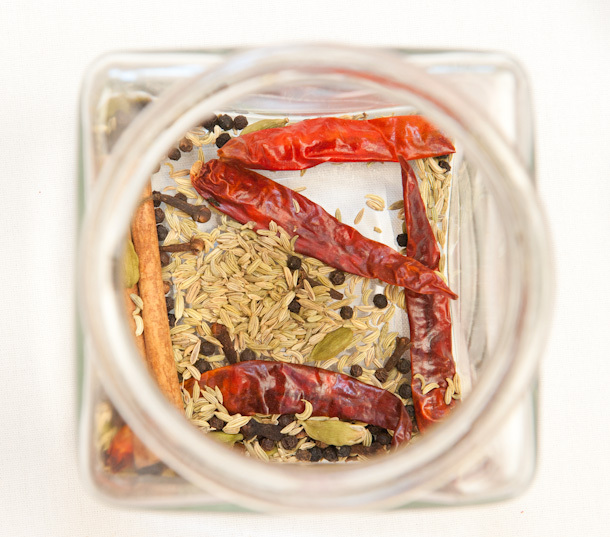 The seeds of the dry chilli help encourage perspiration, and perspiration causes a positive metabolic balance by cooling the body from the inside out. Sure, you sweat but it’s positive sweating! I grew up in a place called Hyderabad in the Deccan where the temperature can fluctuate between 36 C and 45 C throughout the year. We did not have a fan till the early 70s. Well, mum kept us healthy by adding dry chillies, not to all our dishes but to just one of them and that was enough to keep us ‘cool’. 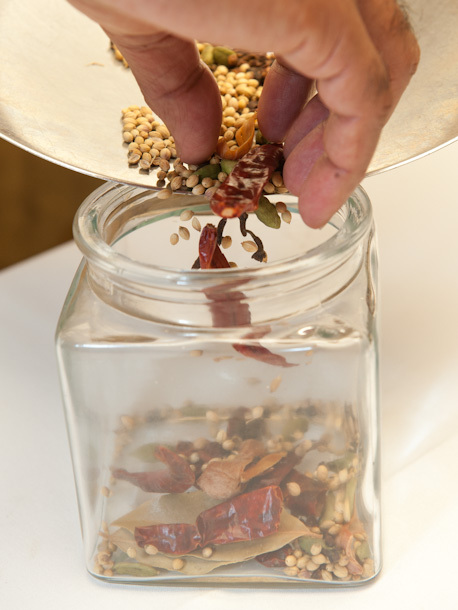 So, let’s get back to the seeds of our fresh chillies: they are loaded with vitamin C and are known to contain about eight times more vitamin C than fresh oranges! 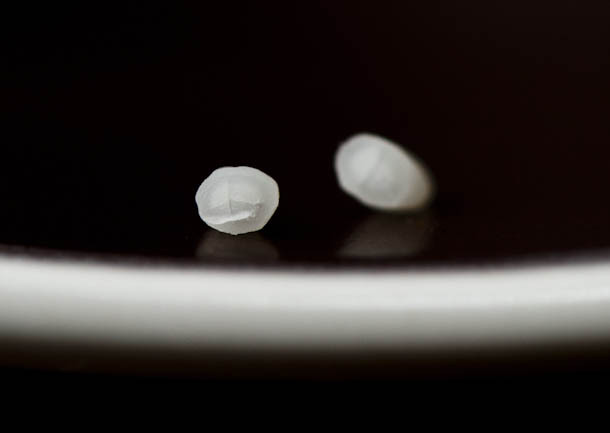 They’re extremely good at creating more saliva (you may have noticed this!). 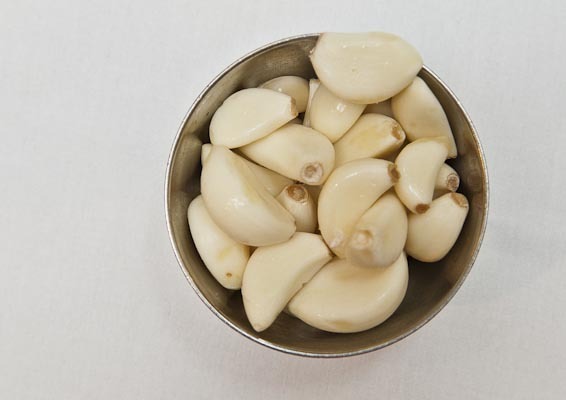 Saliva, I have been told, contains an enzyme called amylase. Amylase from our saliva breaks down the carbohydrates before it starts to accumulate in the intestines if not broken down fully. 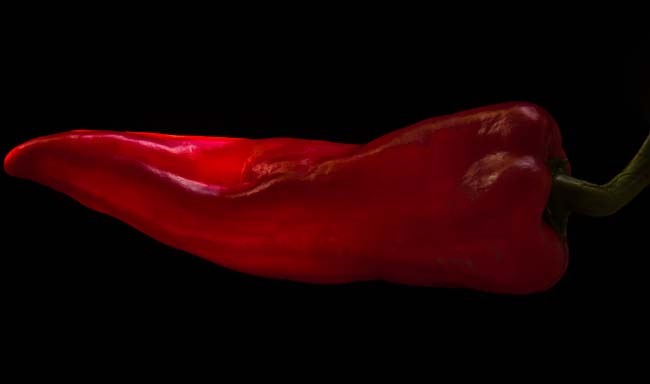 Now, I am not trying to be a smart arse, you know, but this anti-propaganda about the chilli is the cause of a lot of health problems in the world. Ever seen an obese Asian? 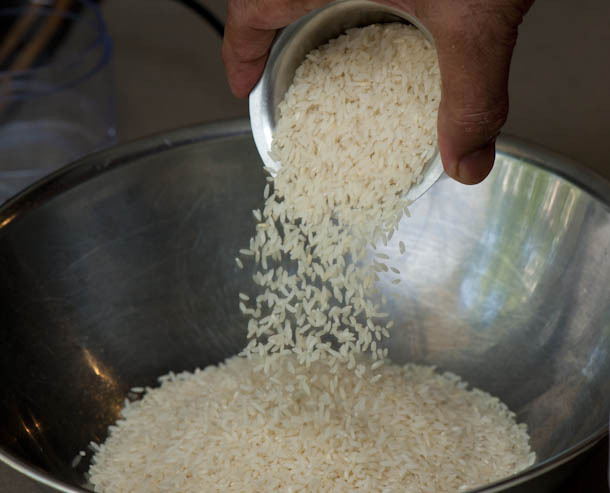 No, not really, I’m sure, even though they have rice for breakfast, brunch, lunch and dinner we really don’t see too many ‘heavyweights’ from this community because they eat chopped chillies – with the seeds, of course – soaked in soy sauce!! 2. When do you add the chilli? Well, it all depends on which chilli we’re using. 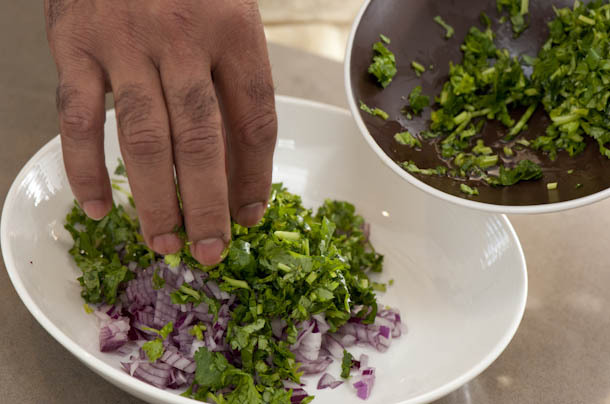 I believe a fresh chilli, whether it’s green, red, yellow or purple is like a fresh herb. 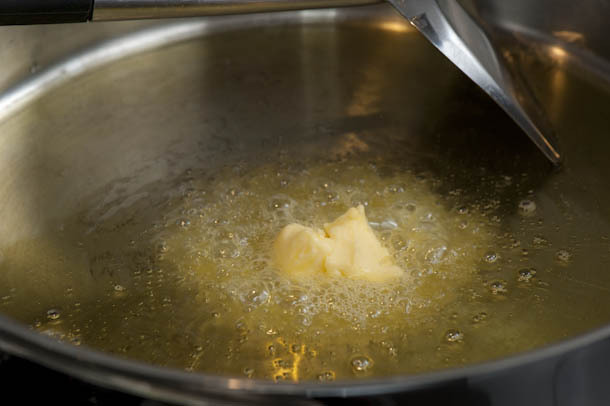 Don’t overcook it as you’ll lose all its goodness, so add it towards the end, or half-way through, your cooking. 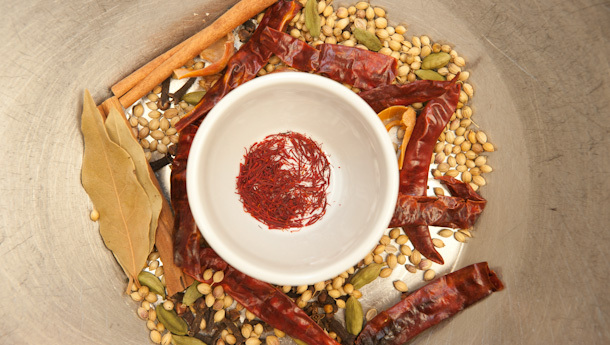 If the chilli is dry, however [which means it has no moisture in it], I would use it as a spice [because as the moisture starts to disappear from the fresh chilli its volatile oils start to appear which turns it more into a spice]. 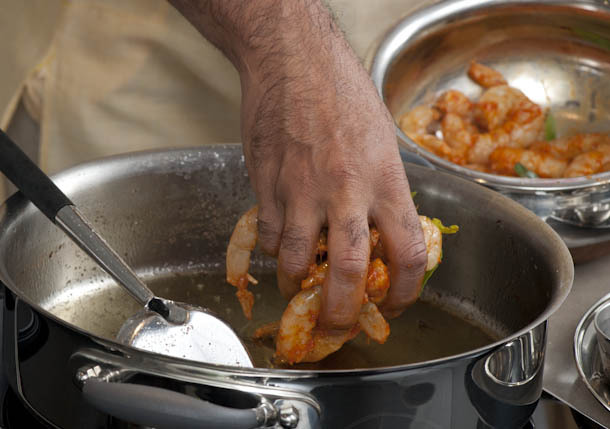 When cooking with dry chillies, I generally heat the oil till it starts to smoke, then add the dry chillies and immediately remove the pan from the heat and watch them ‘balloon’ which creates an aromatic oil and then I proceed with the rest of the recipe. 3. 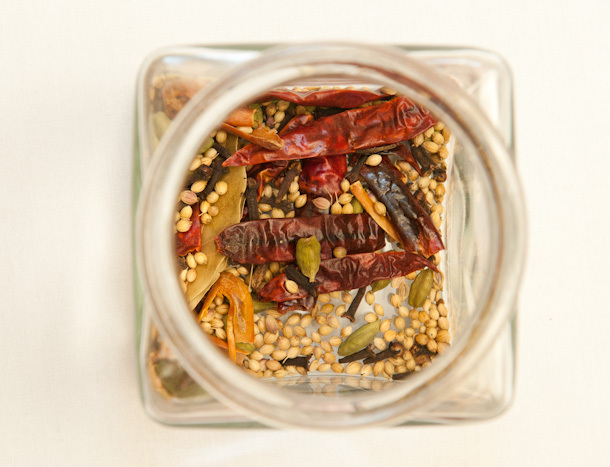 How do I add the chillies – do I cut them, keep them whole, chop them or. . .? Another great question that often confuses people. I believe the more surface area that comes in contact with the medium, the greater the ‘zing’. 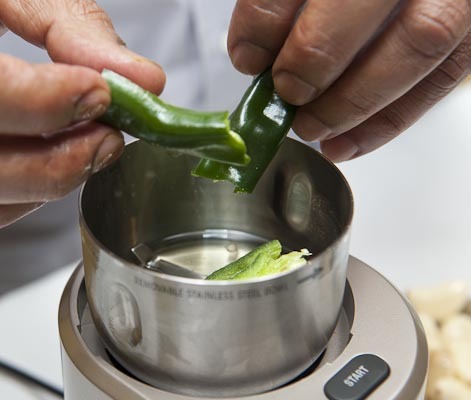 This means that if you keep the chilli whole, you expose less surface area and get less ‘zing’; chop it up, you expose more surface area and you get more ‘zing’. Are you getting the idea? It’s simple!! I like to keep a good balance of both, or else you end up with ‘rocket fuel’ that does nothing more than burn. 4. 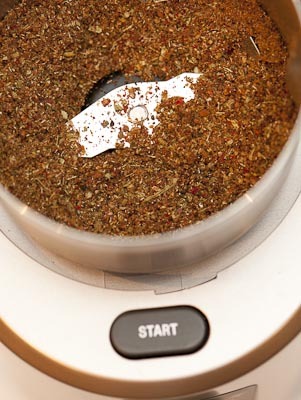 When do you add pepper? 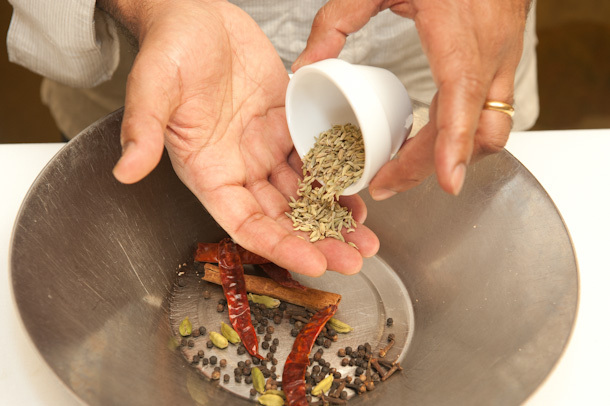 The amazing thing about pepper is that you can add it at any stage of cooking, it depends on what you want. 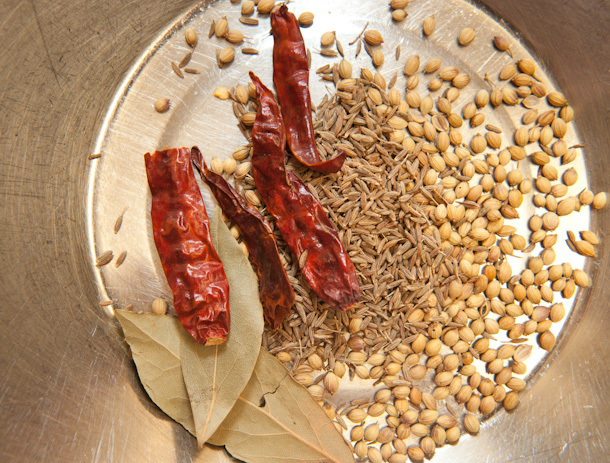 You can start a dish by crackling black pepper, like we do in nilgiri’s when we make andhra chicken pulao; when you add the pepper at the start of the cooking process, the pungency of the pepper is increased as it permeates into the meat; or you can add it during the cooking process like in chicken chettinad, or towards the end of cooking a dish as in a poondu rasam when we add it during the tempering process which means it becomes more ‘superficial’, more like a garnish. 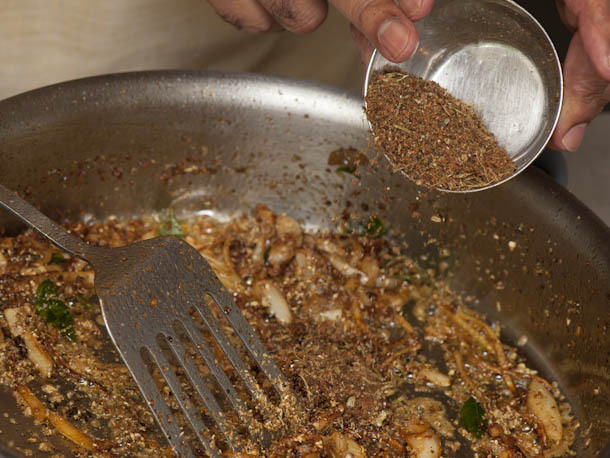 Adding pepper onto our meal is, of course, something we’re all familiar with. 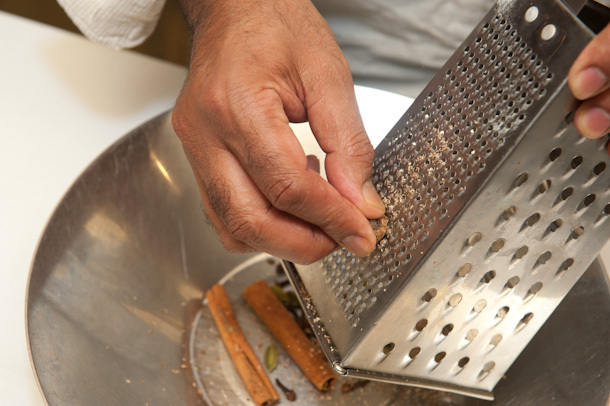 We also grind it onto our soups, for example, to get that extra ‘zing’, just like my dad used to do onto his tomato soup every time I made it for him – a long, long time ago! 5. 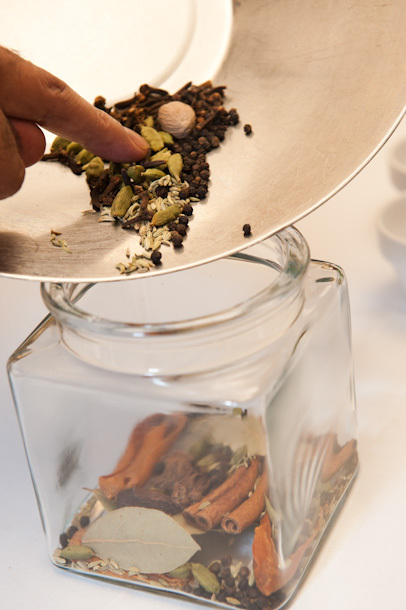 What are the best peppercorns (red, green, black etc. . .)? 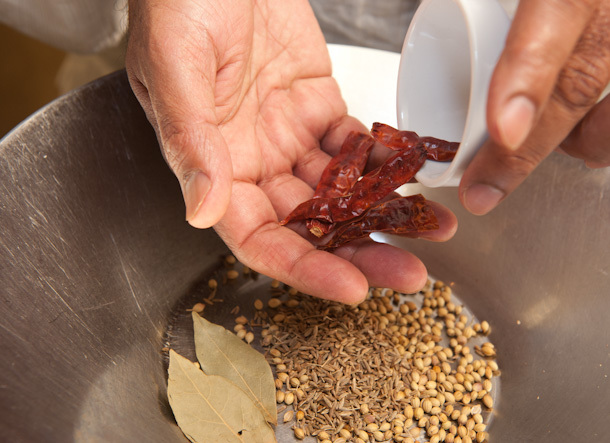 In Indian cooking green and red peppercorns are not commonly used. 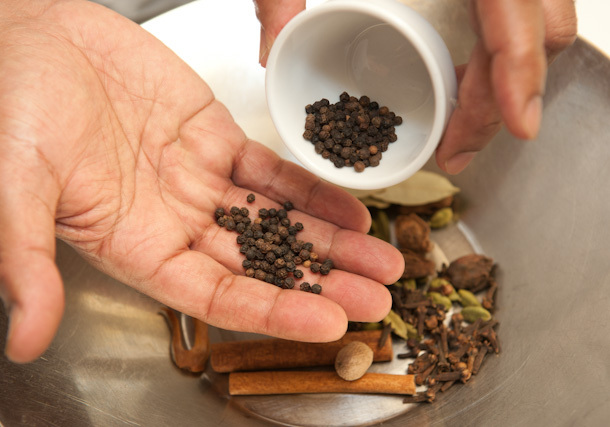 Black pepper (a.k.a the king of spices) comes from the South of India and in fact the best pepper comes from the region of Tellicherry in Kerala. 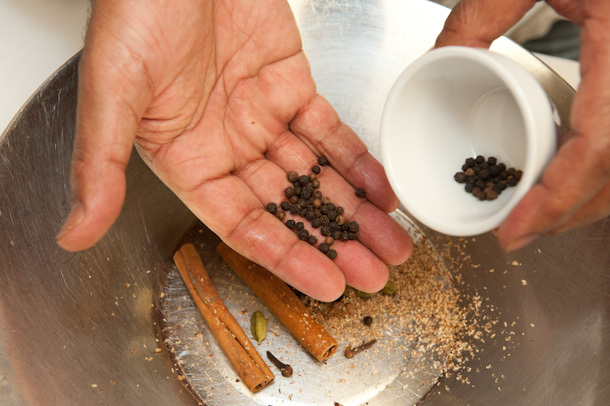 White pepper tends to be more pungent than black pepper and hence is used in smaller quantities. 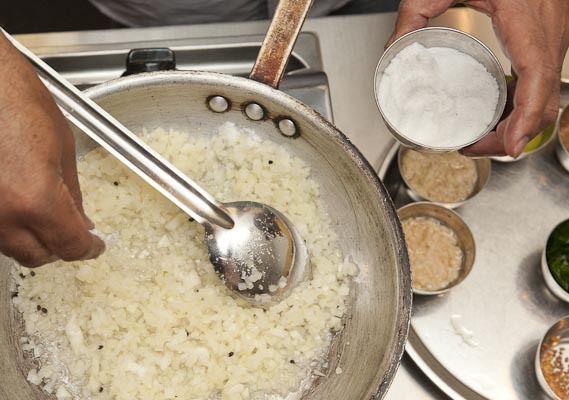 White pepper is added to kebabs and tikkas to keep them looking bright and fresh, like in reshmi kebab. Unfortunately that’s all I have time for this week, folks. There are lots more things to say on this ‘burning’ topic. So, until next week as always, happy cooking and remember that not one single person has died eating chillies, except for that so-called ‘chef’ in England who ate around 45 chillies one night to impress his girlfriend. He never woke up! The id..t ate dry chillies!! May his soul R.I.P!!! 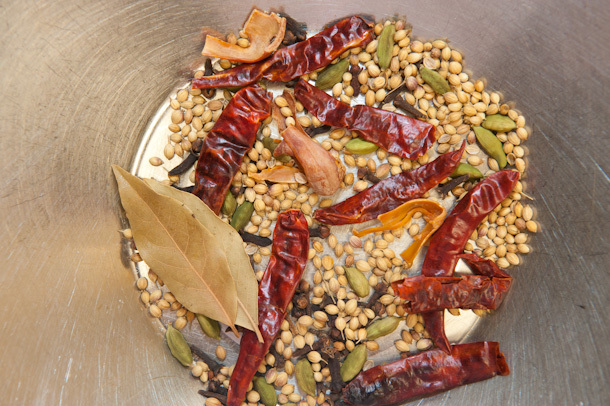 Click mirchi ka salan recipe for a recipe which uses fresh banana chillies (which aren’t too hot so they’re a good introduction to keeping those seeds in your chillies when you cook them!). Be careful when you buy banana chillies that you don’t buy their hotter Hungarian siblings by mistake! 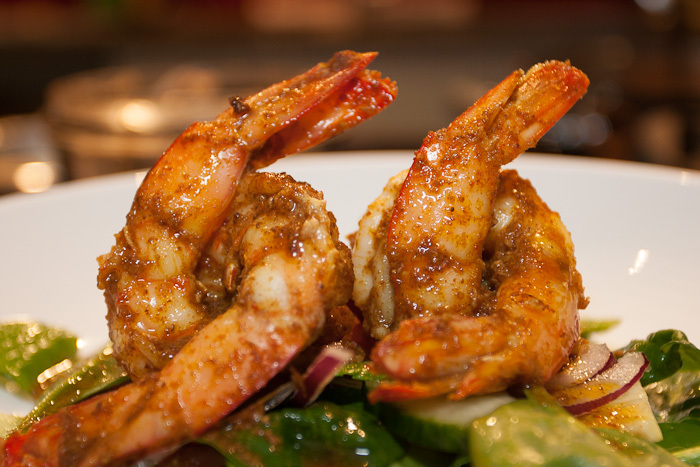 Click prawn balchao recipe for another delicious recipe which uses dried chillies. 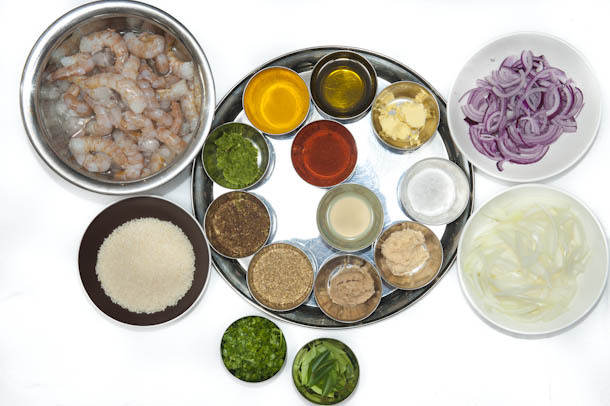 Posted in Classic meals, Cooking, prawn, vegetarian and tagged black pepper, chili, chilipepper, mirapakaya, mirch, mirchi, mirey, pepper, white pepper. Bookmark the permalink.